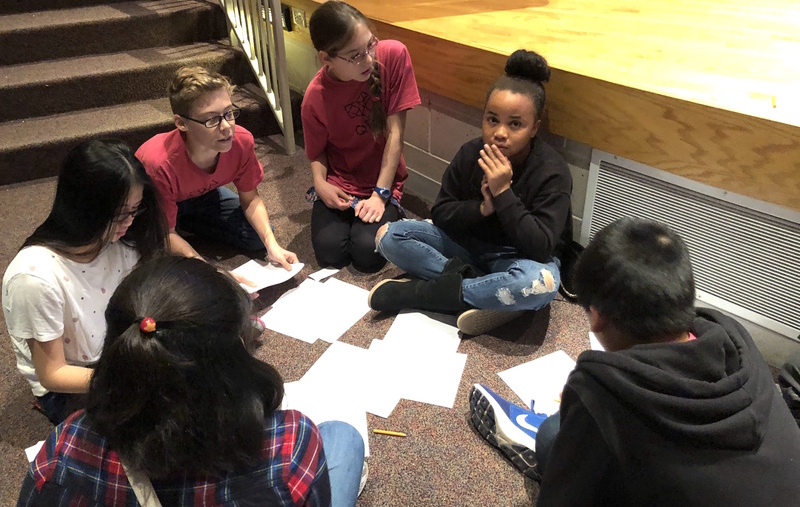 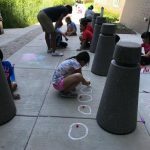 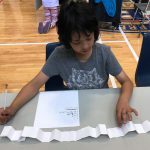 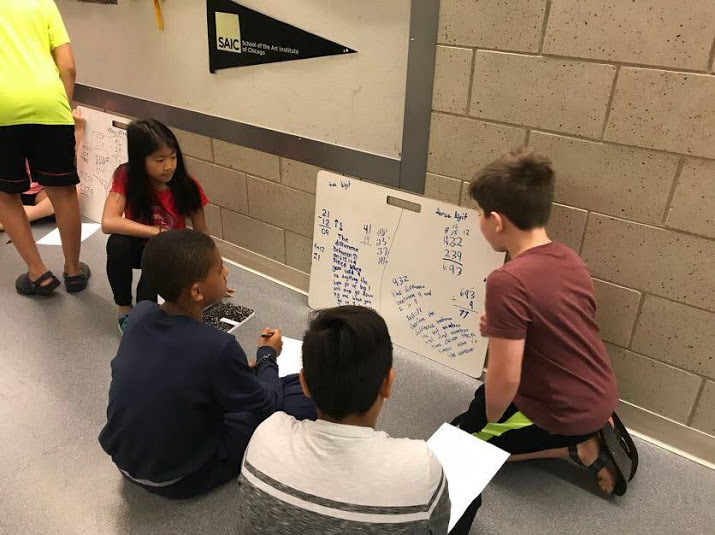 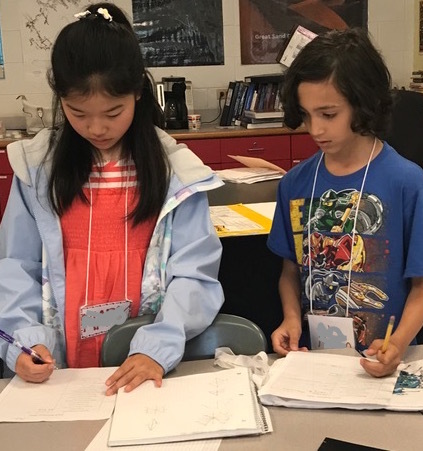 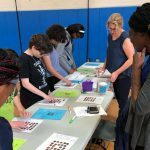 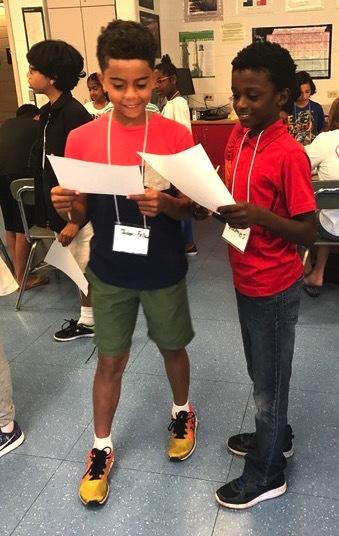 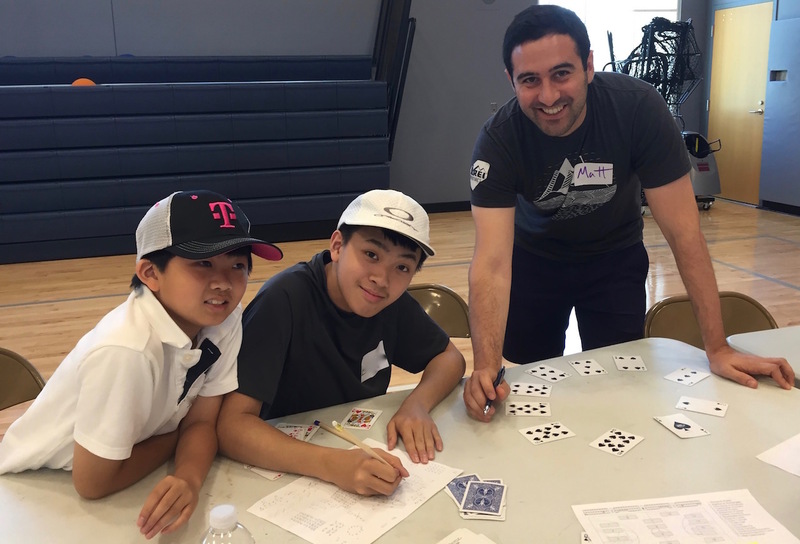 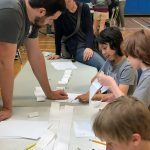 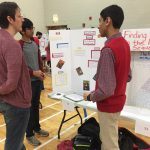 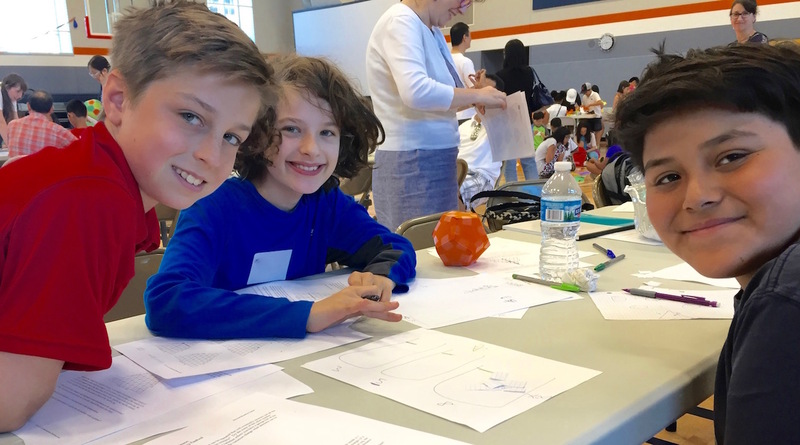 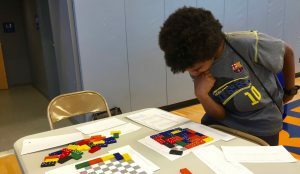 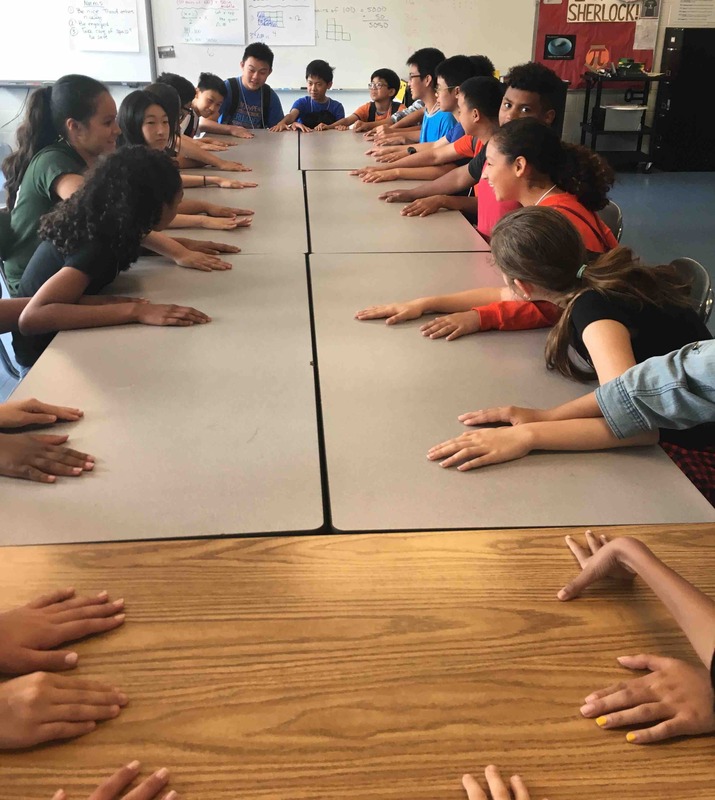 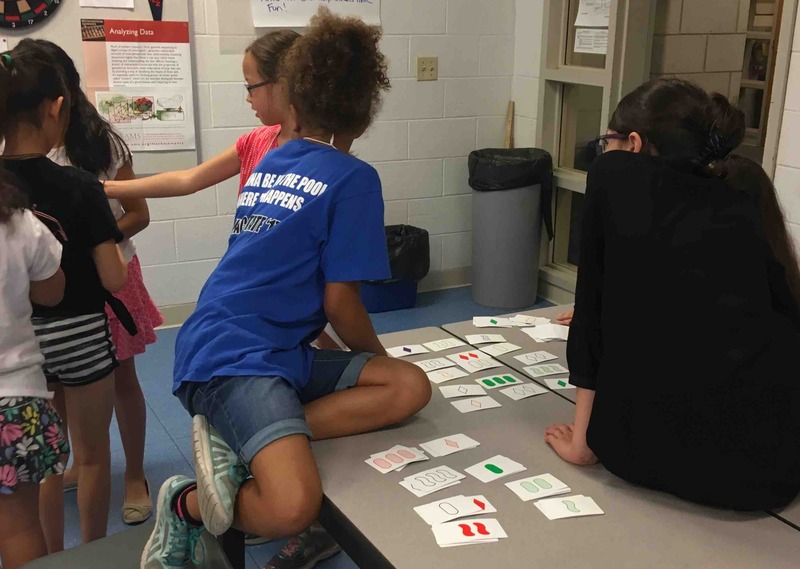 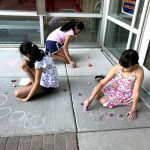 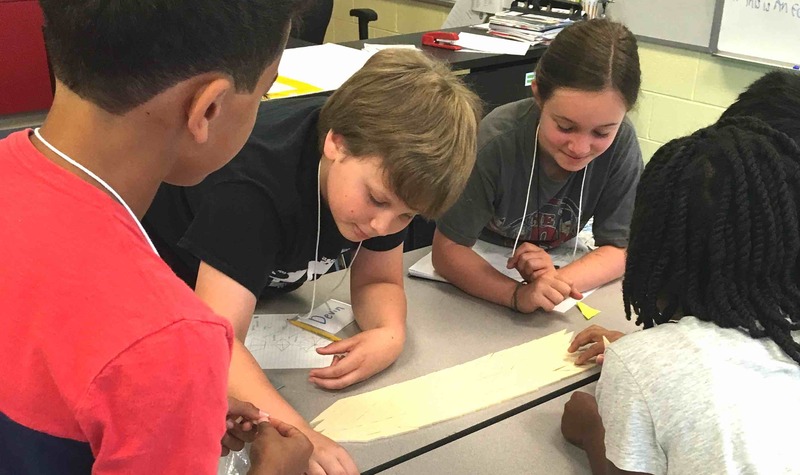 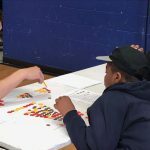 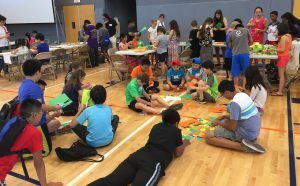 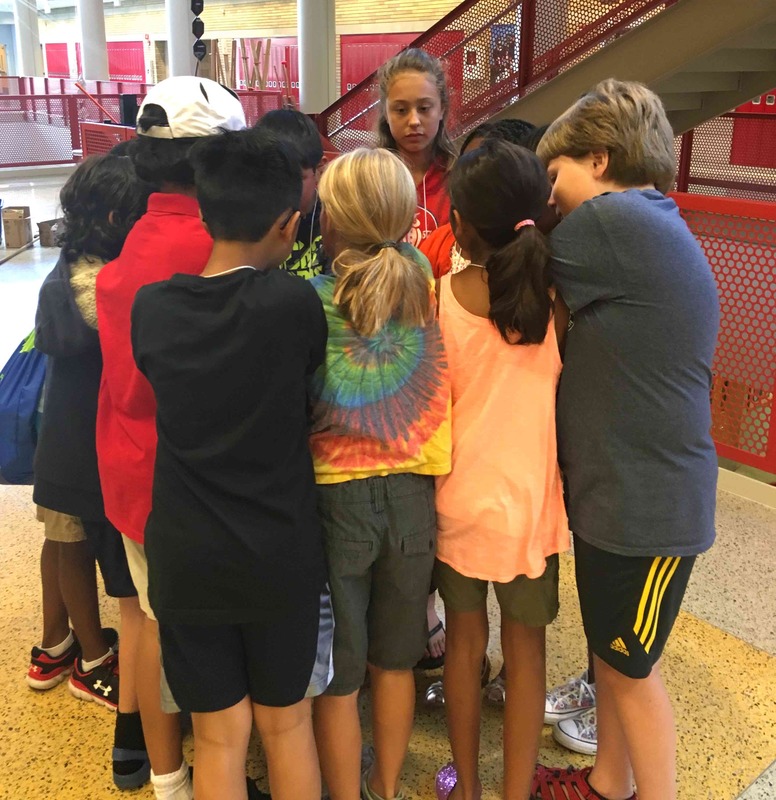 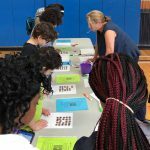 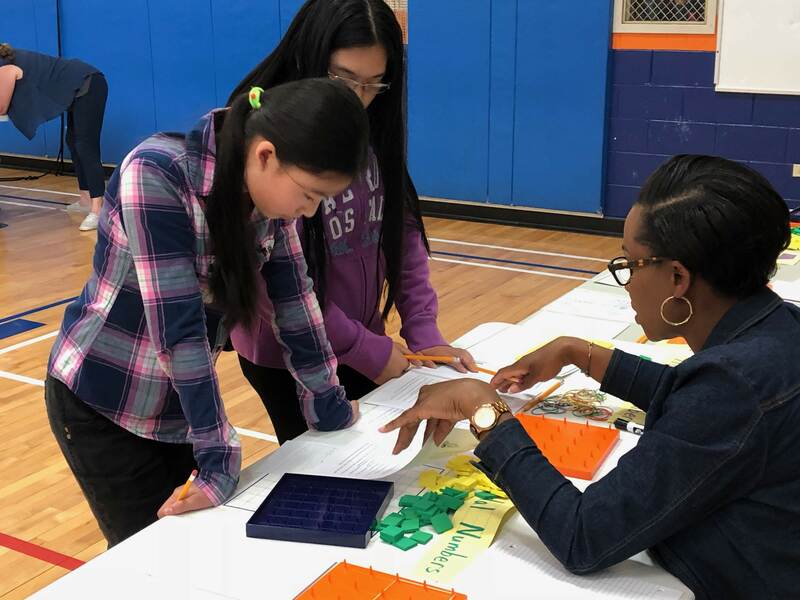 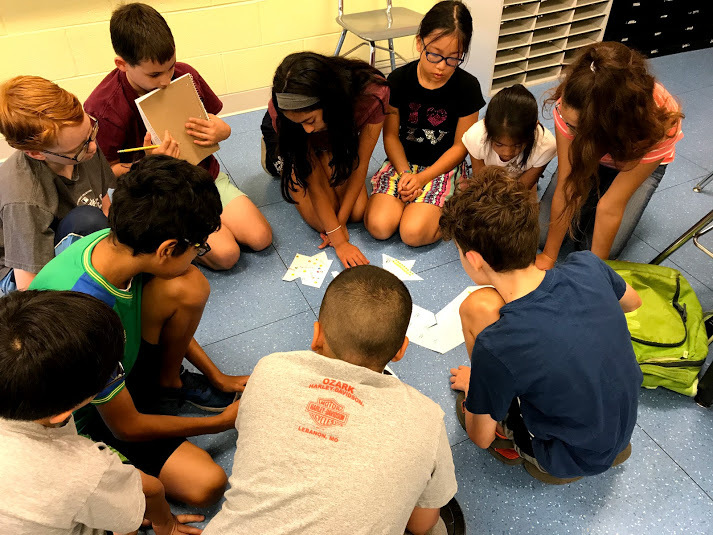 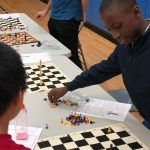 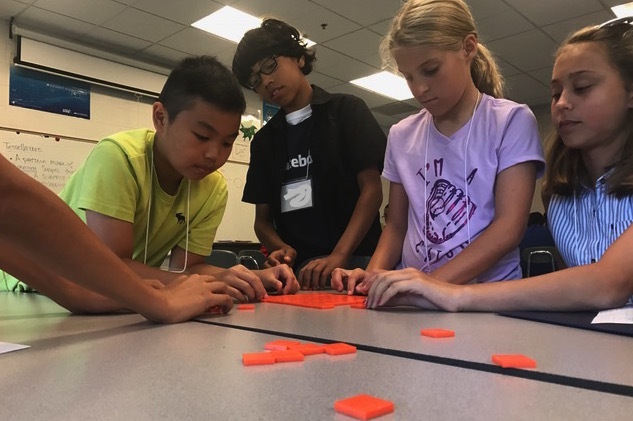 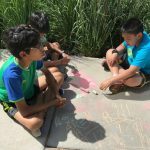 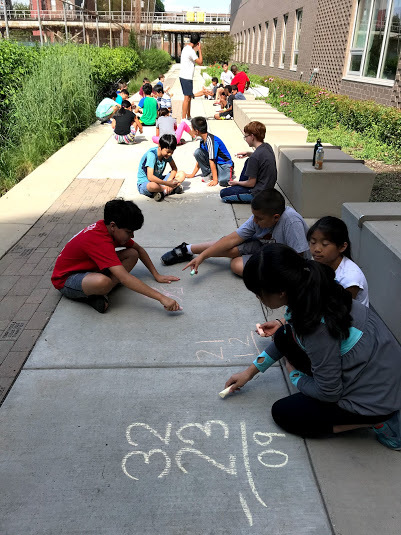 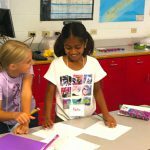 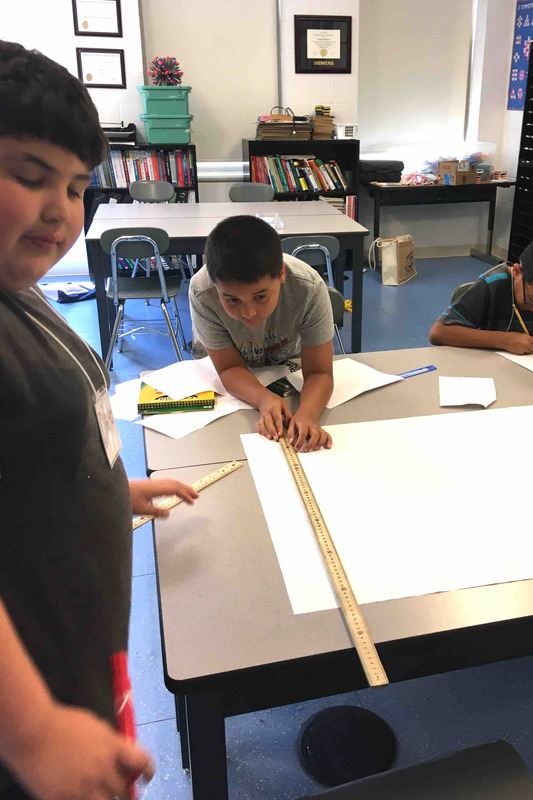 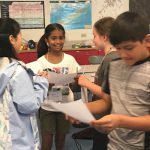 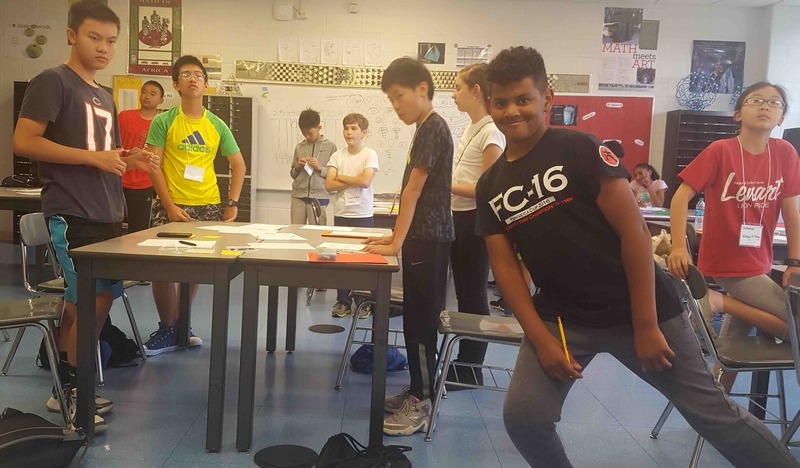 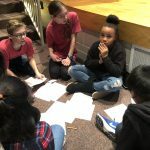 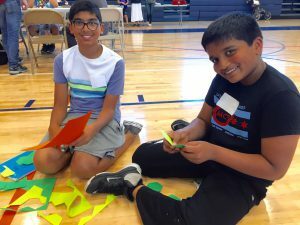 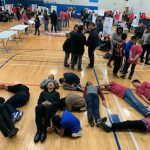 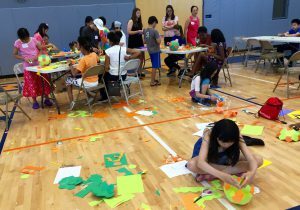 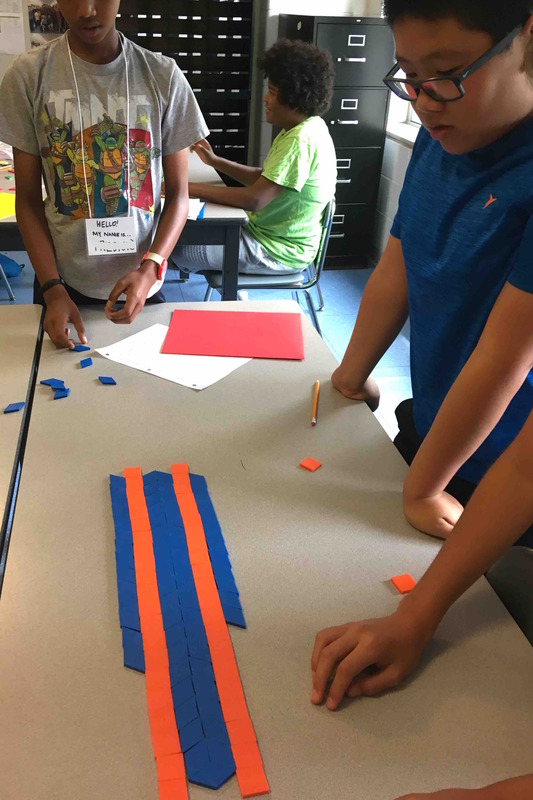 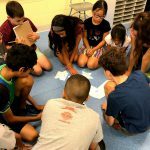 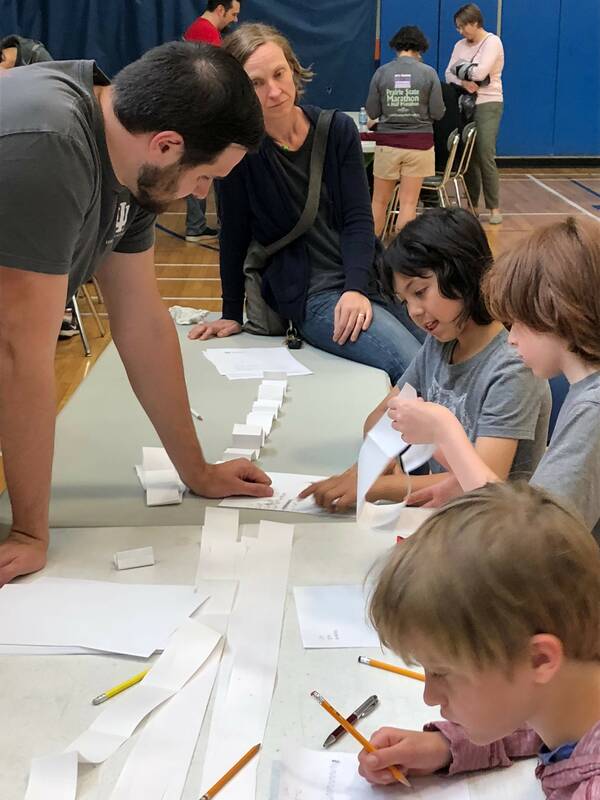 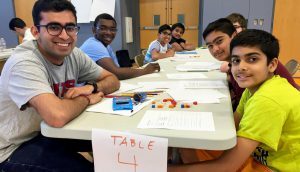 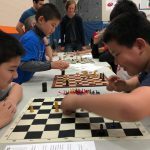 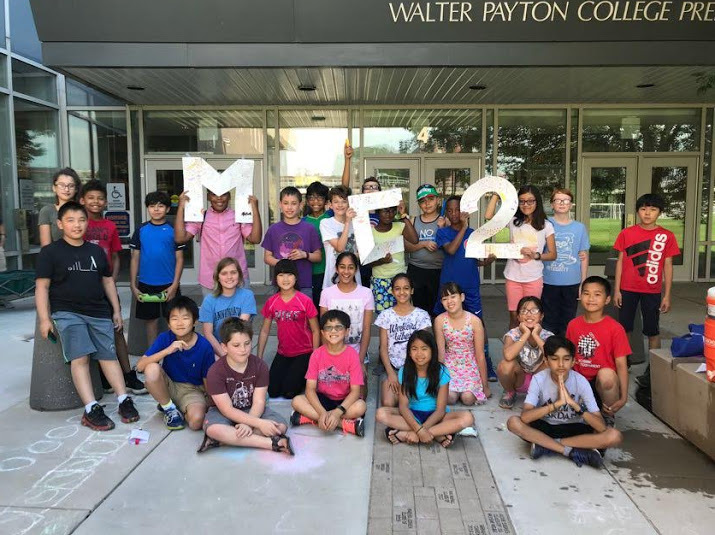 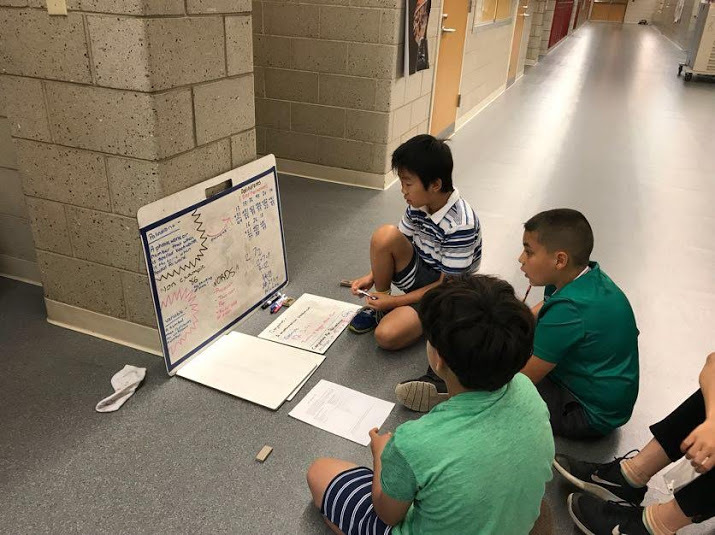 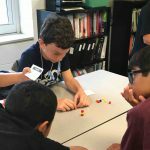 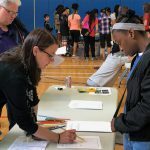 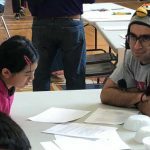 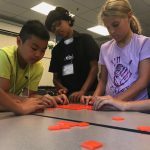 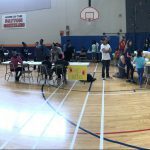 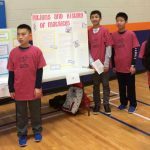 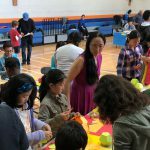 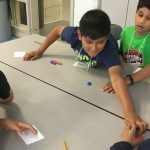 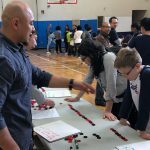 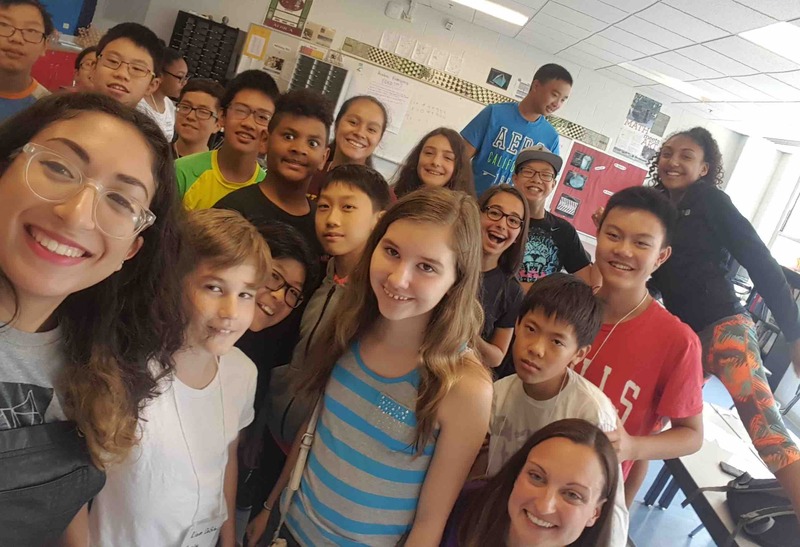 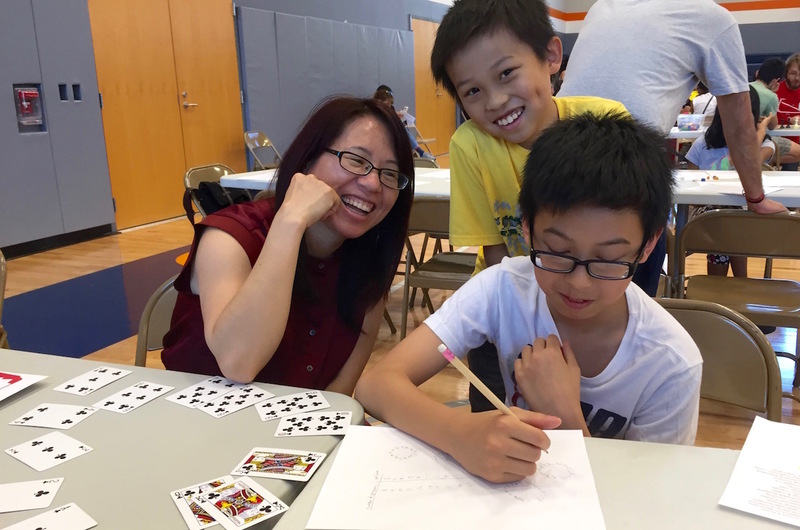 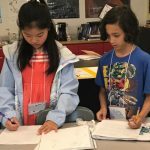 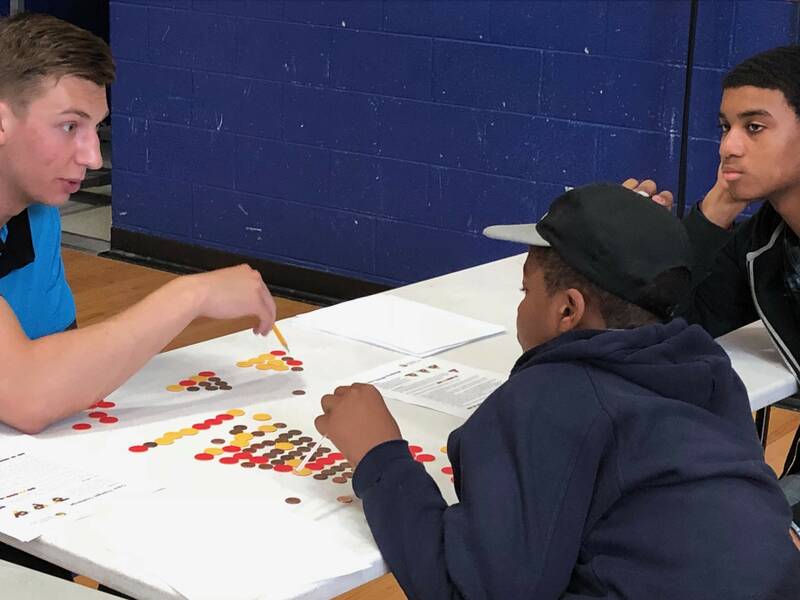 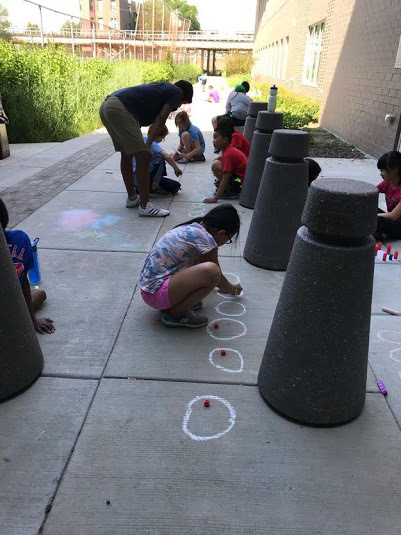 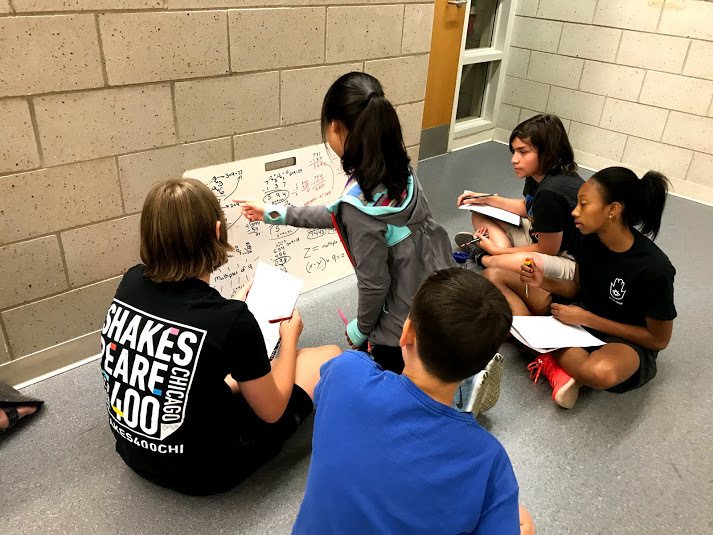 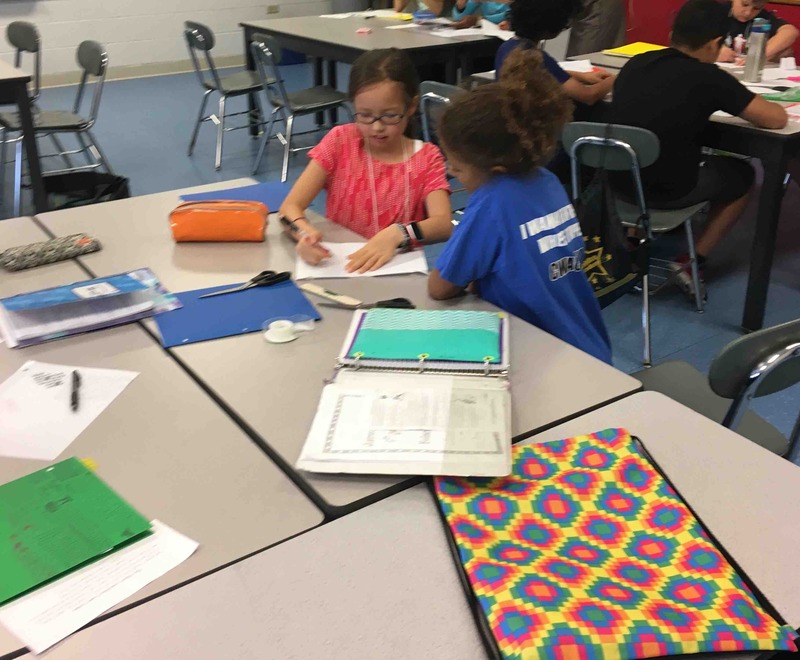 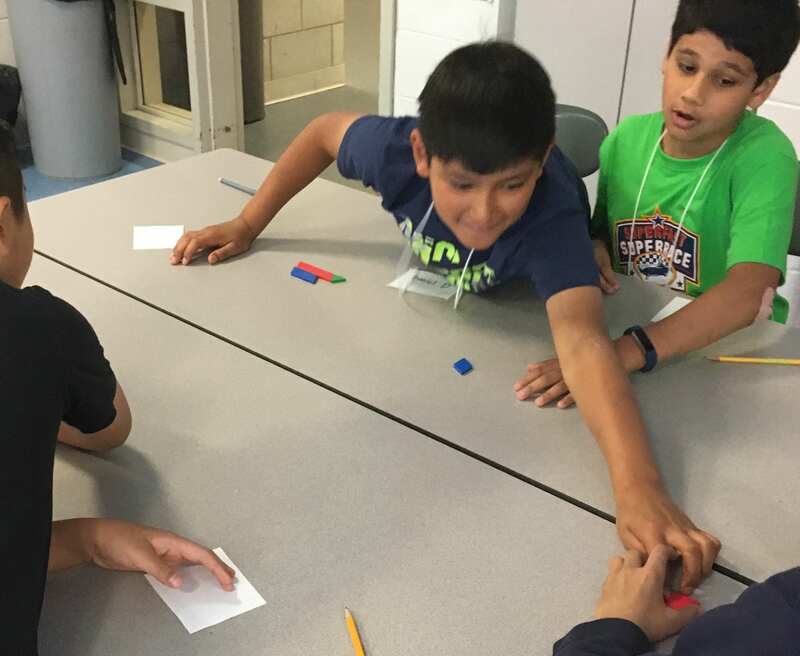 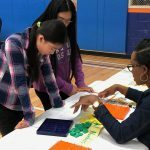 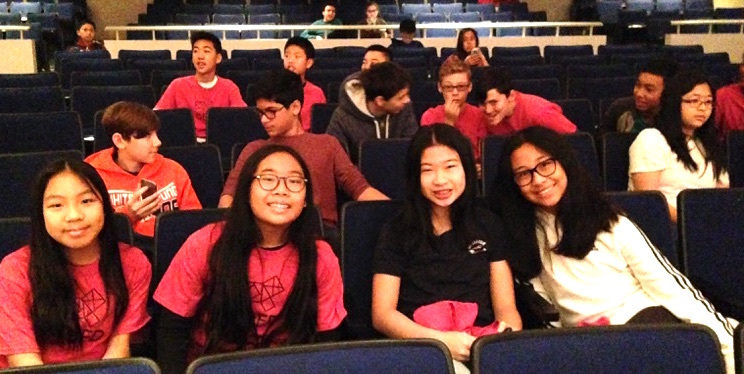 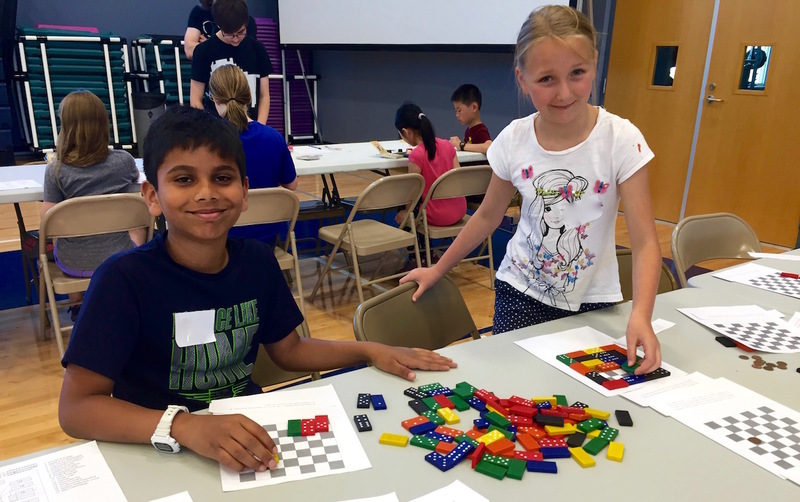 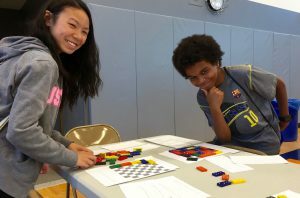 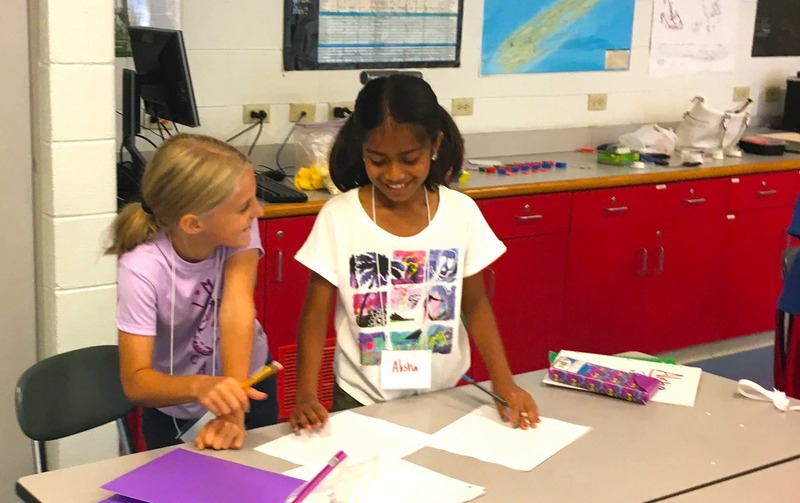 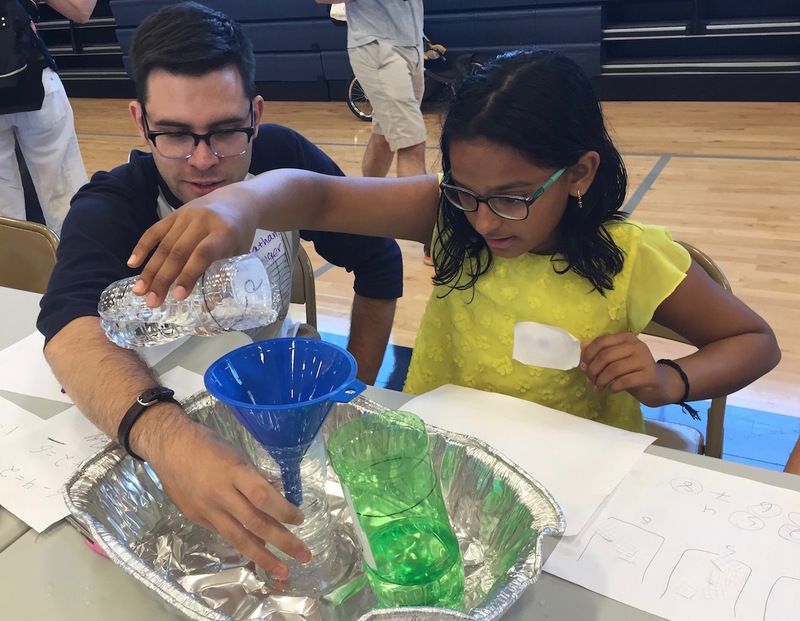 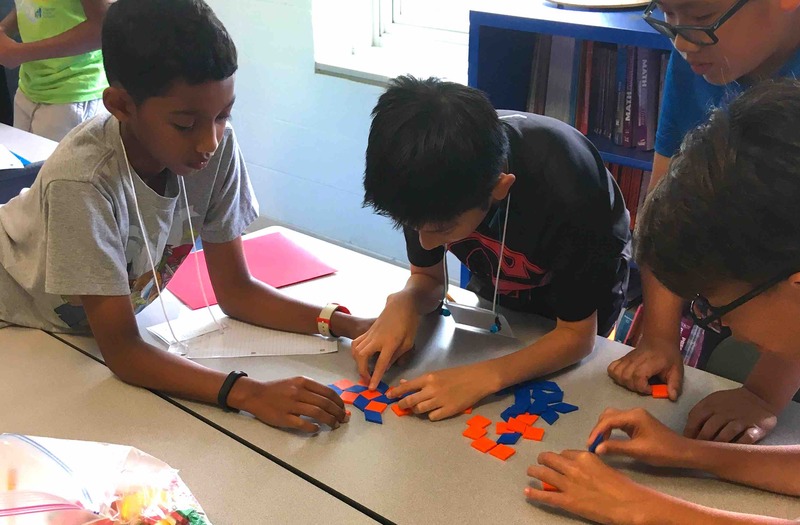 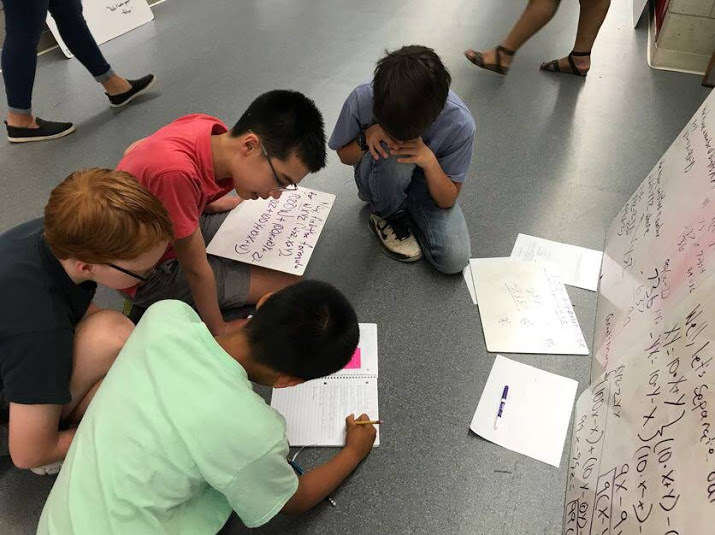 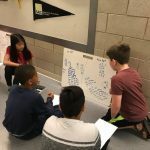 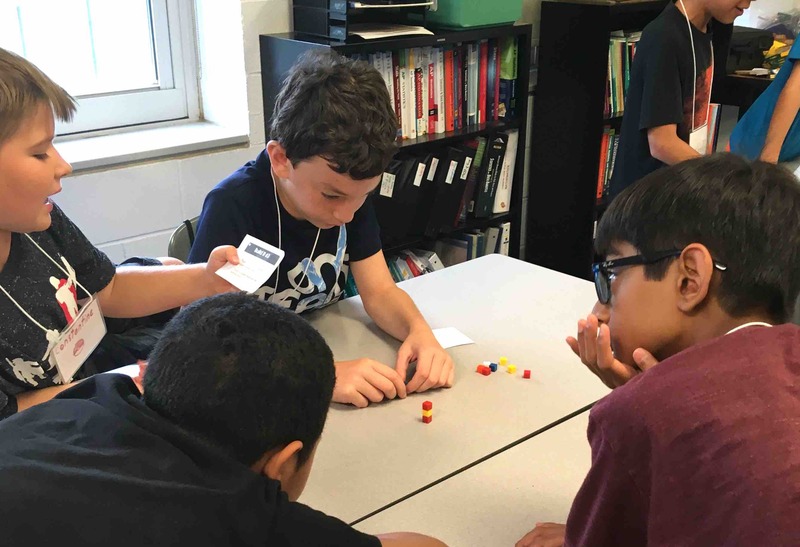 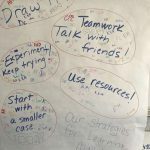 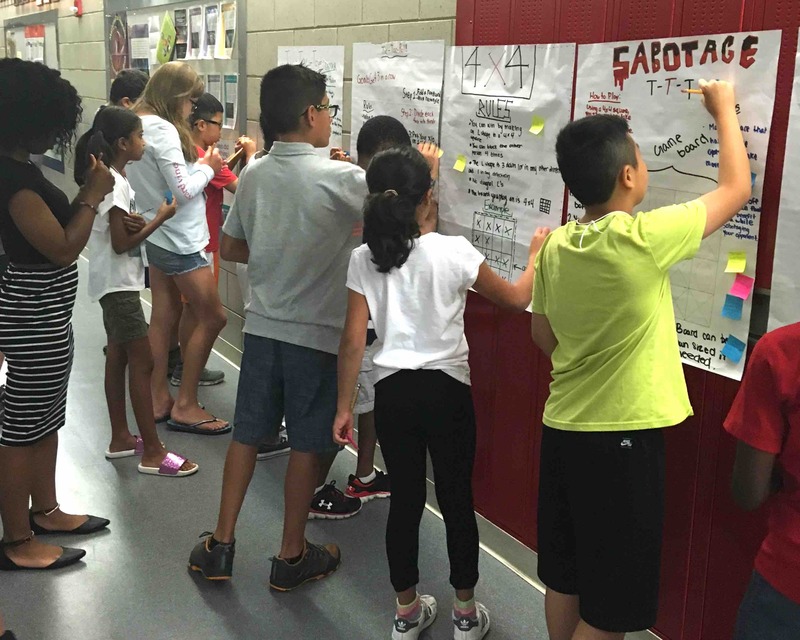 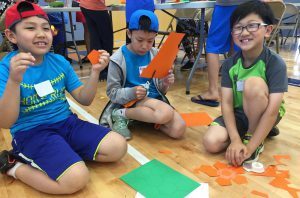 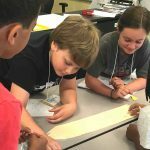 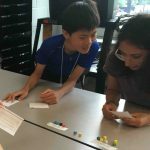 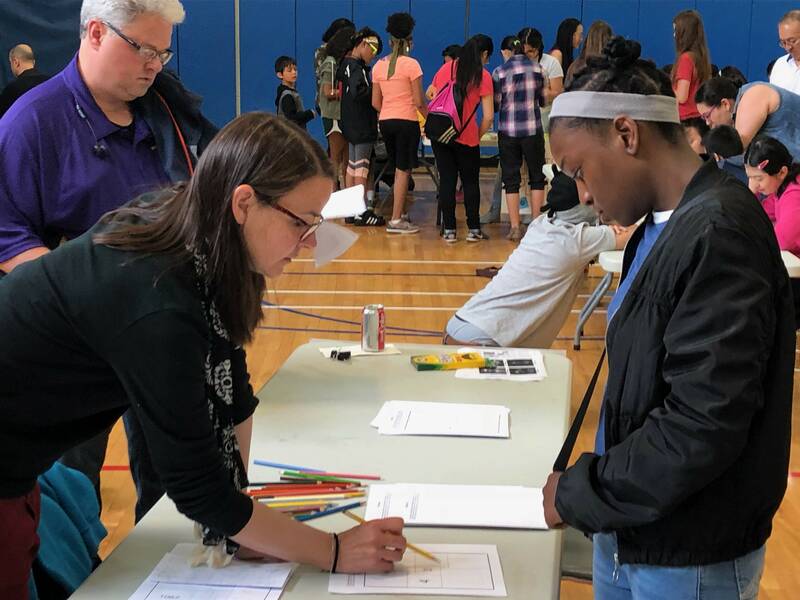 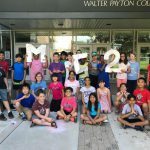 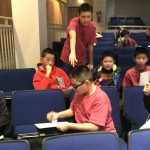 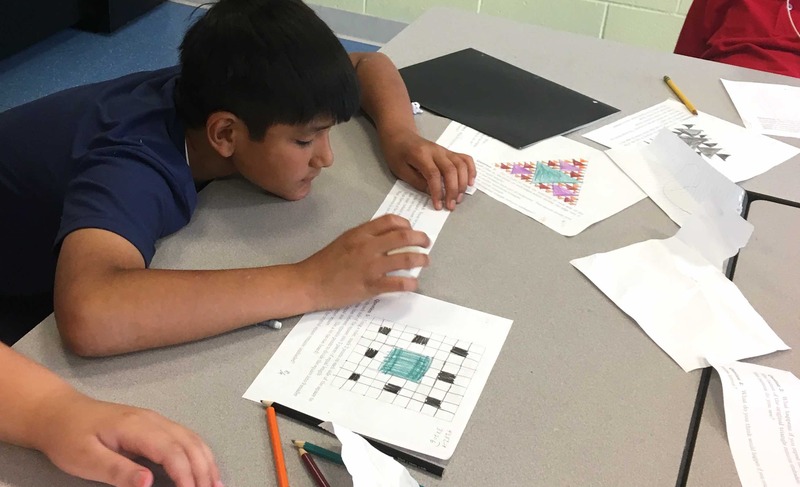 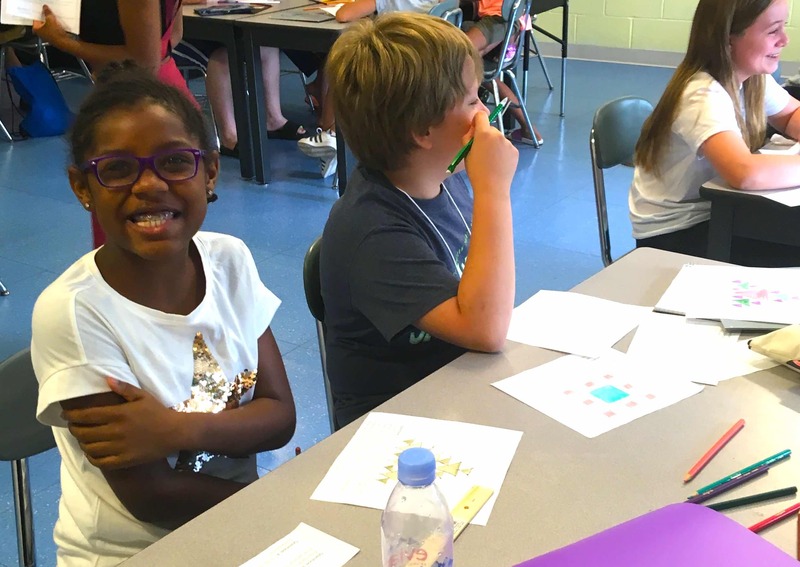 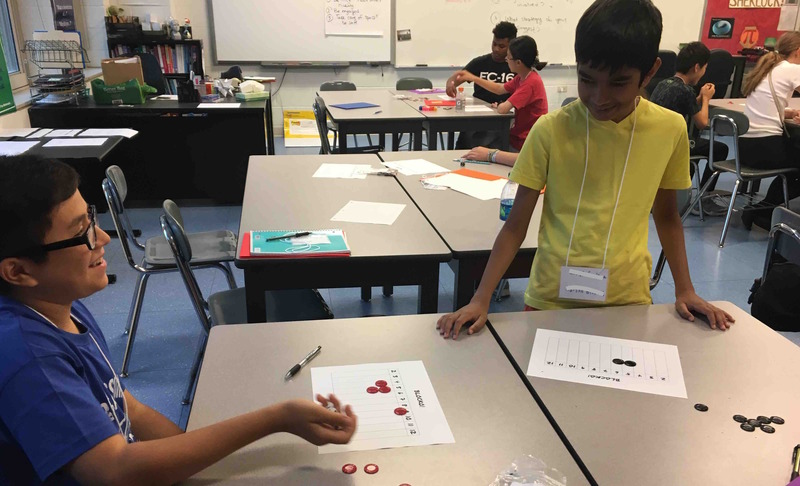 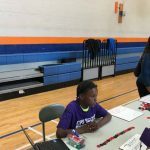 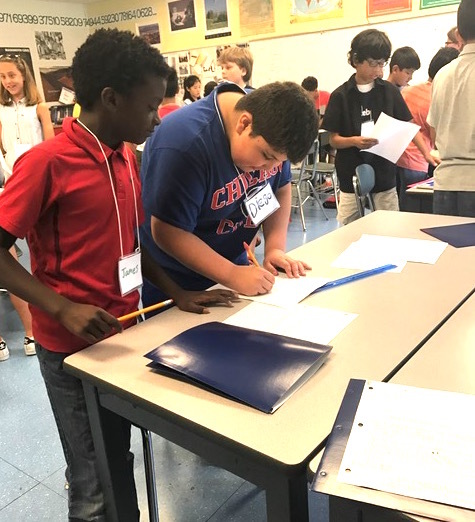 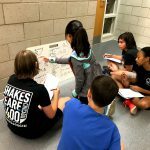 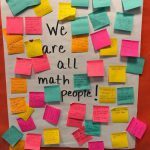 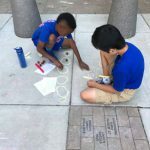 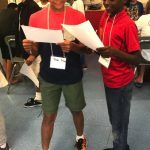 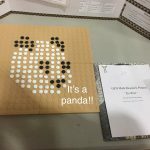 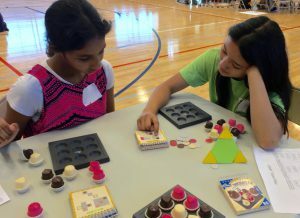 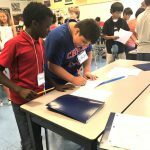 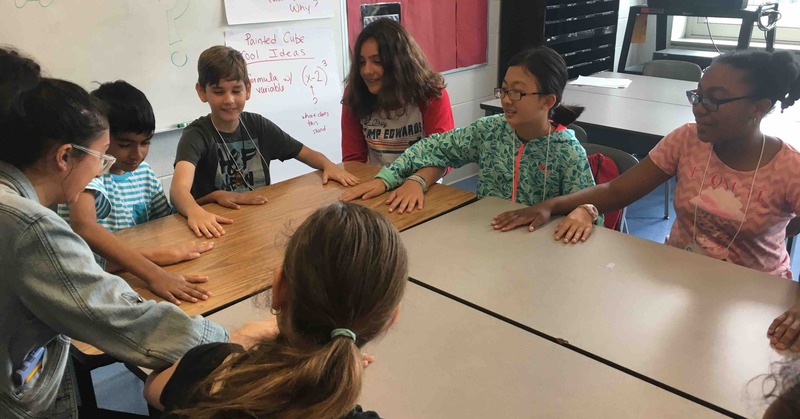 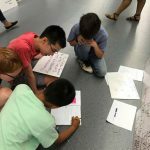 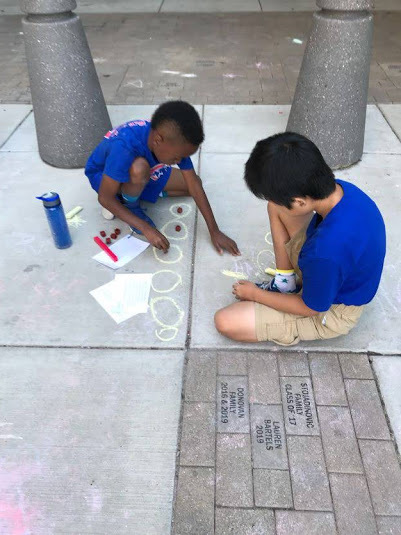 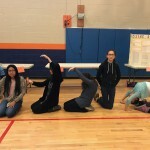 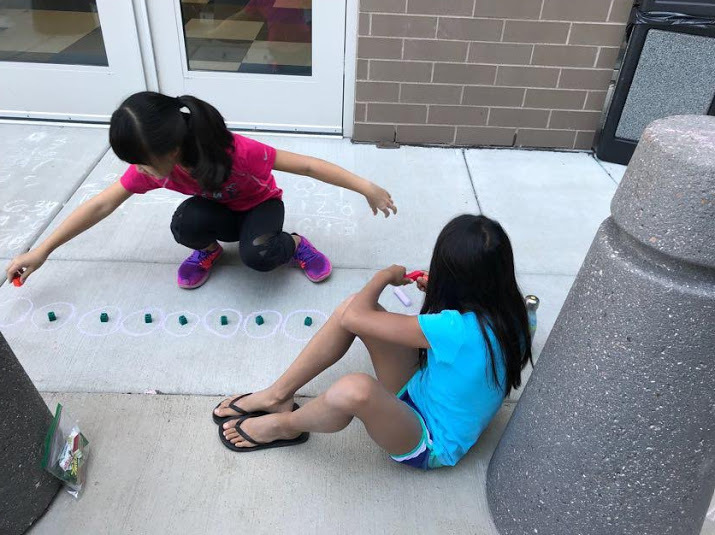 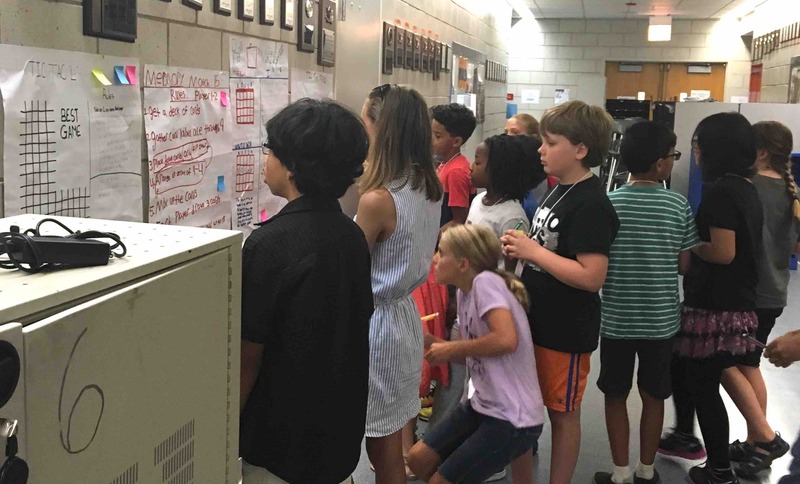 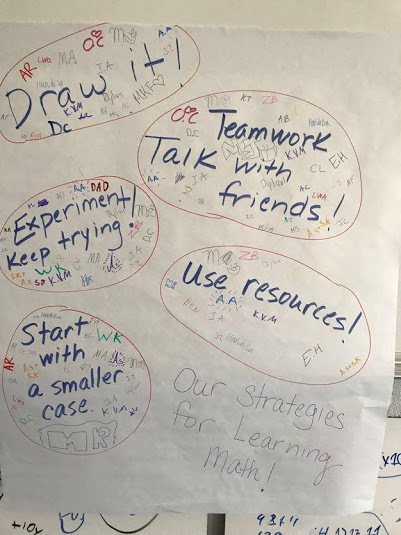 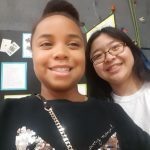 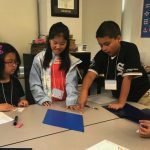 MC2’s first Julia Robinson Math Festival was held on June 10th, 2017. 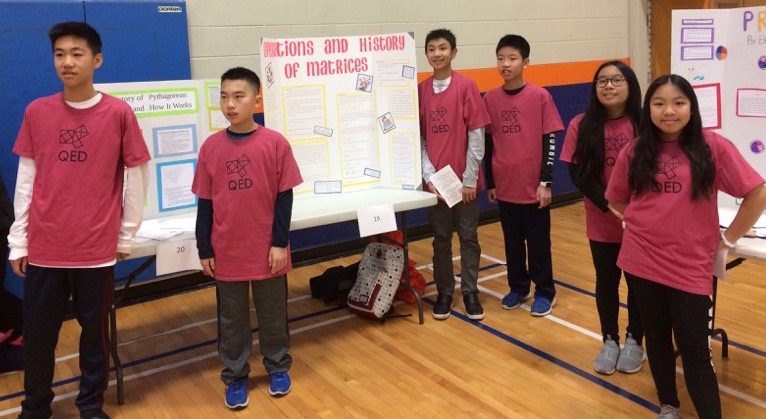 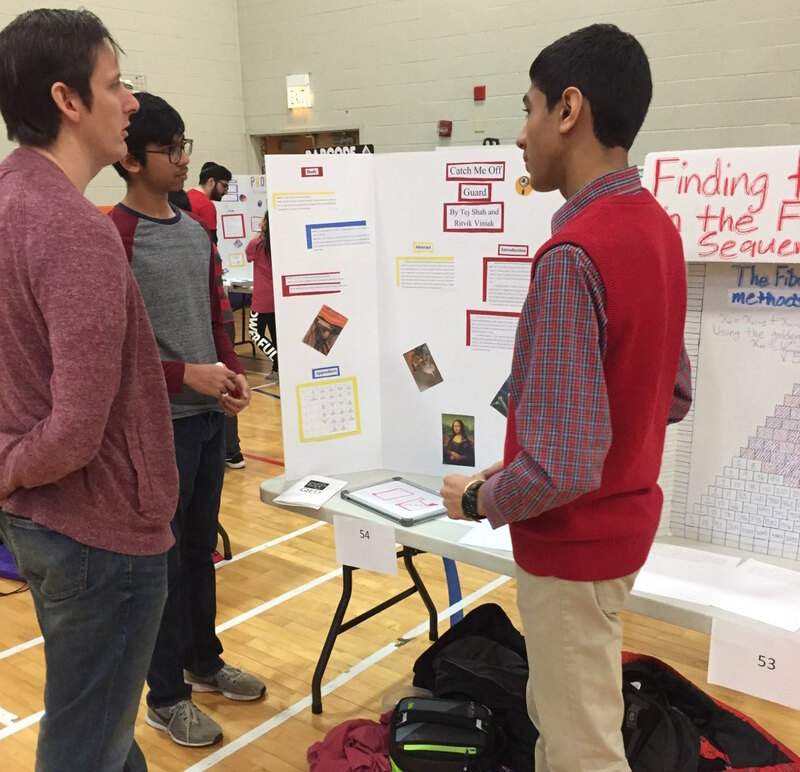 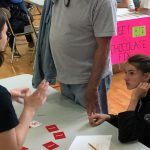 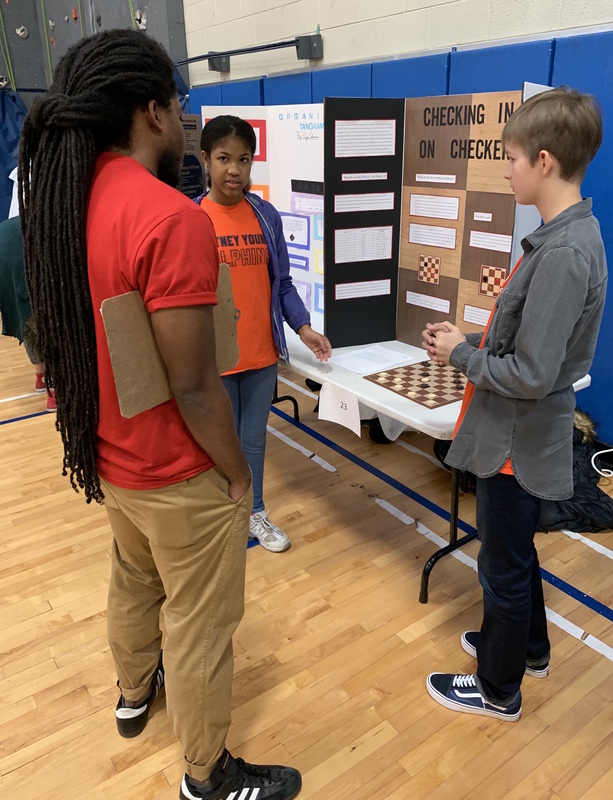 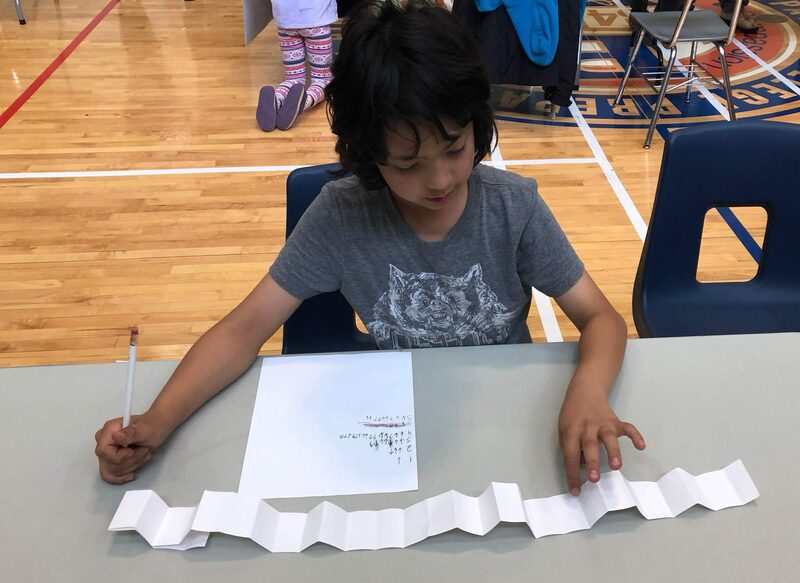 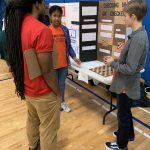 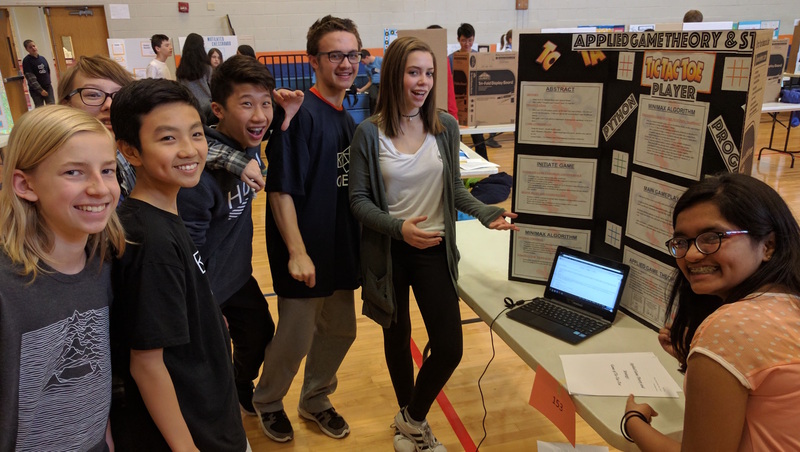 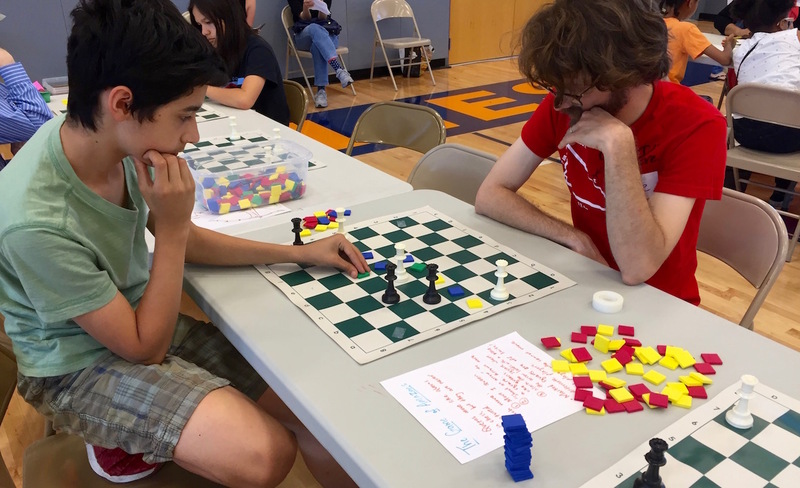 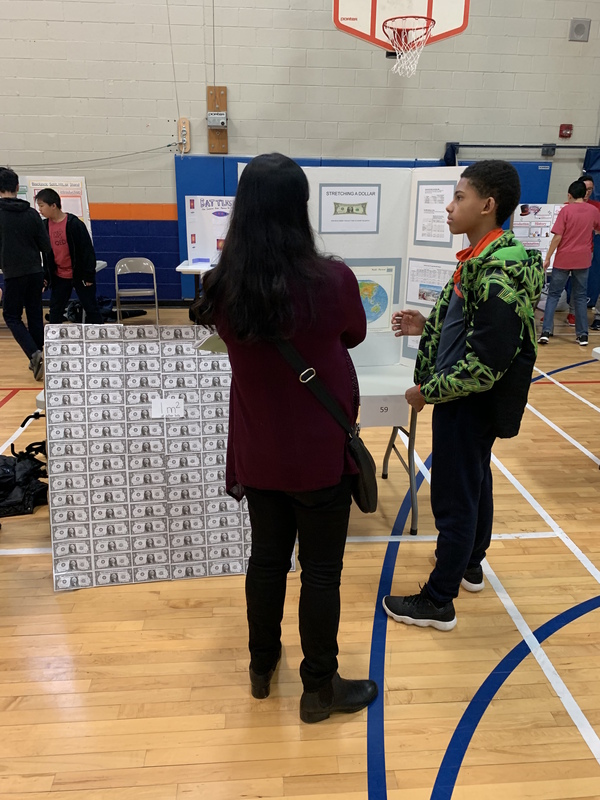 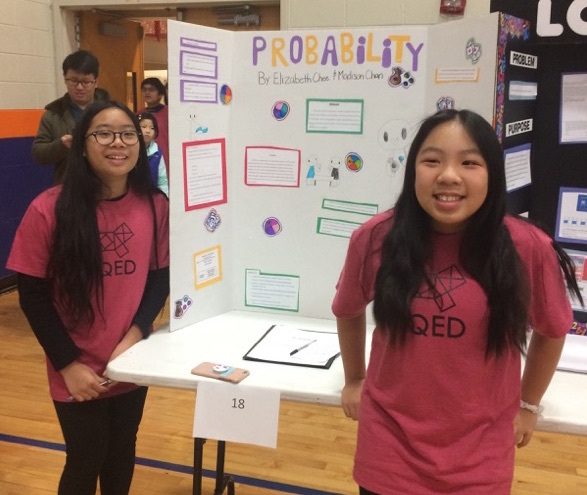 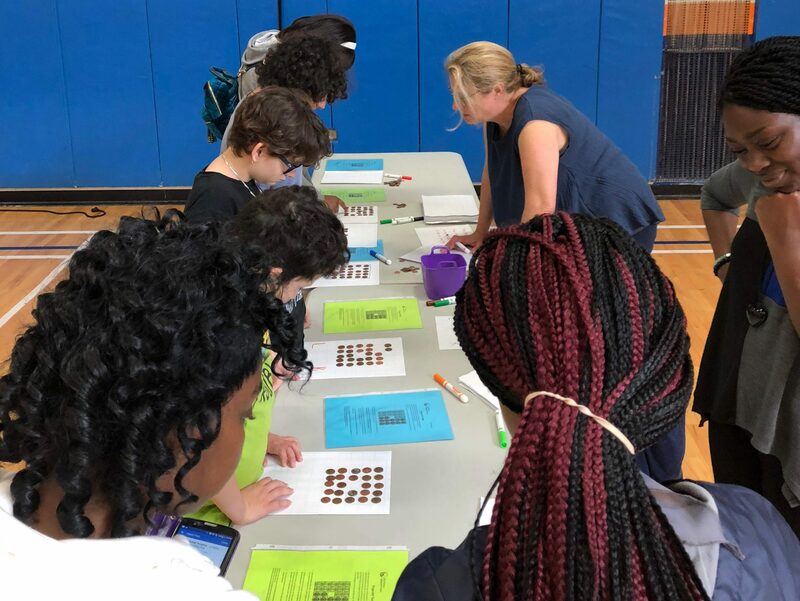 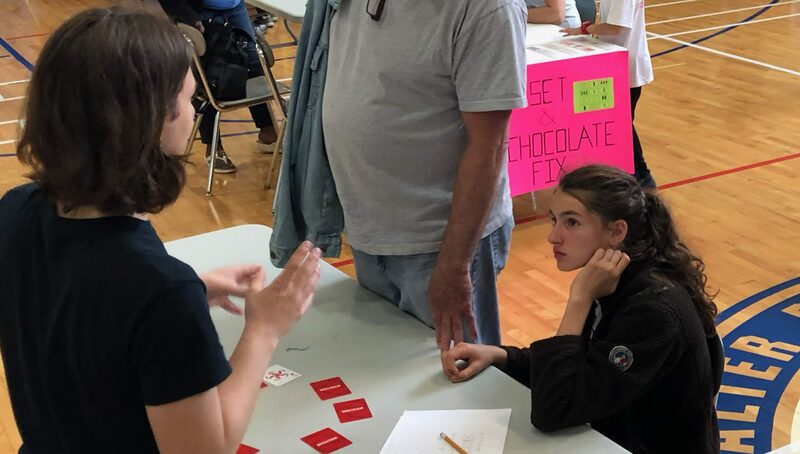 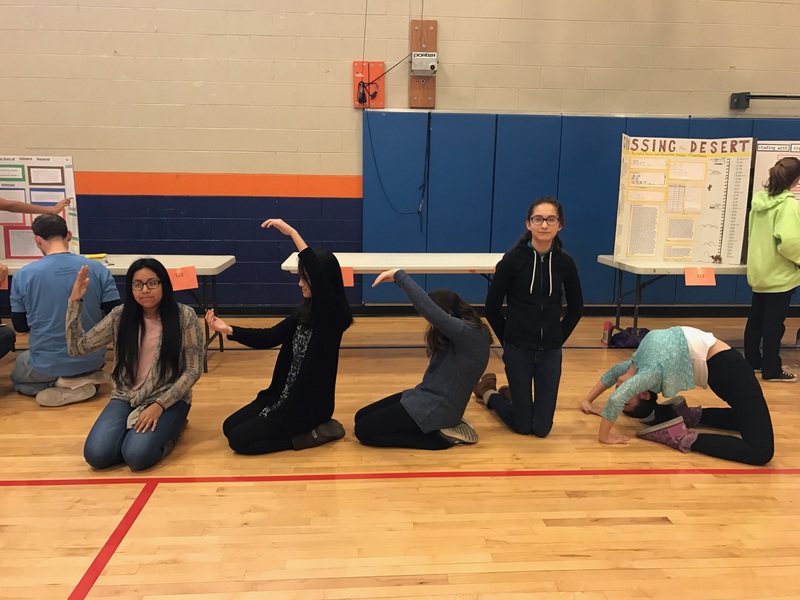 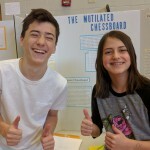 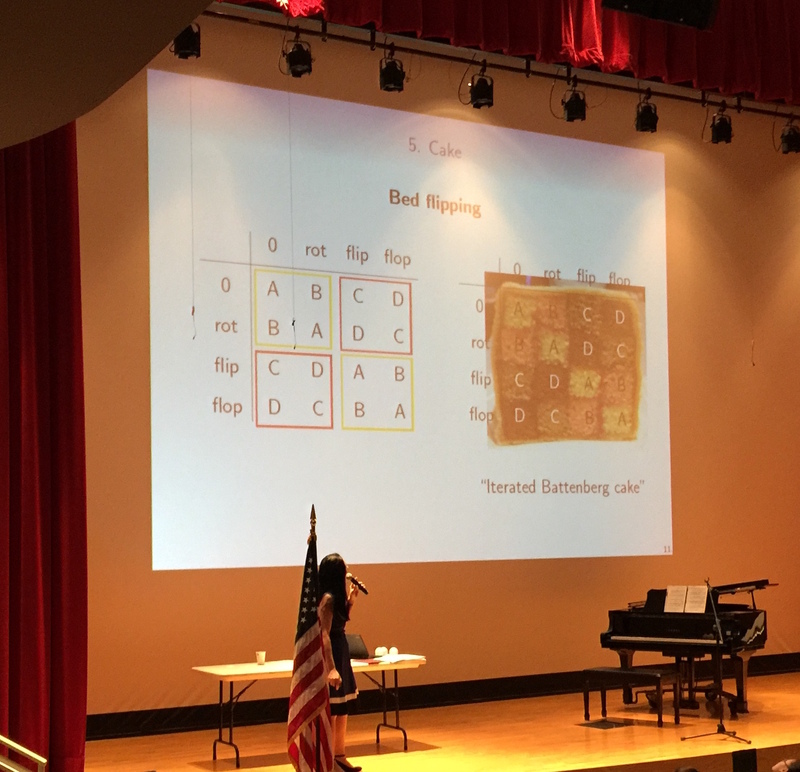 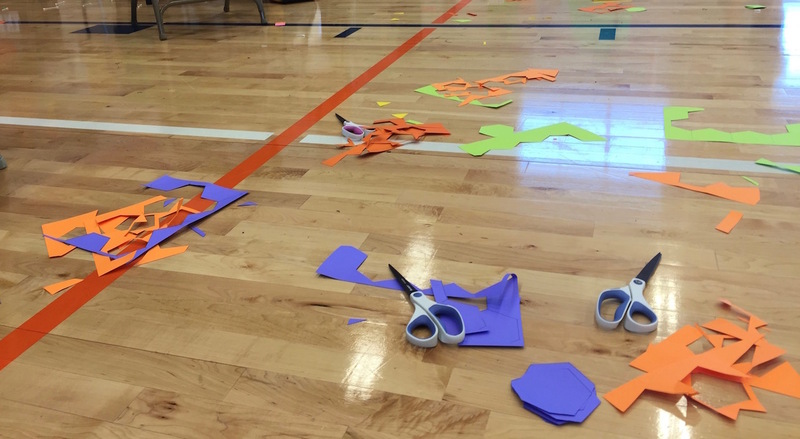 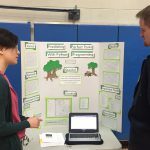 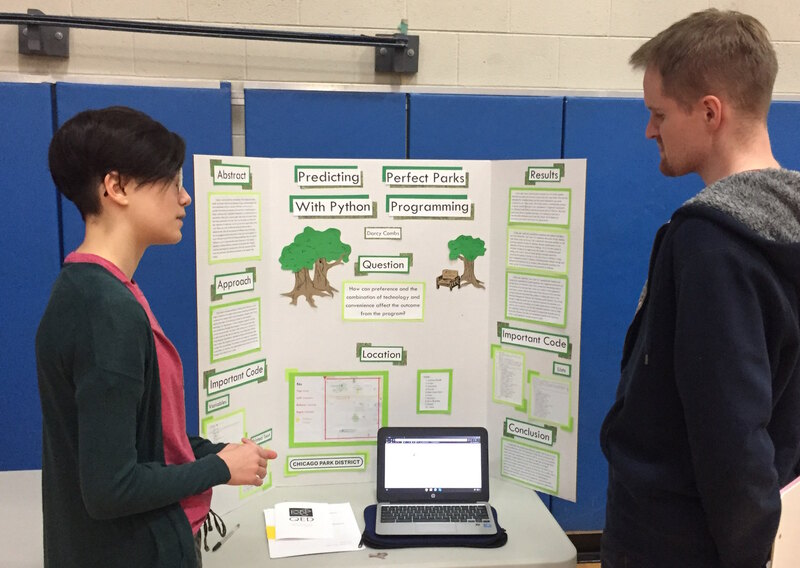 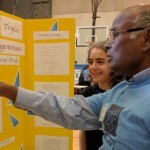 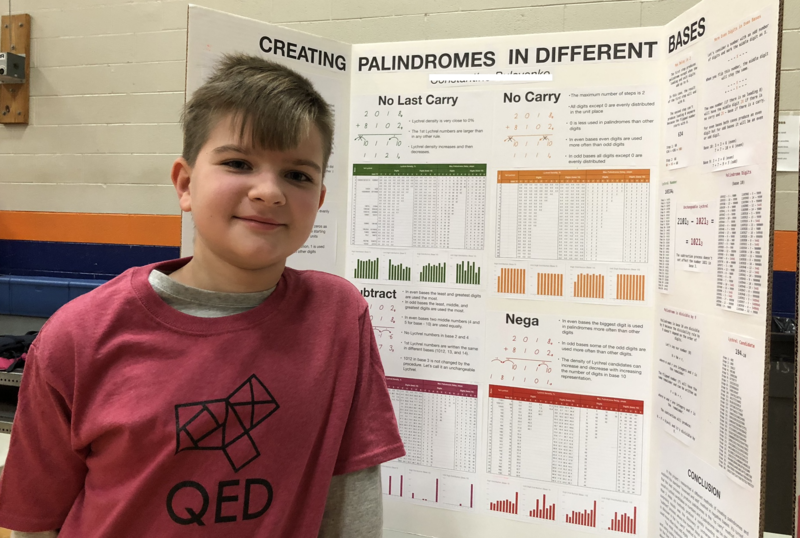 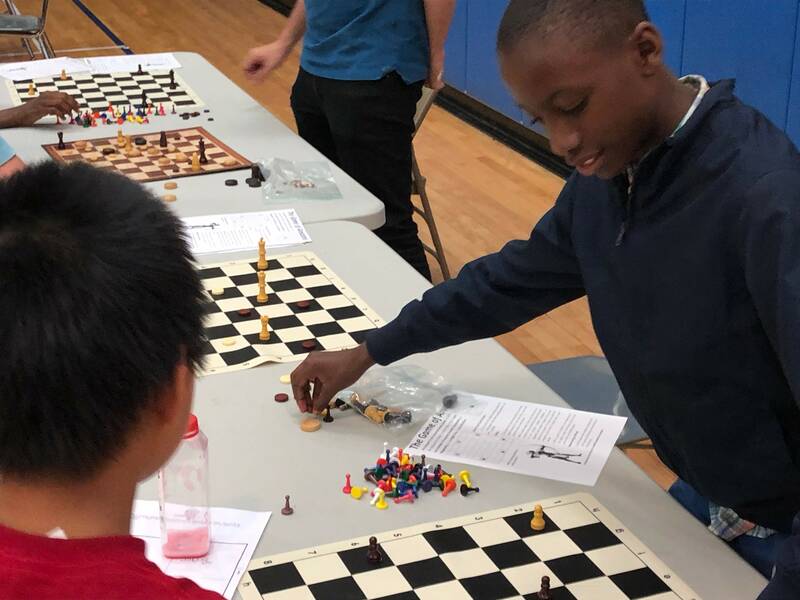 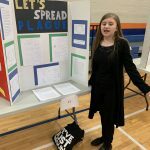 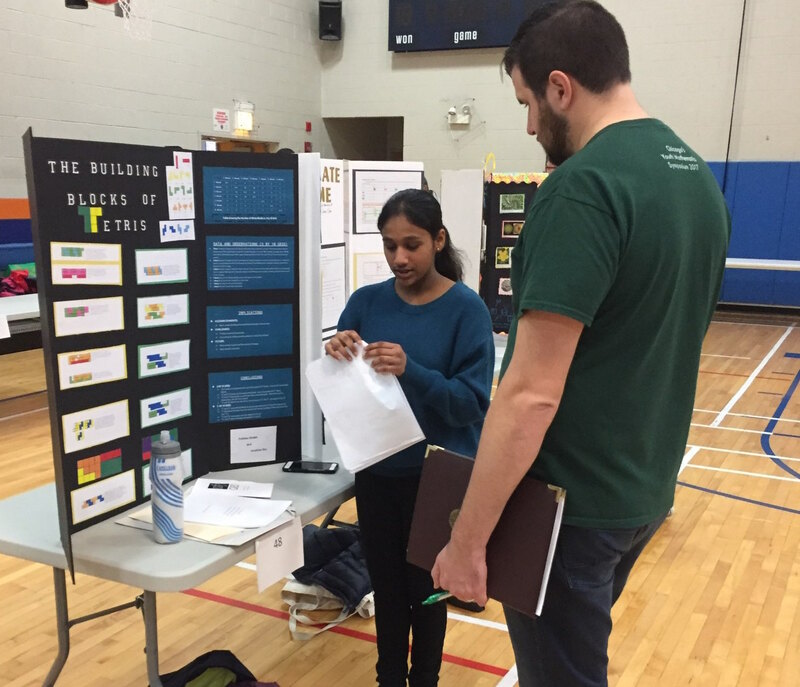 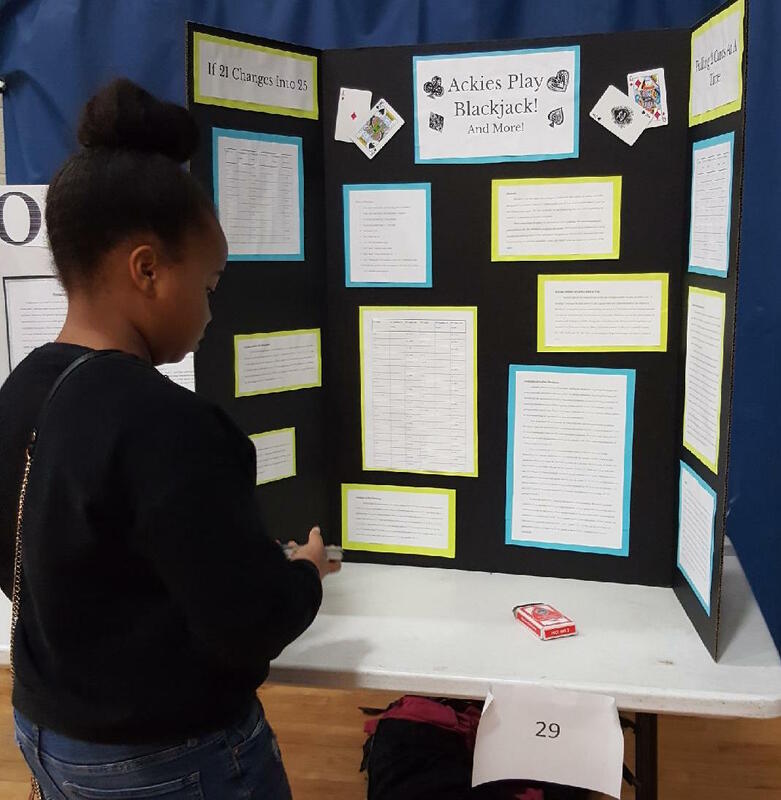 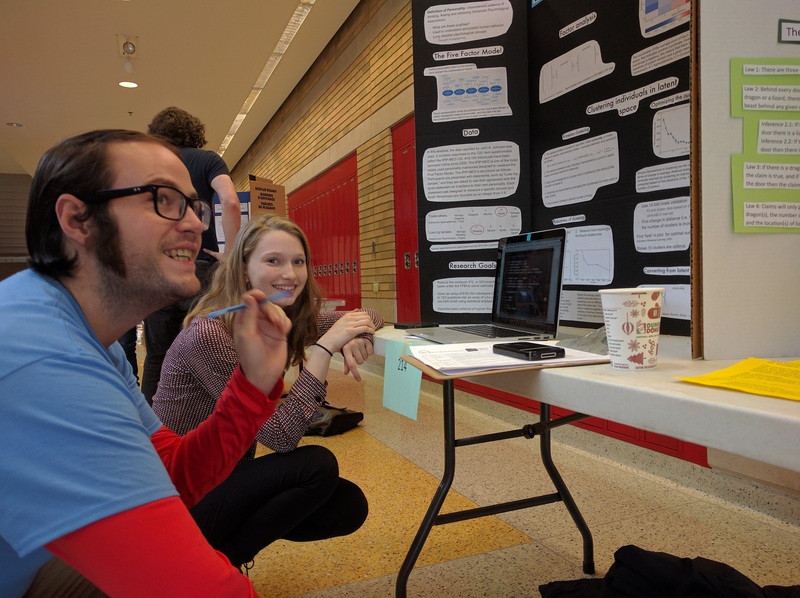 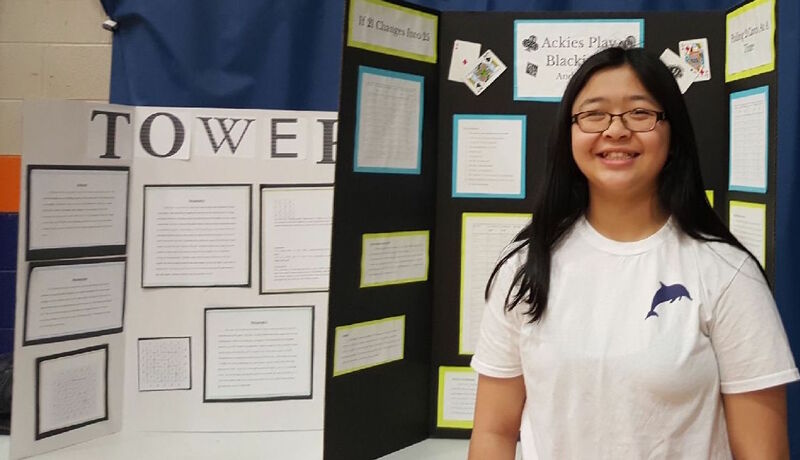 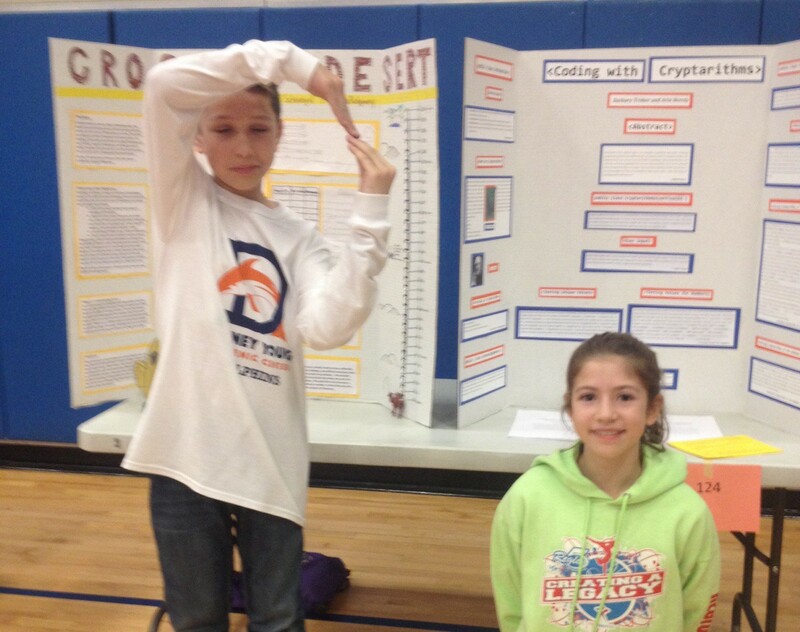 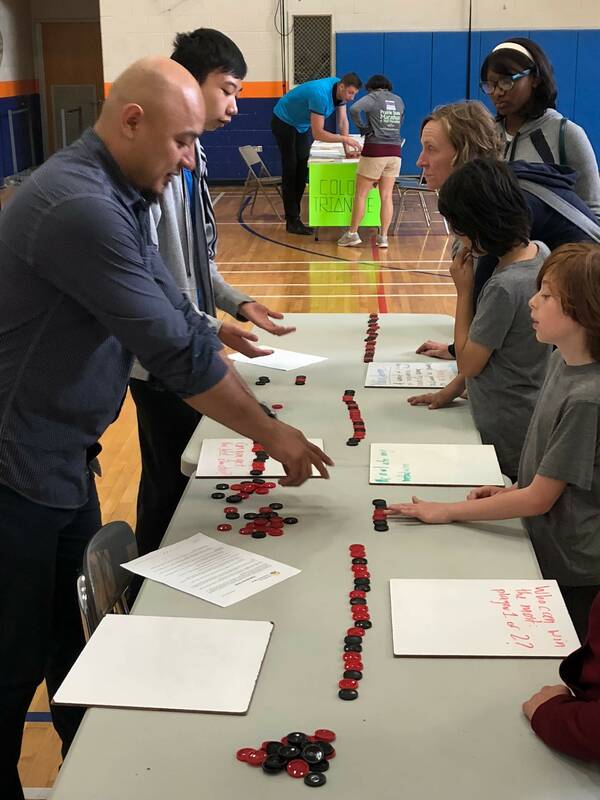 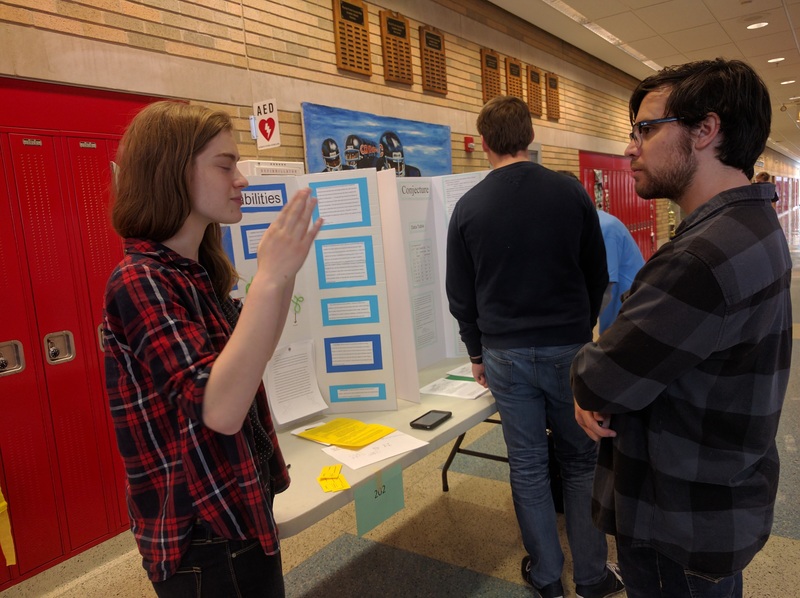 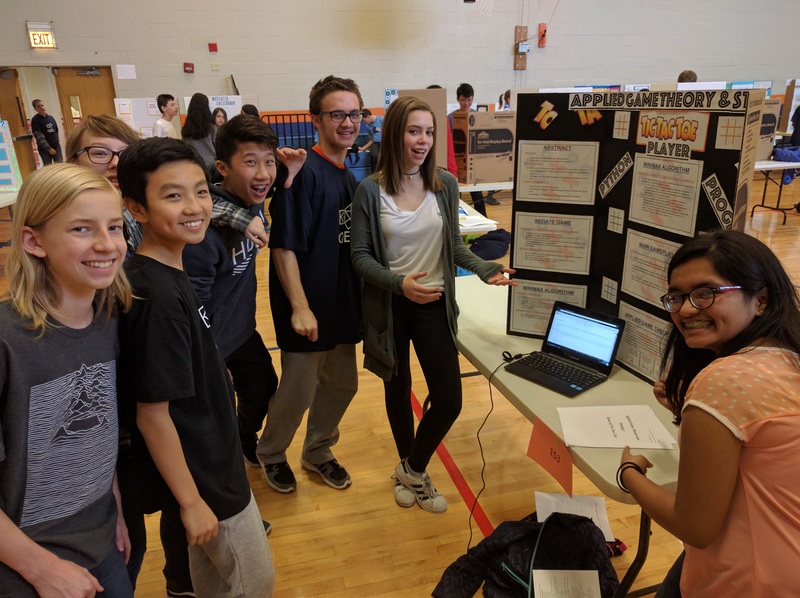 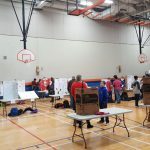 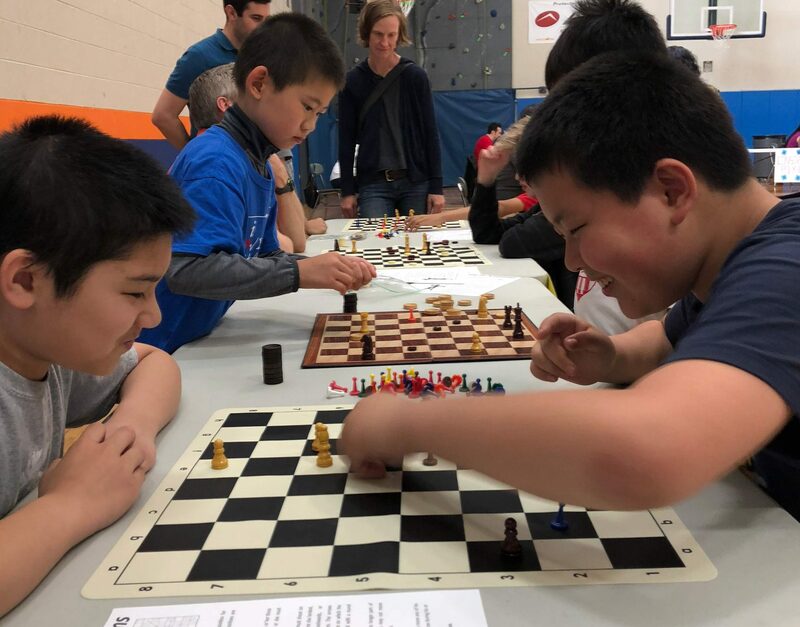 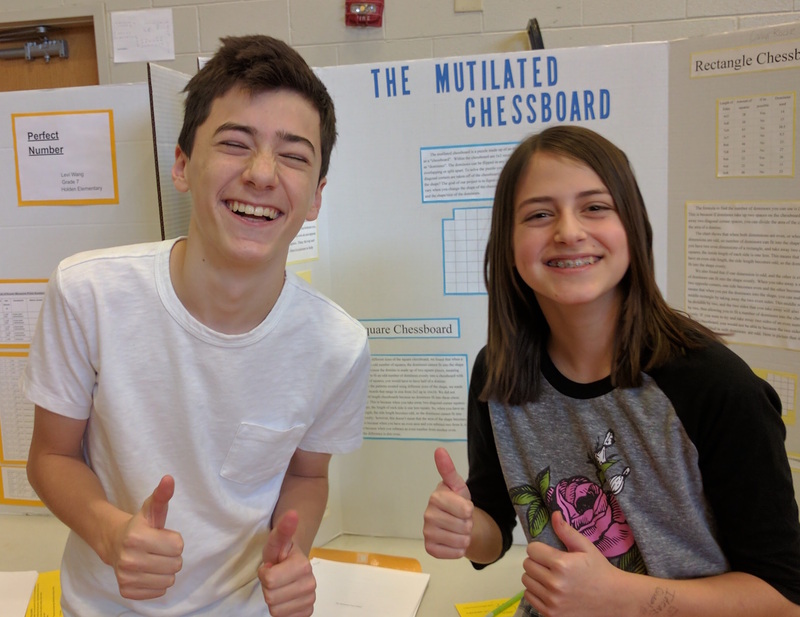 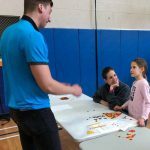 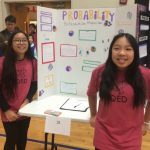 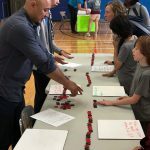 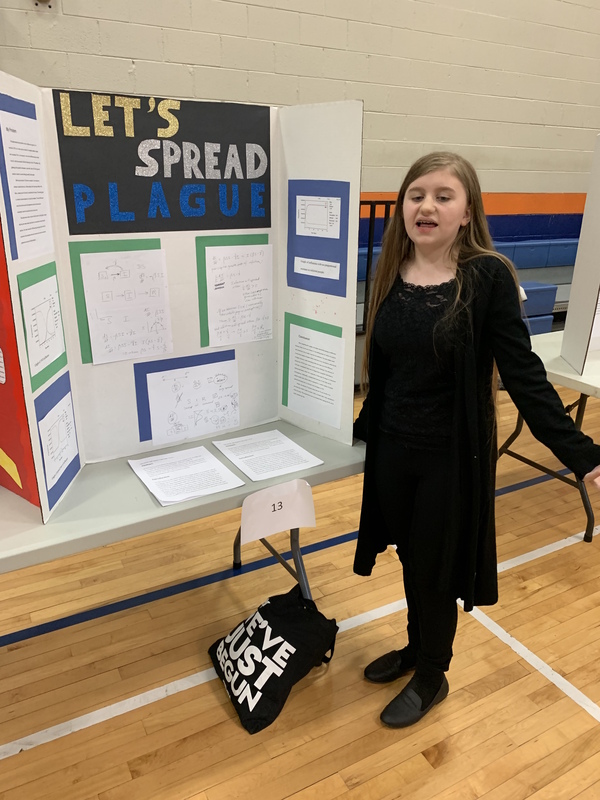 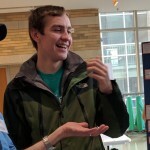 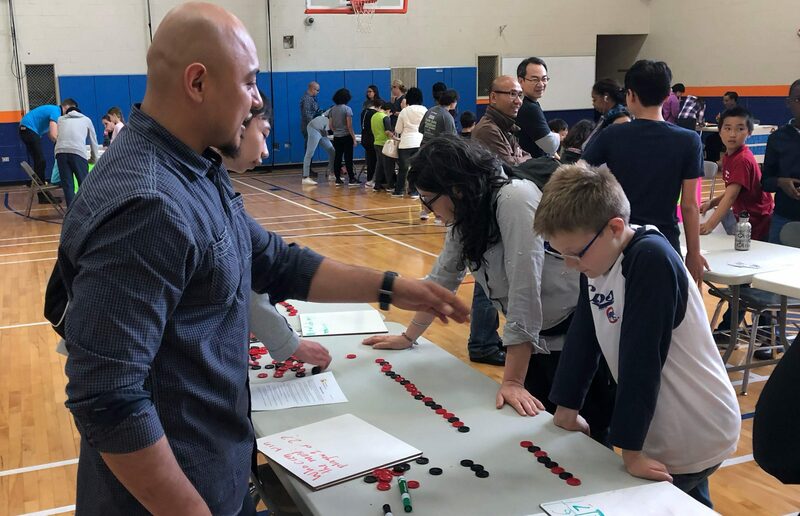 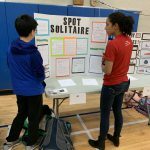 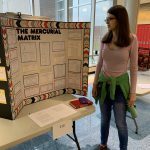 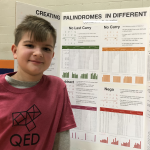 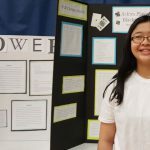 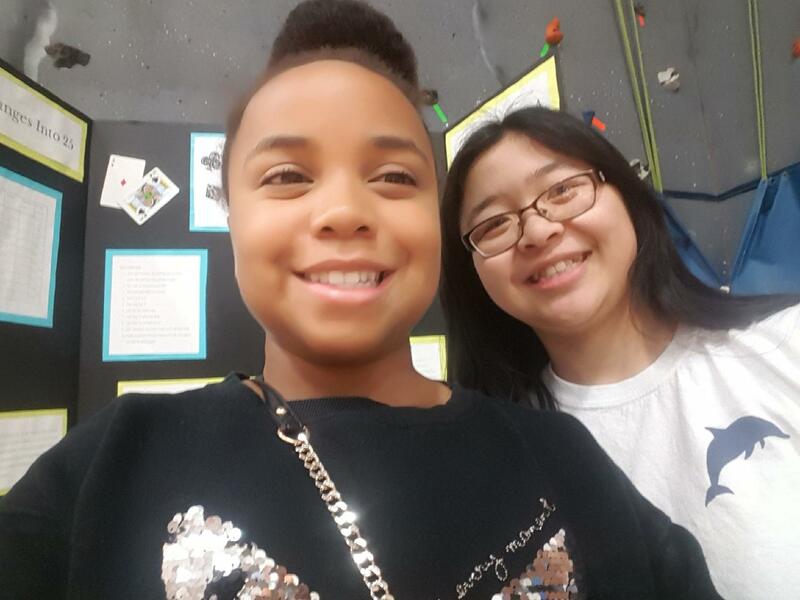 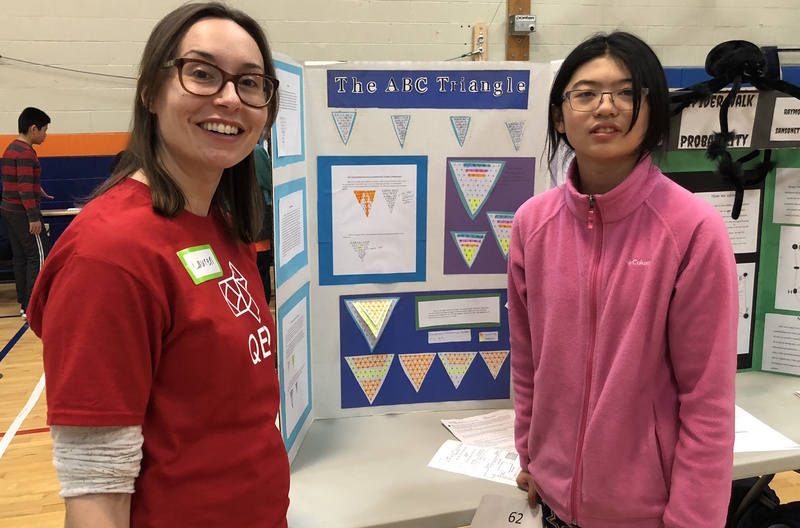 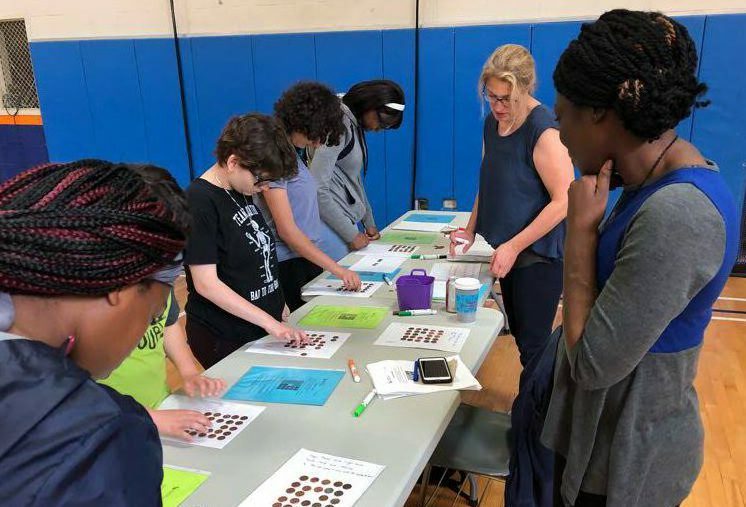 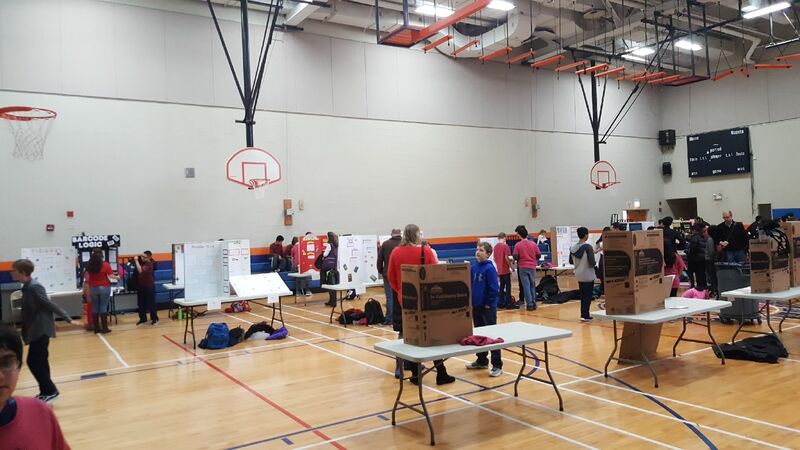 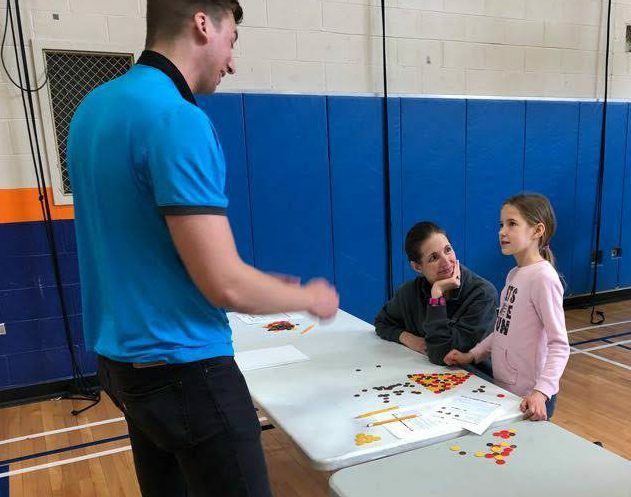 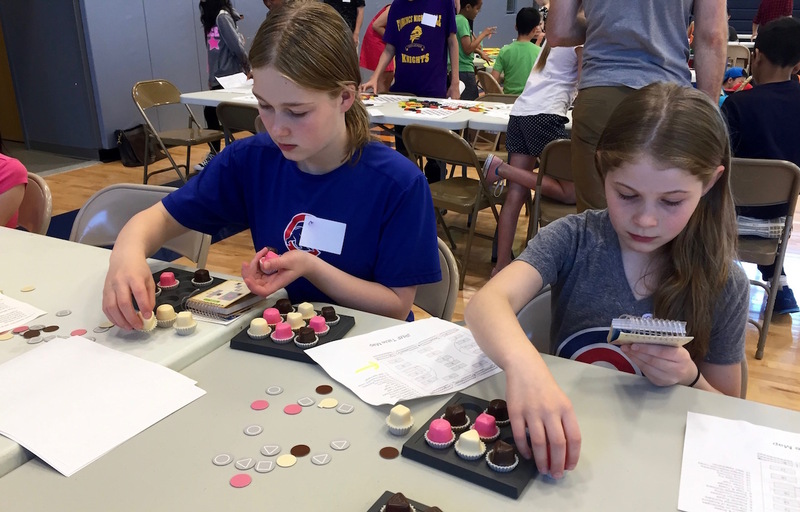 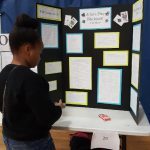 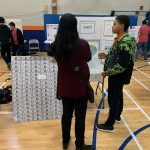 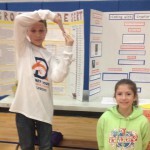 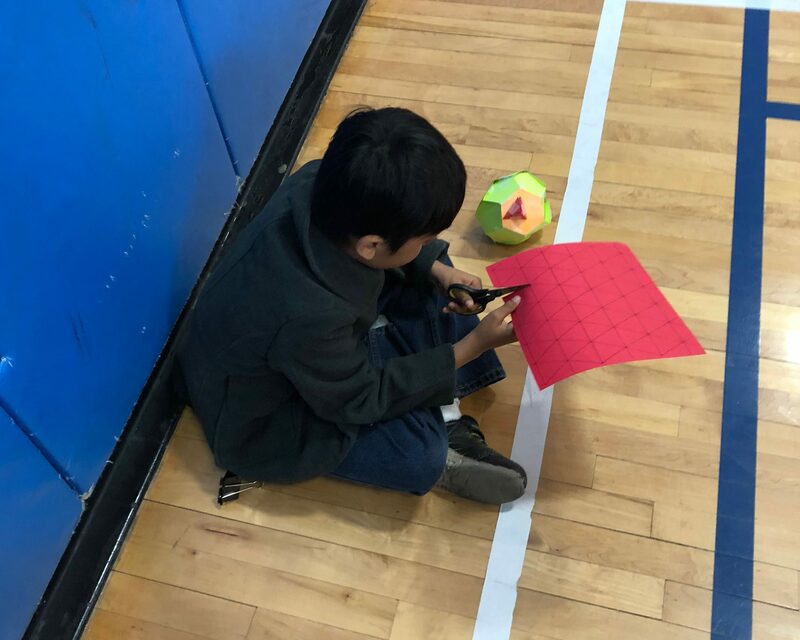 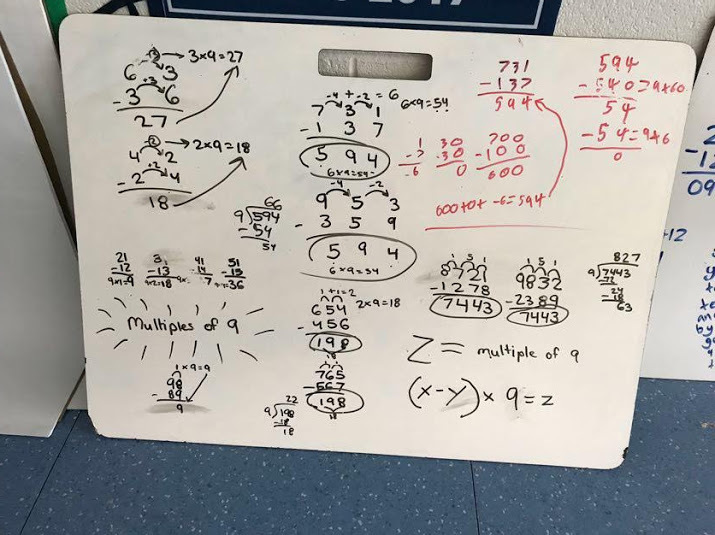 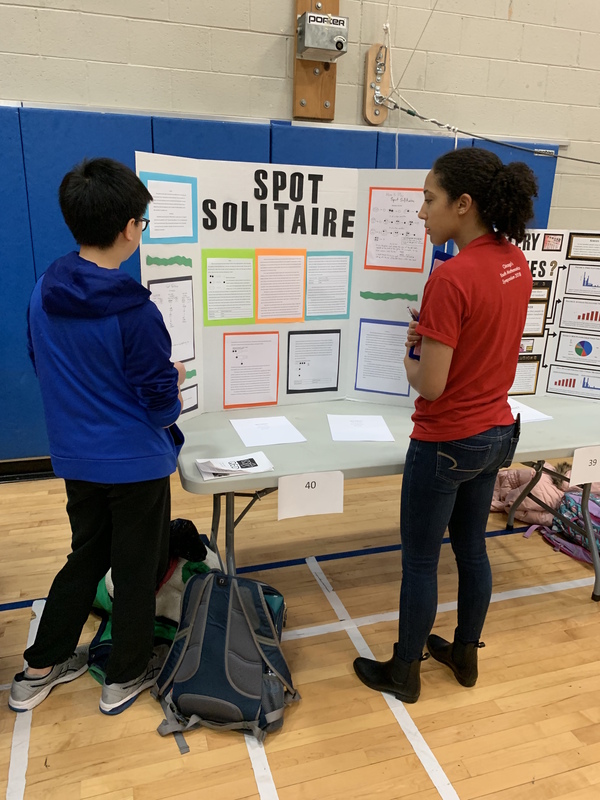 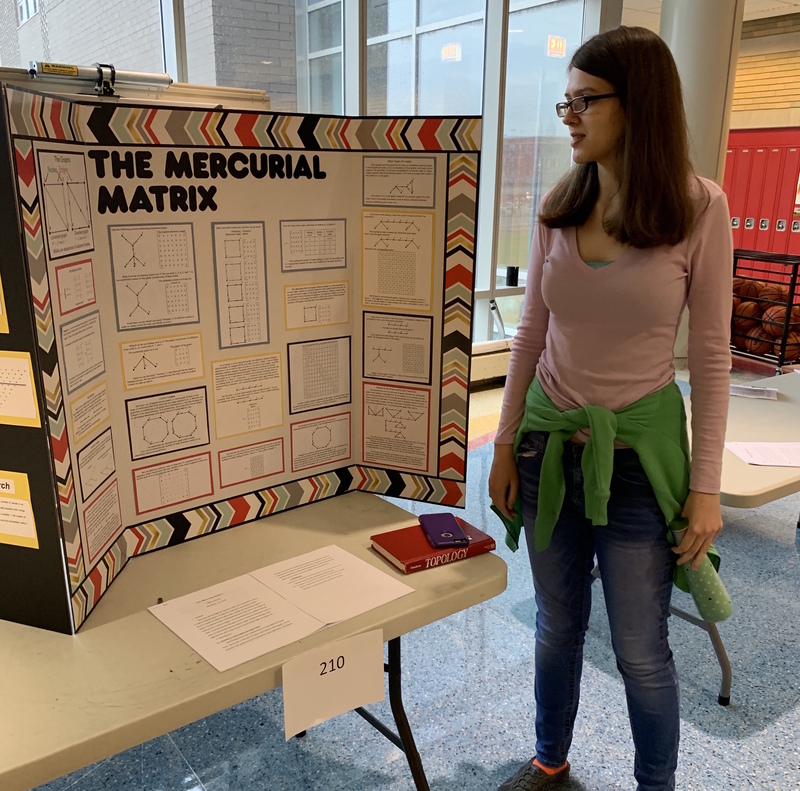 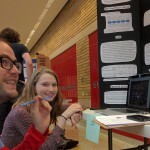 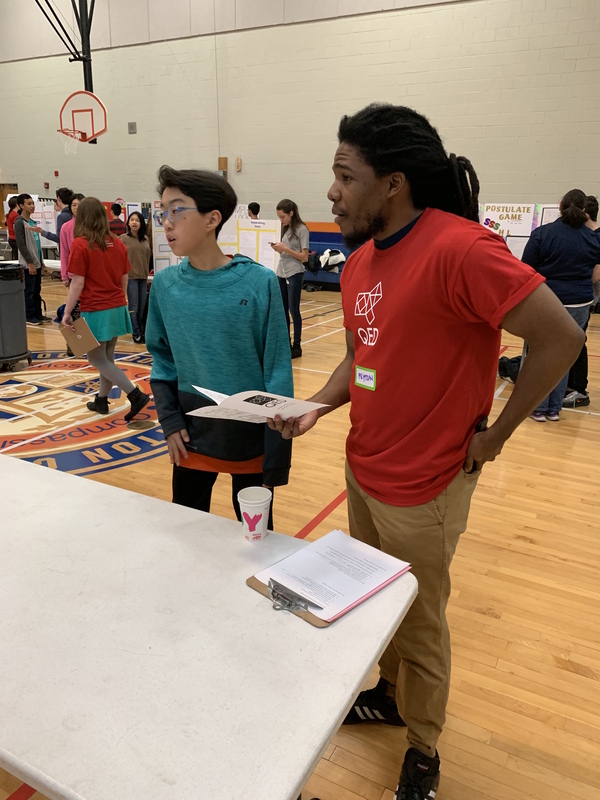 The festival featured 16 tables in Payton’s gym, each with a separate math activity. 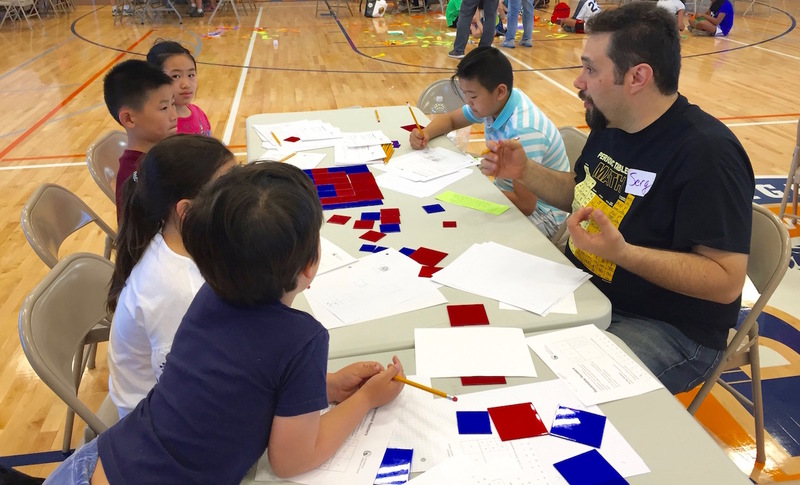 Many tables were led by PhD students in math. 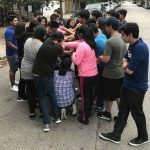 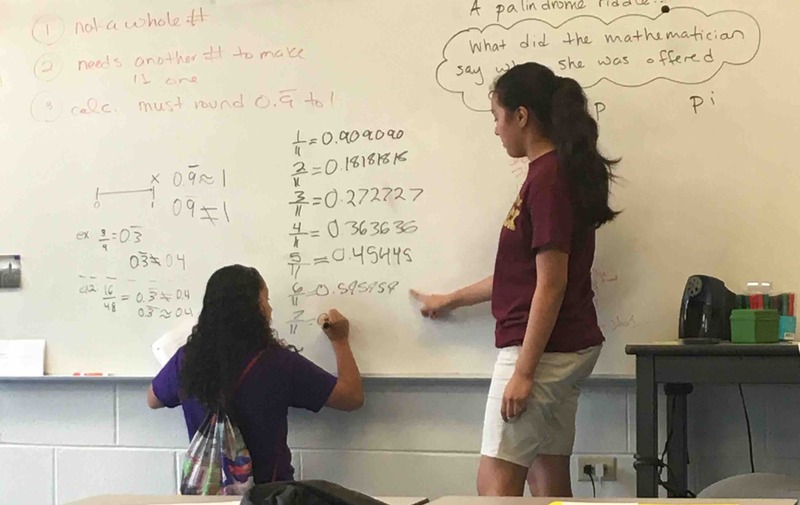 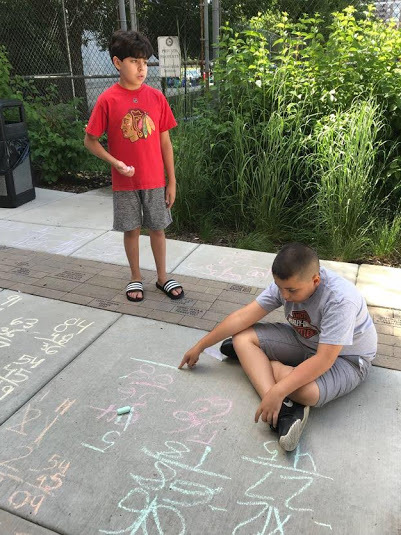 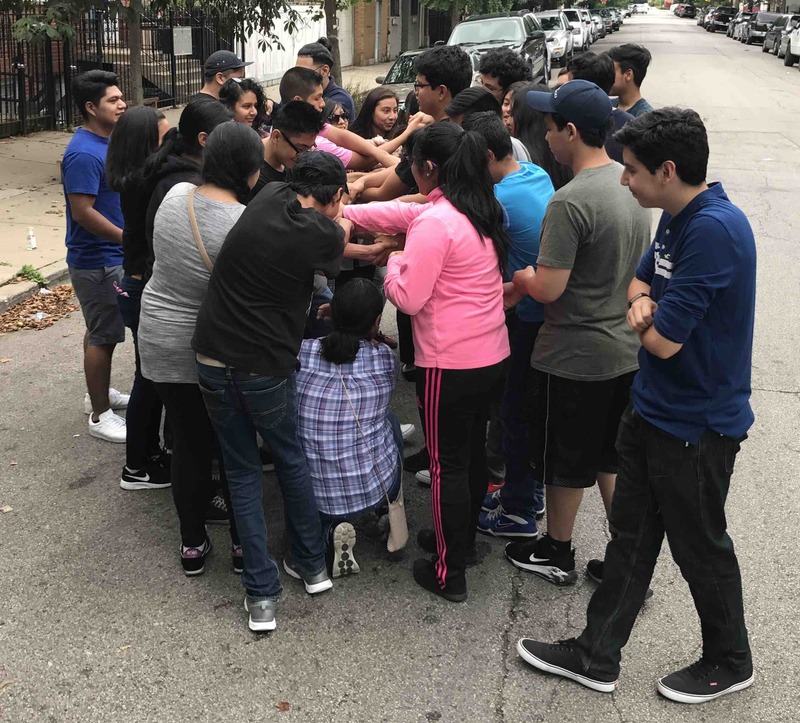 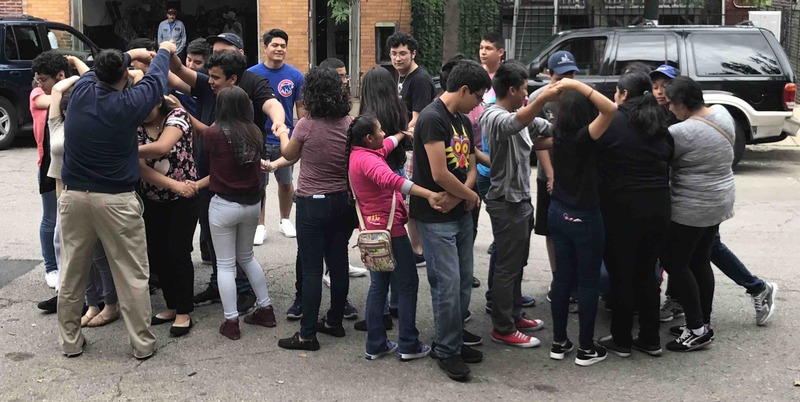 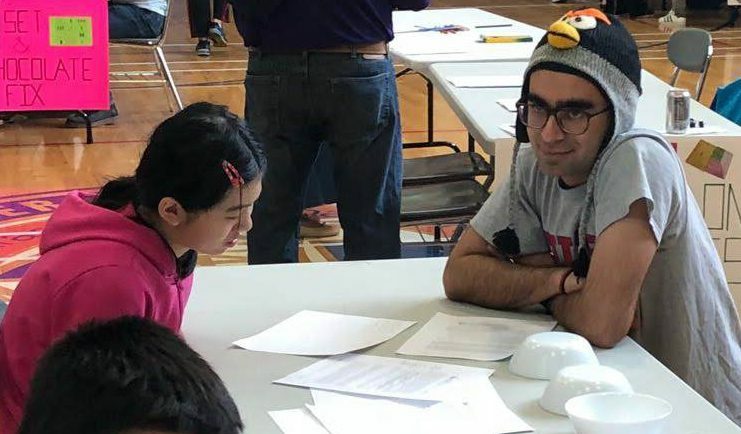 Nathan Lopez is earning his PhD at UIC, and is a leader at the Pilsen Math Circle. 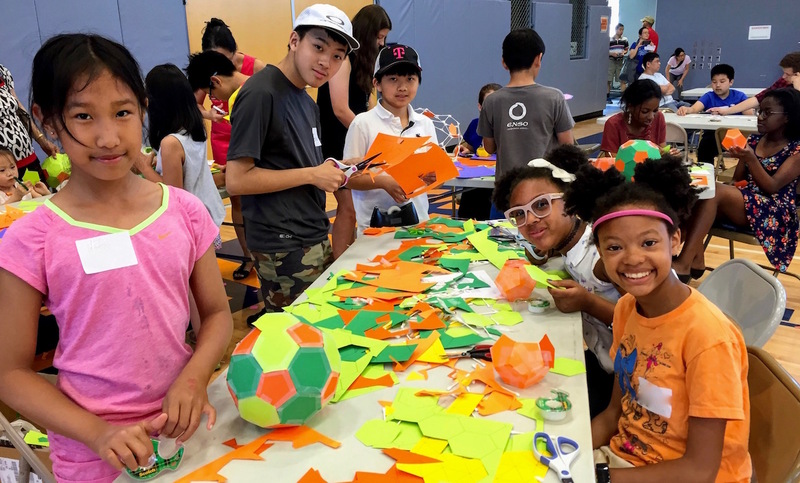 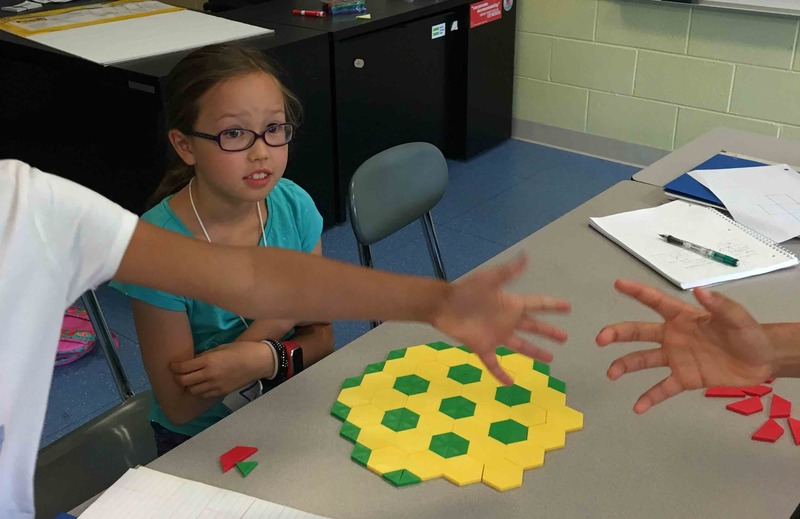 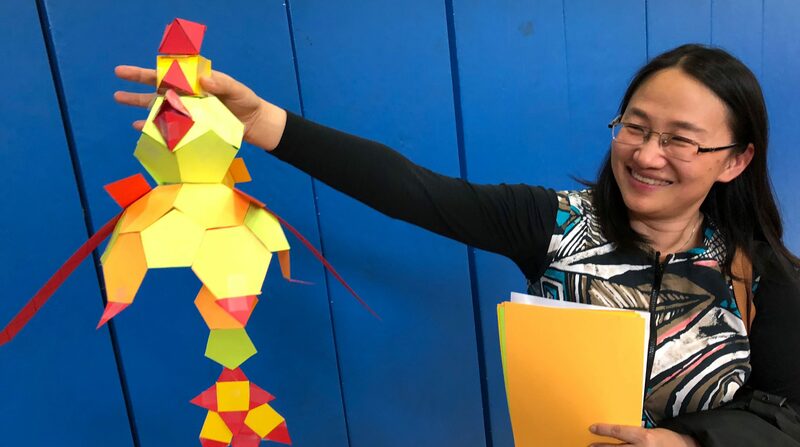 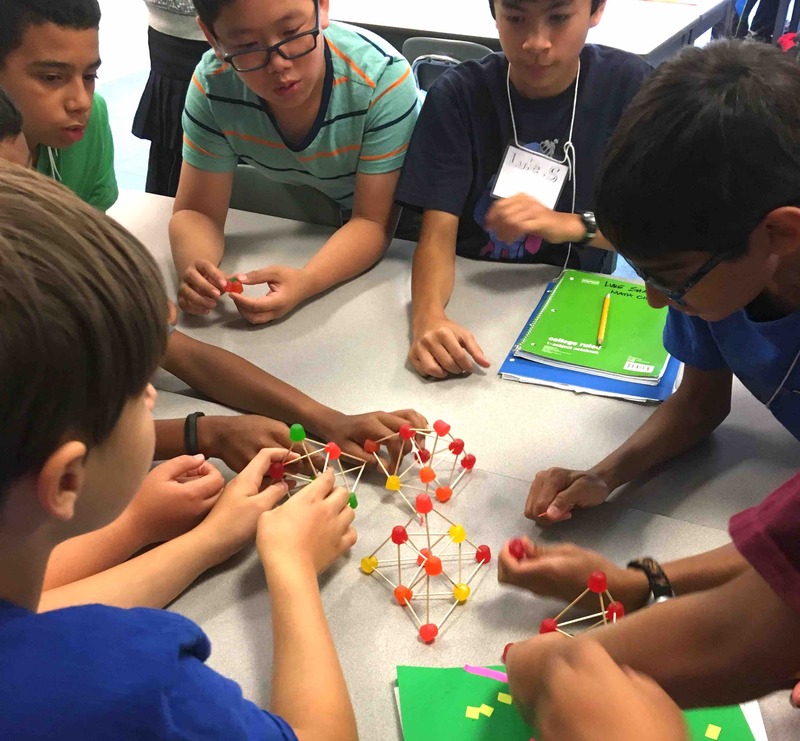 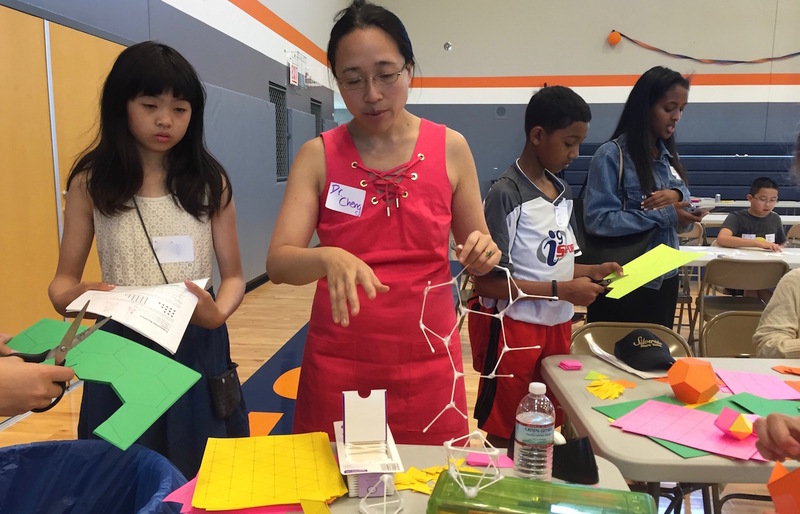 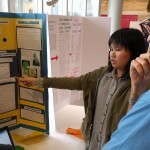 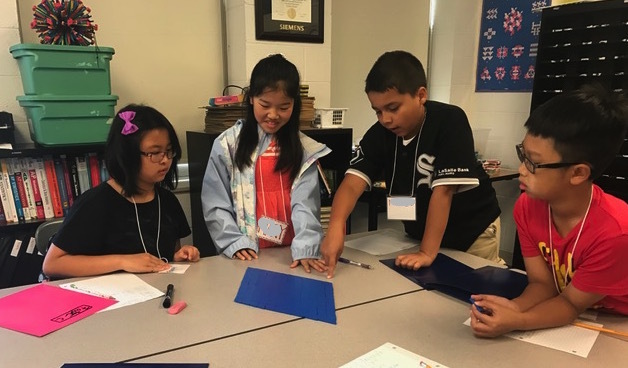 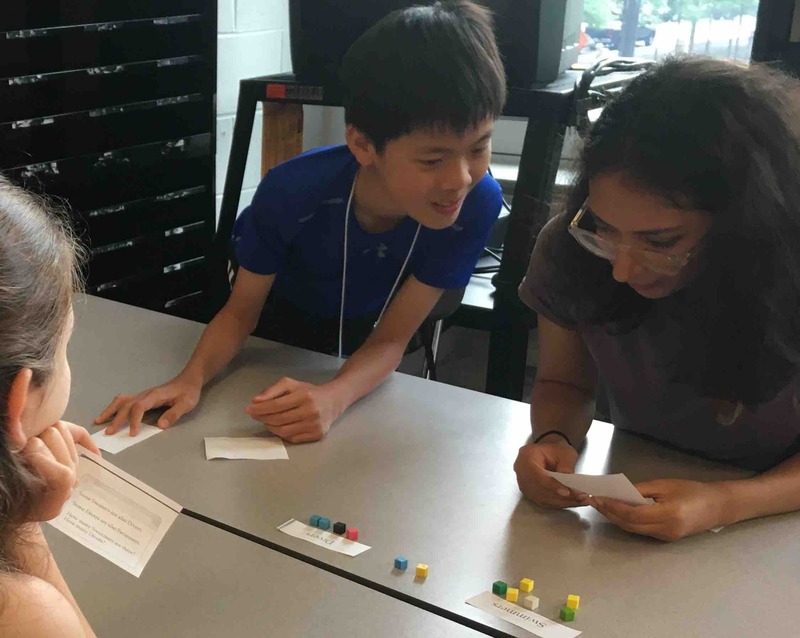 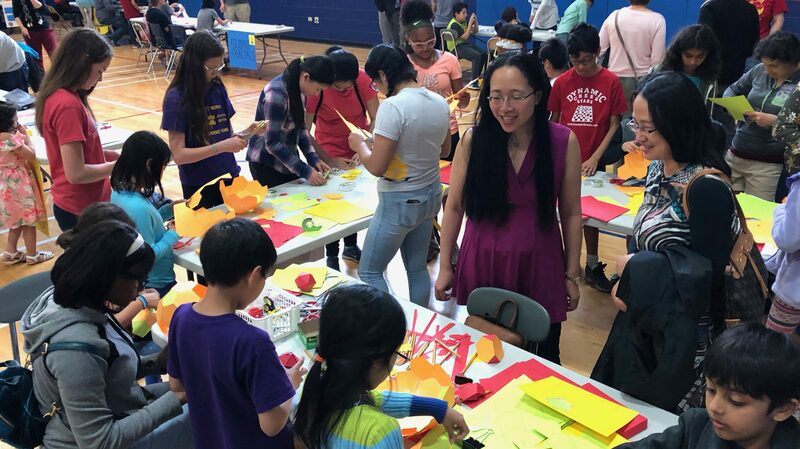 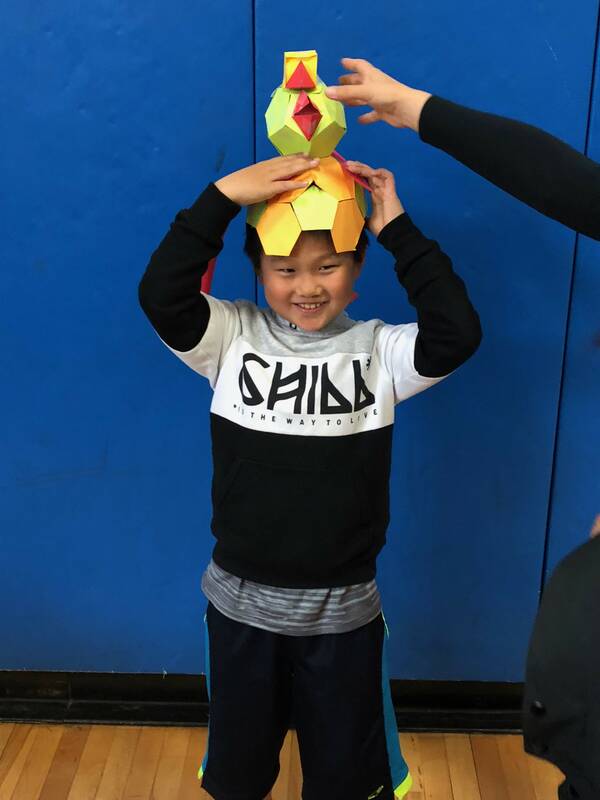 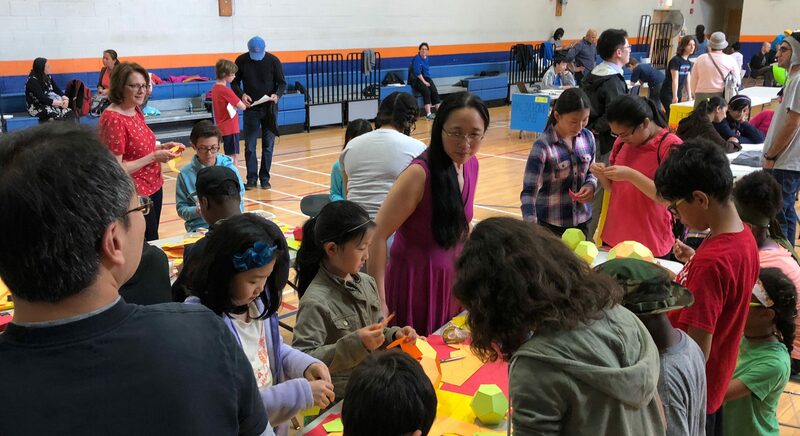 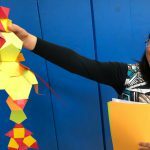 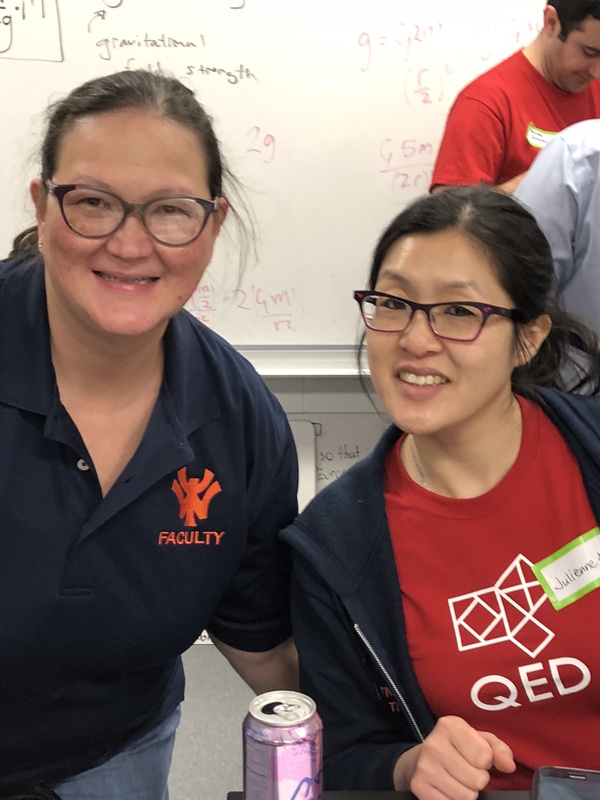 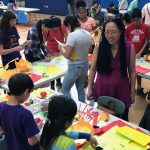 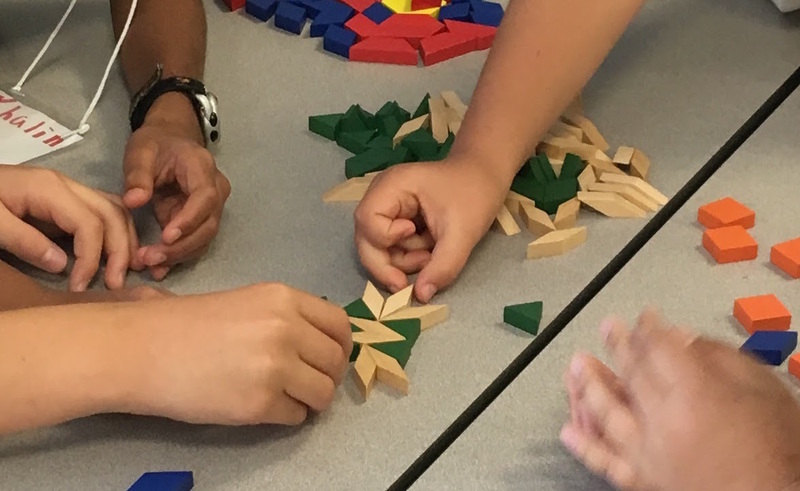 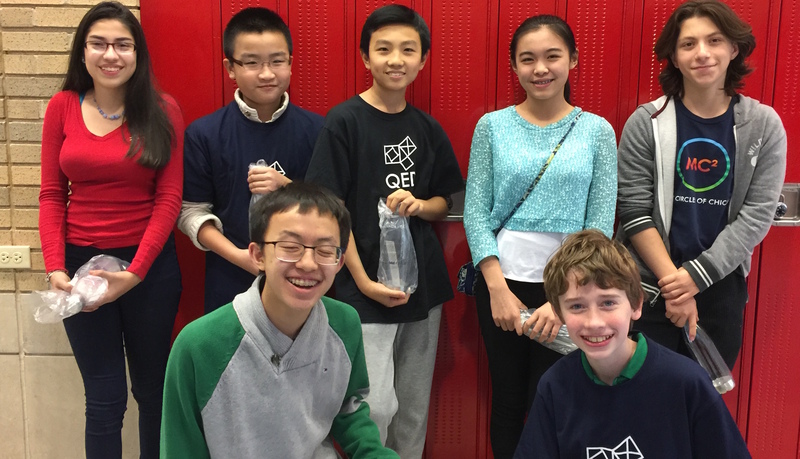 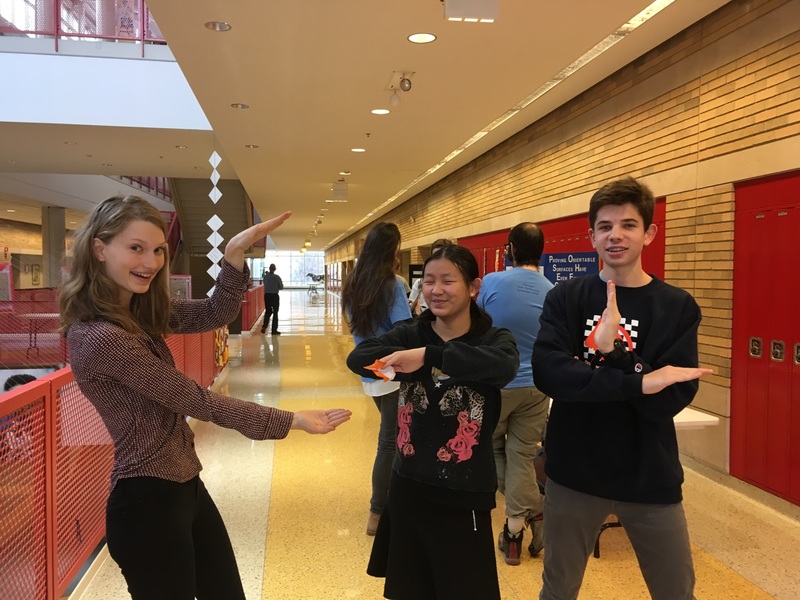 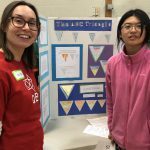 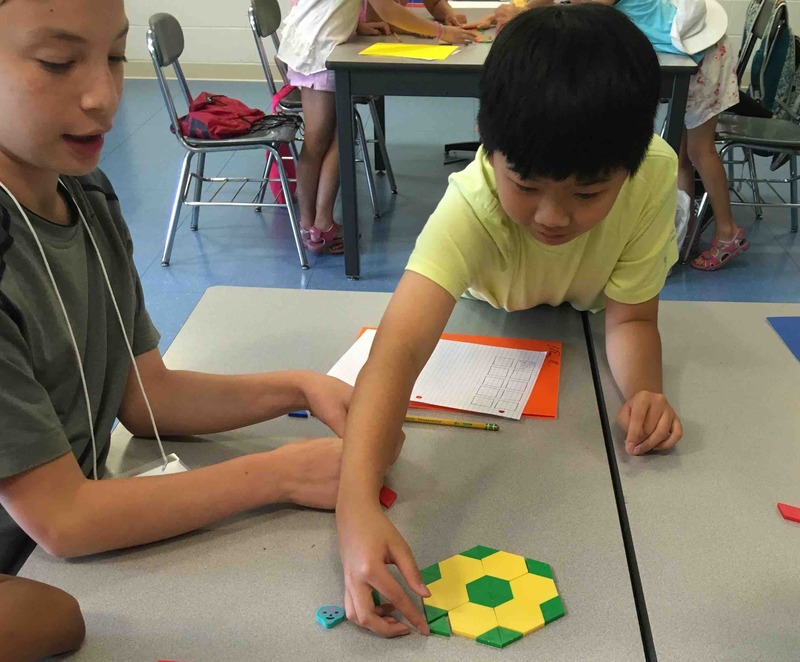 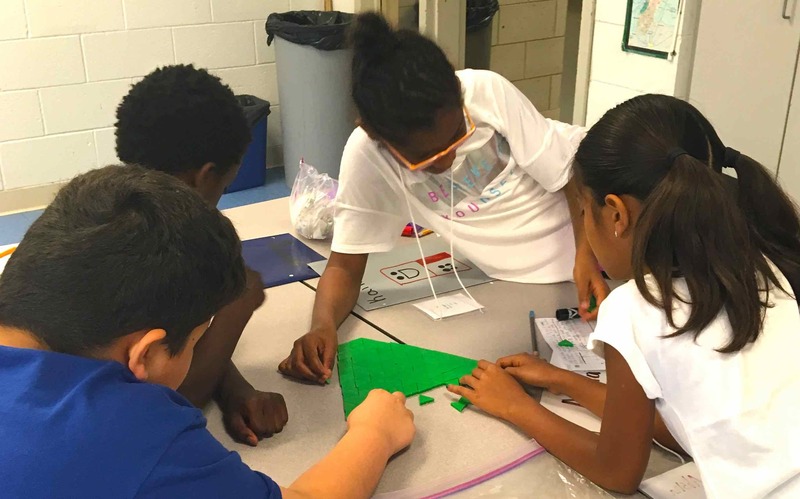 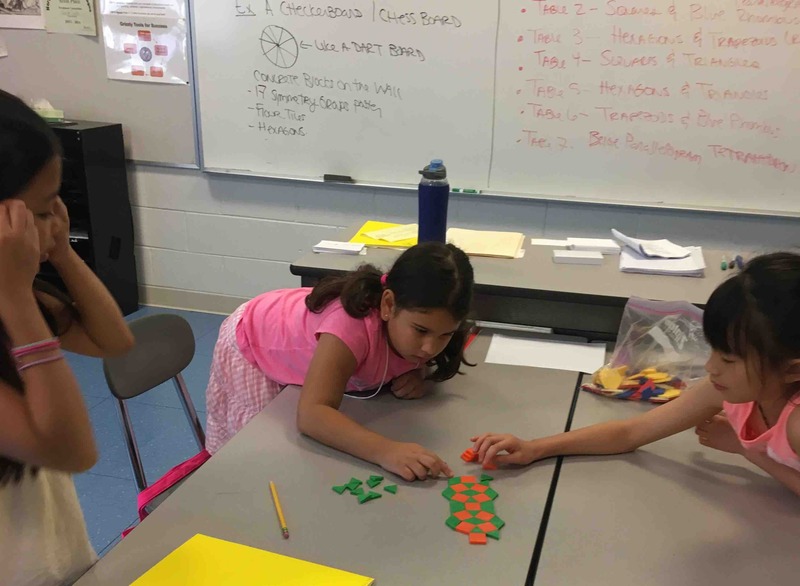 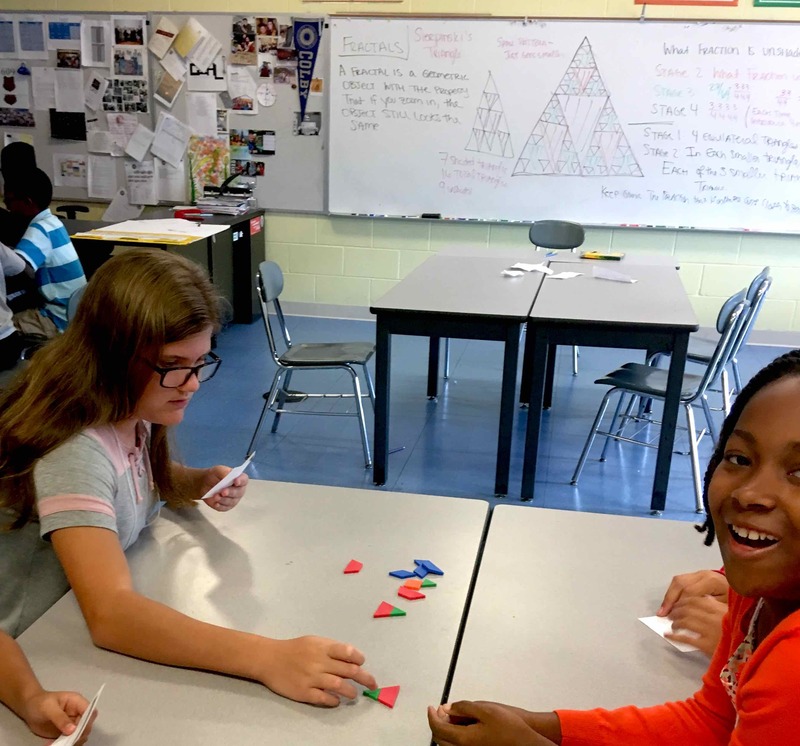 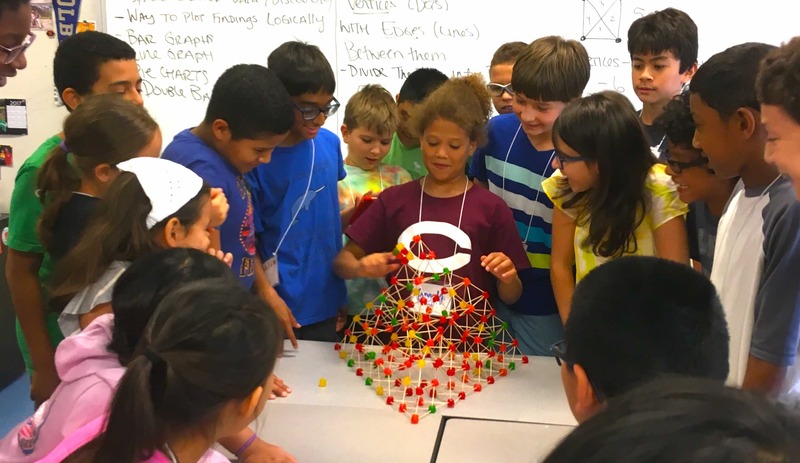 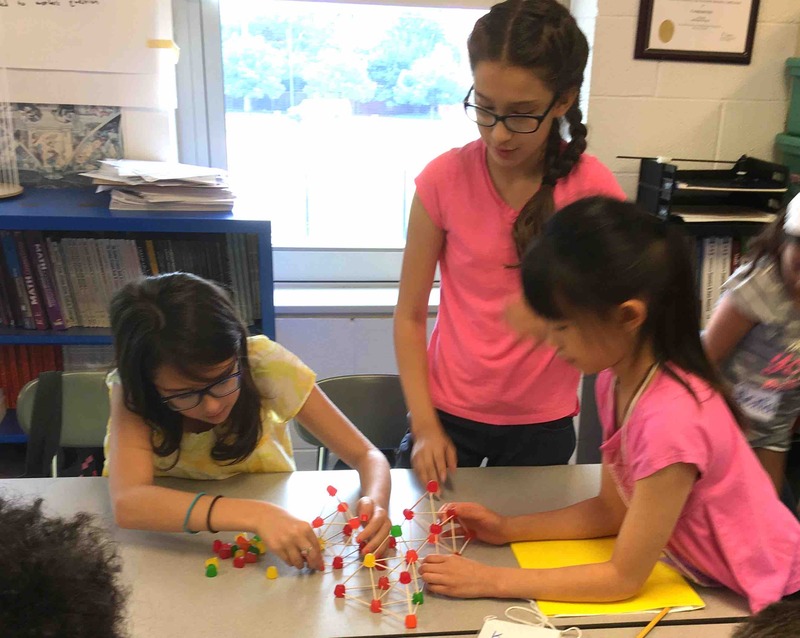 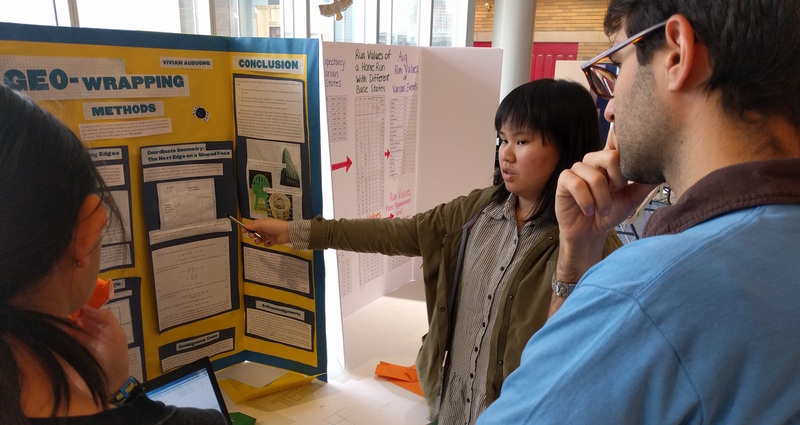 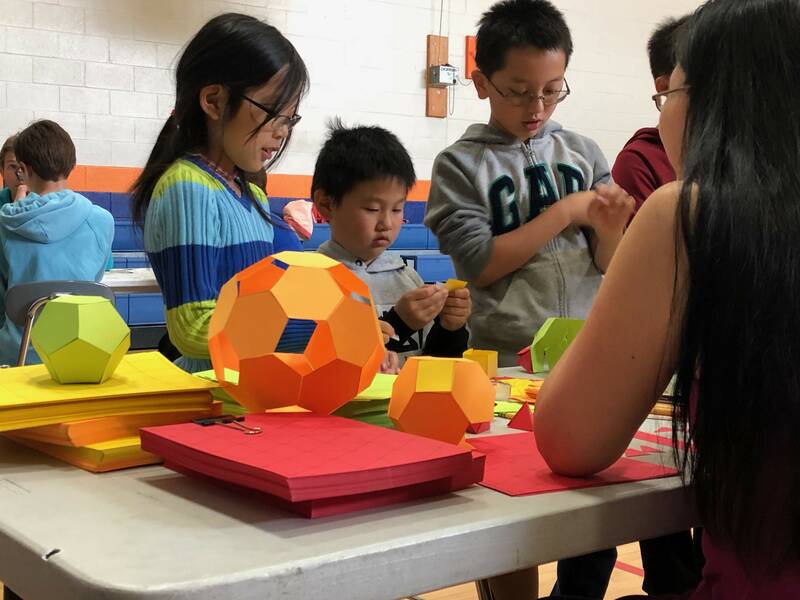 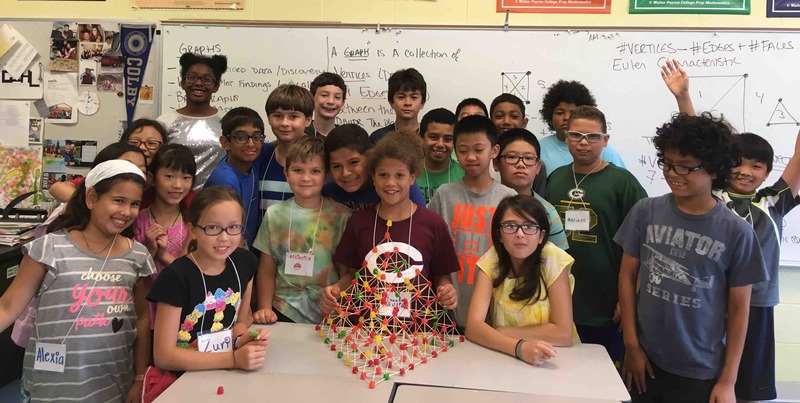 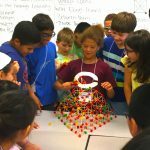 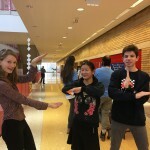 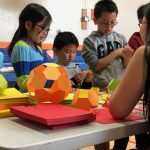 Dr. Eugenia Cheng led one table and helped students explore building polyhedra. Abhinav Gandhi is a community member and data scientist who volunteered to lead Table 4! 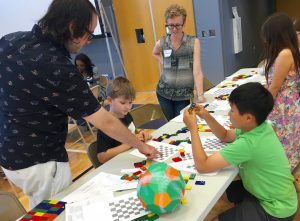 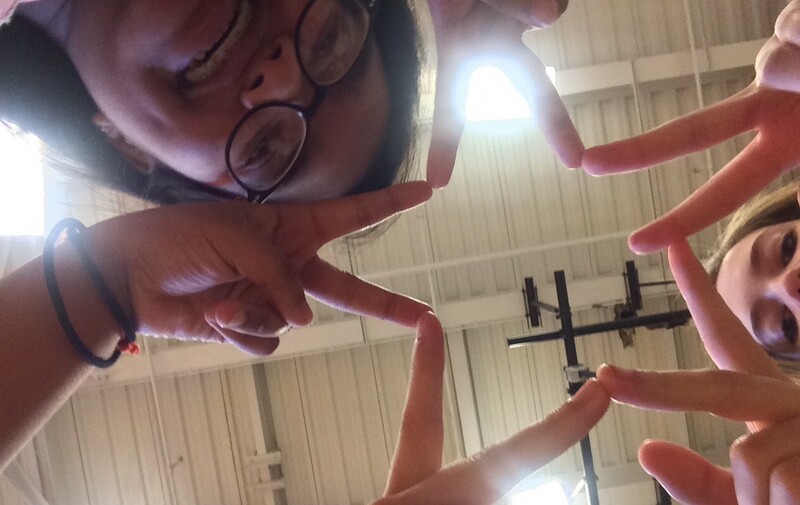 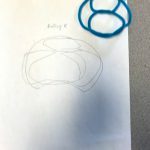 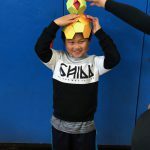 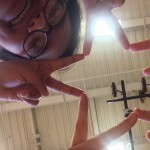 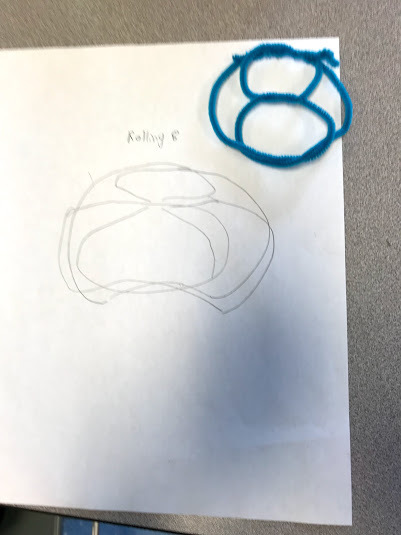 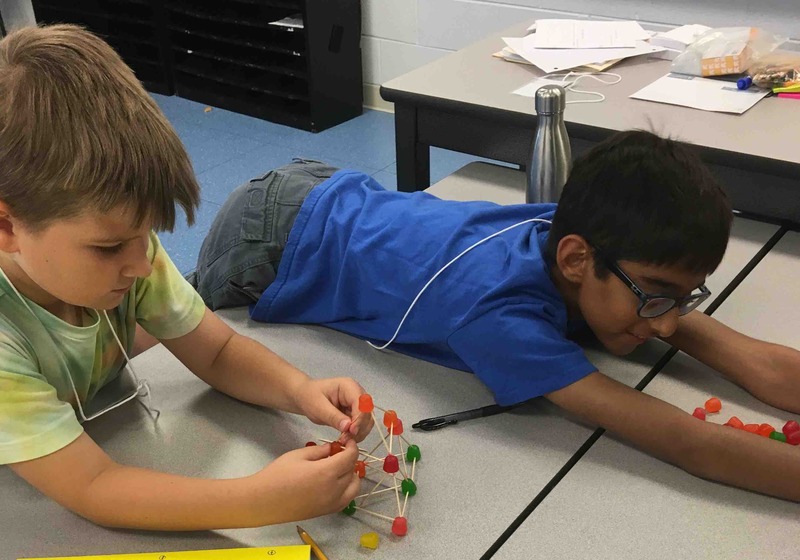 Many students created Archimedean solids like the ever popular bucky ball/truncated icosahedron. 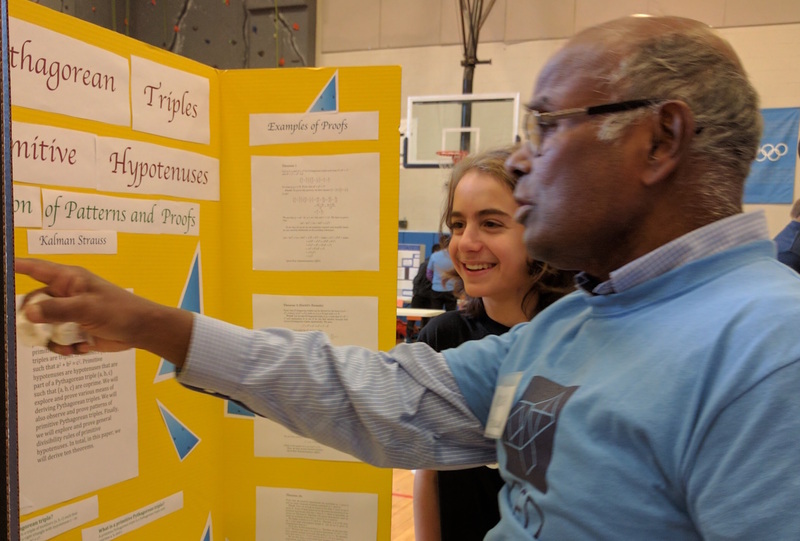 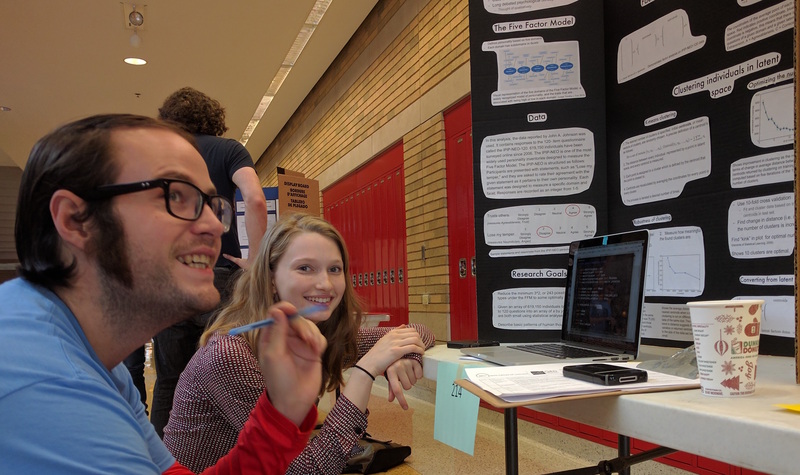 Edgar Bering and Ellie Dannenberg are doctoral students in math at UIC who have taught math circles for many years. 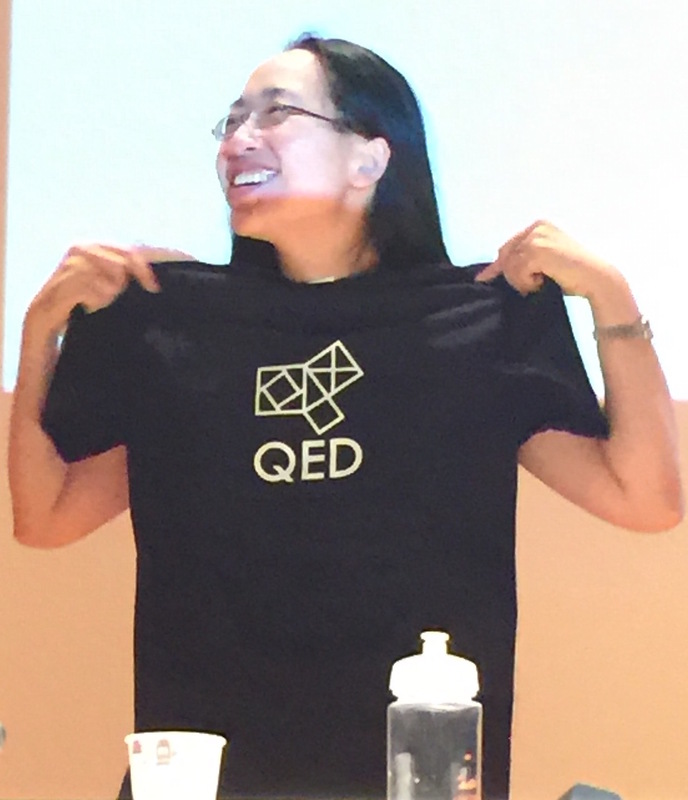 We owe thanks to our speaker, Eugenia Cheng, and our sponsors, including Citadel and Intel. 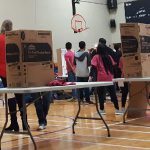 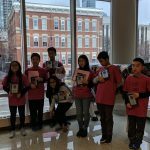 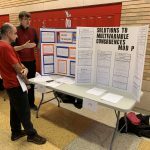 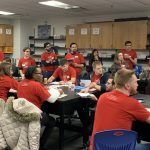 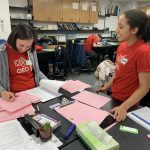 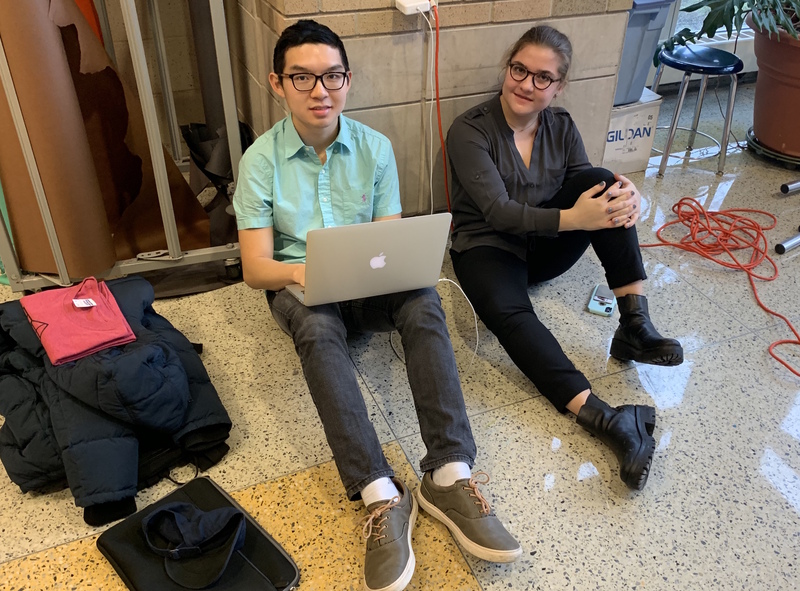 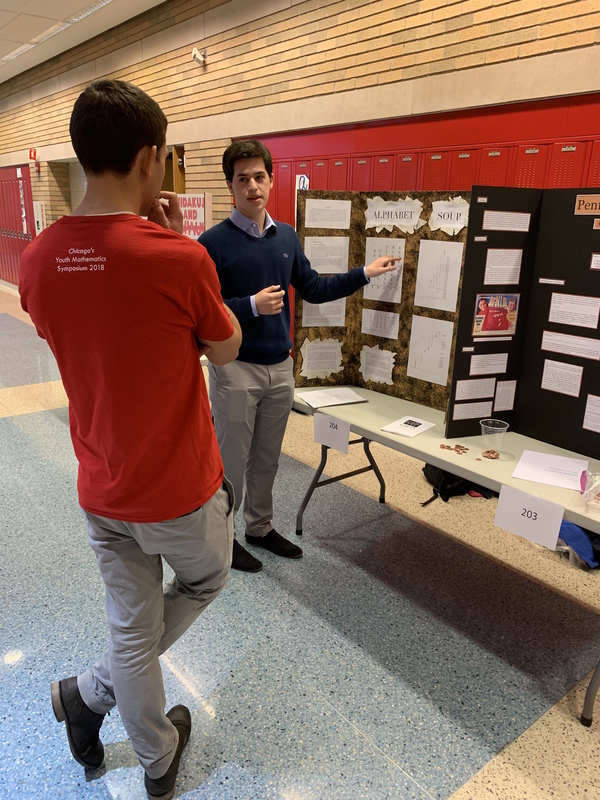 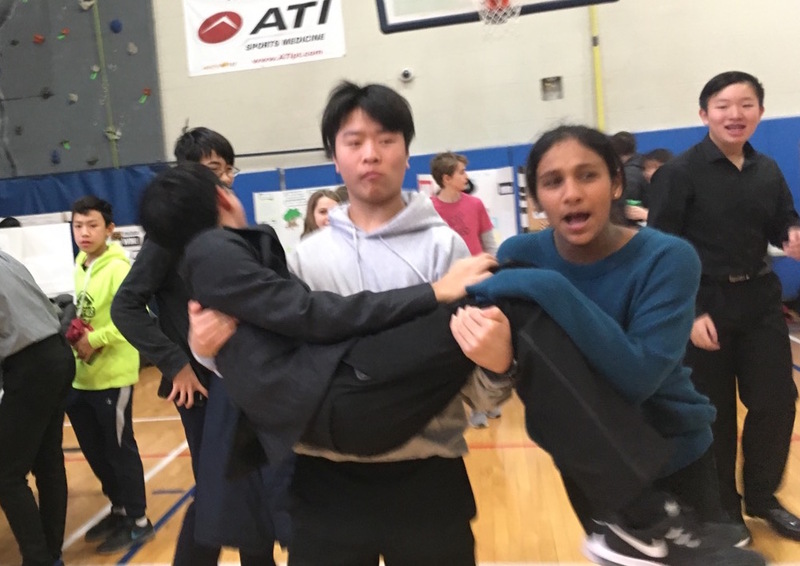 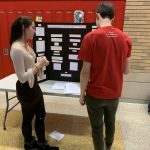 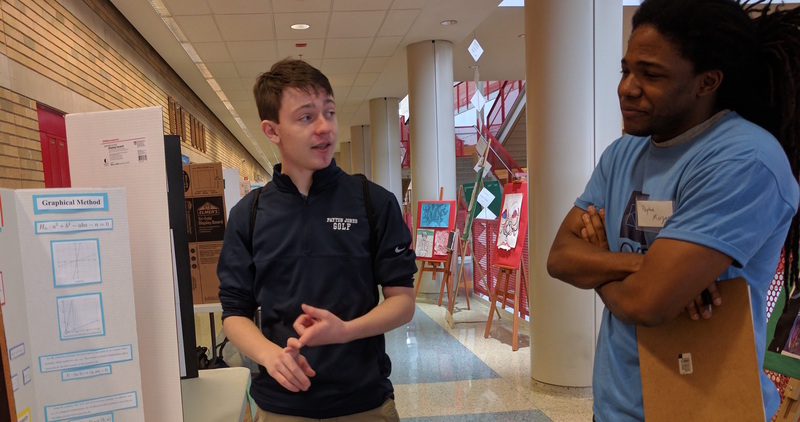 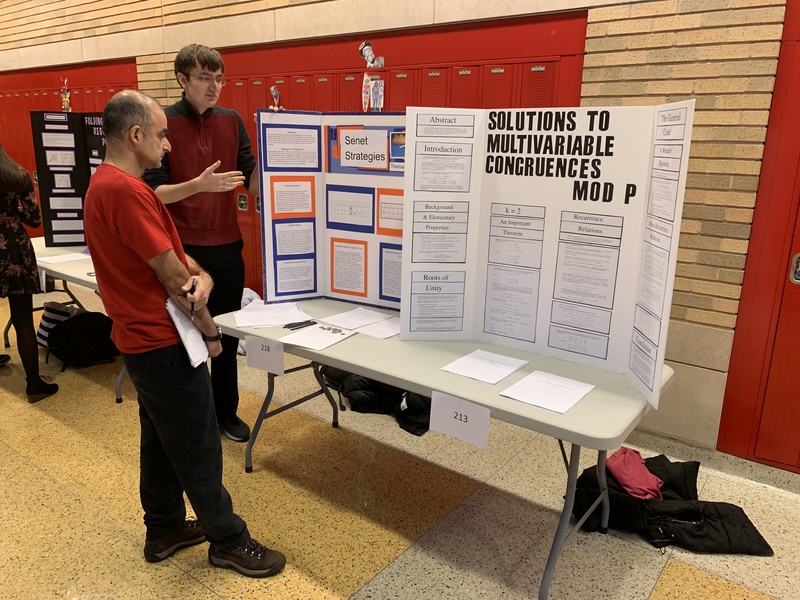 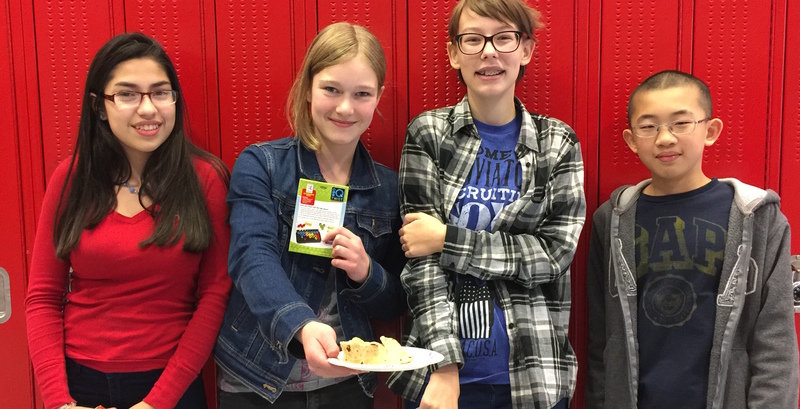 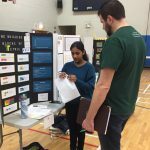 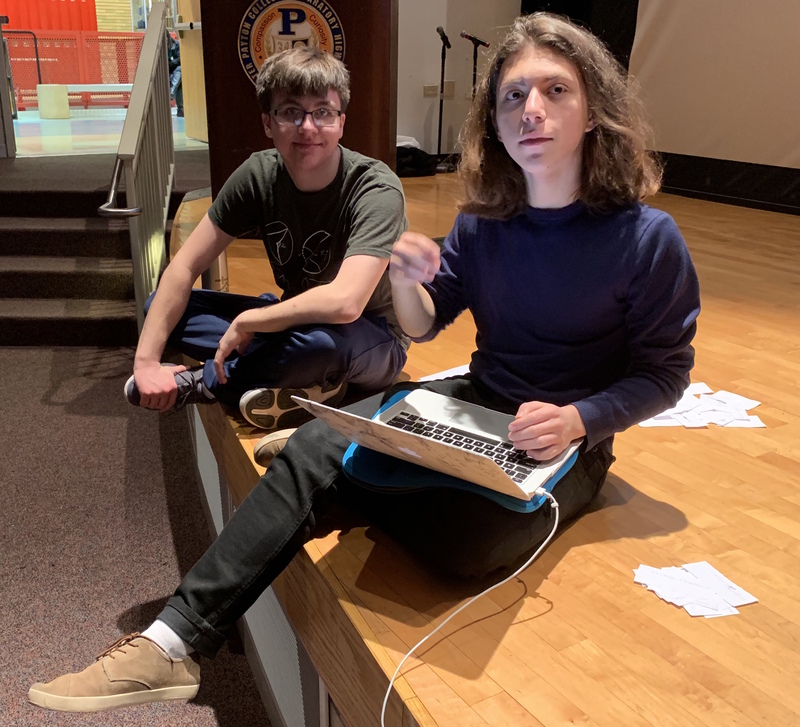 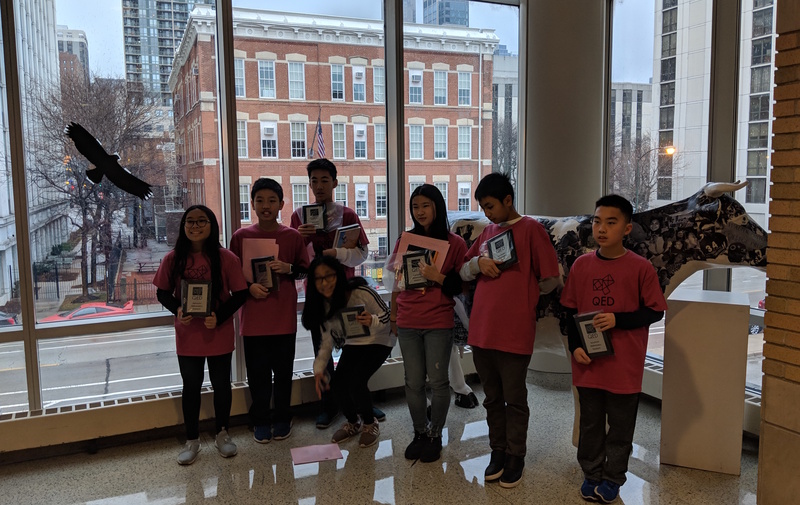 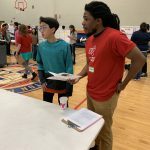 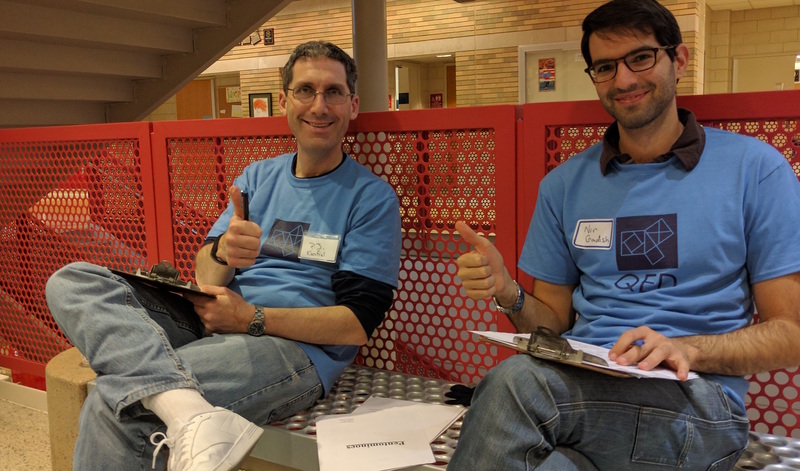 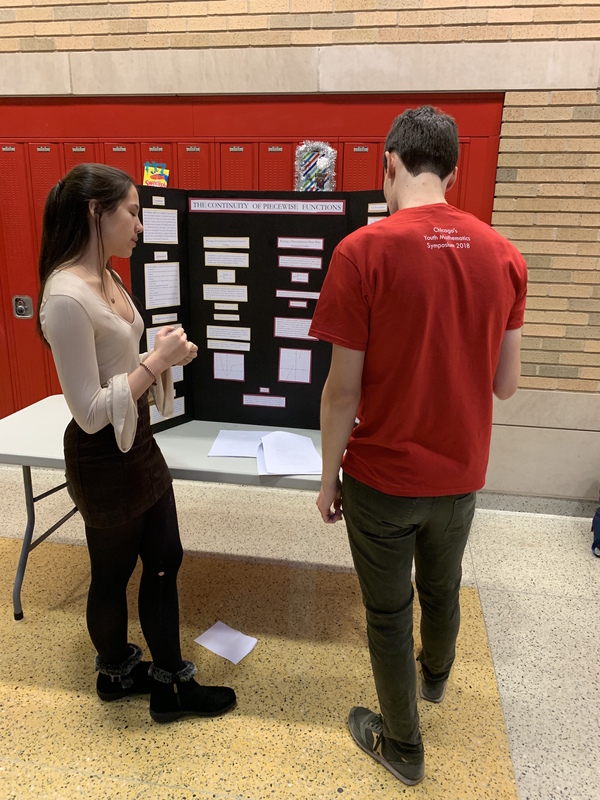 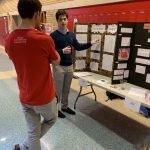 Our judges also deserve a word of thanks, and last, but far from least, thanks to the sponsoring teachers who supported the students who participated. 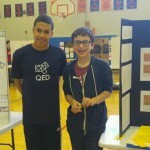 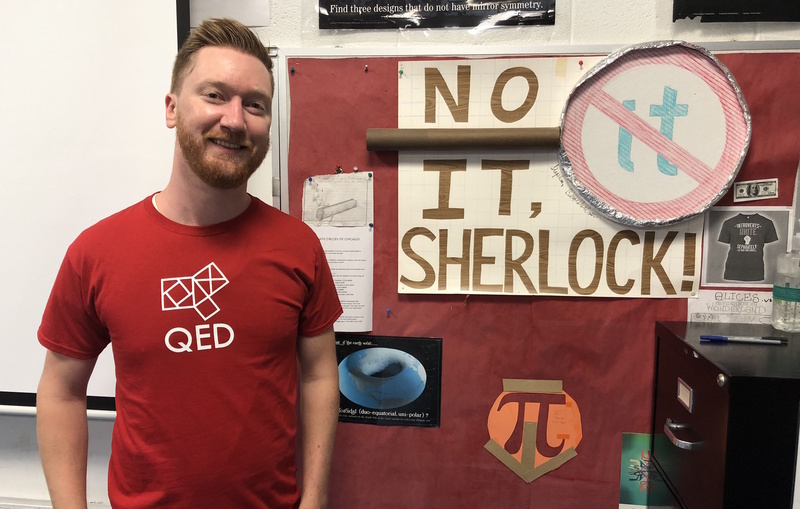 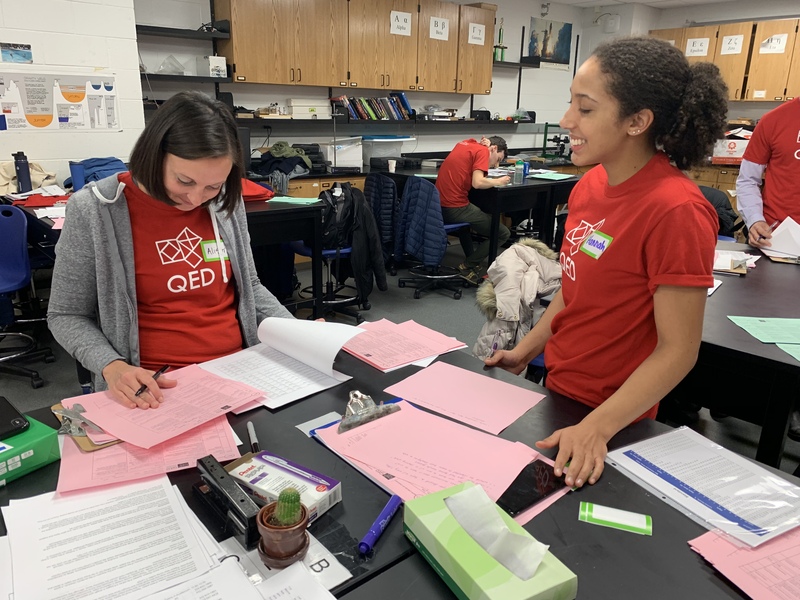 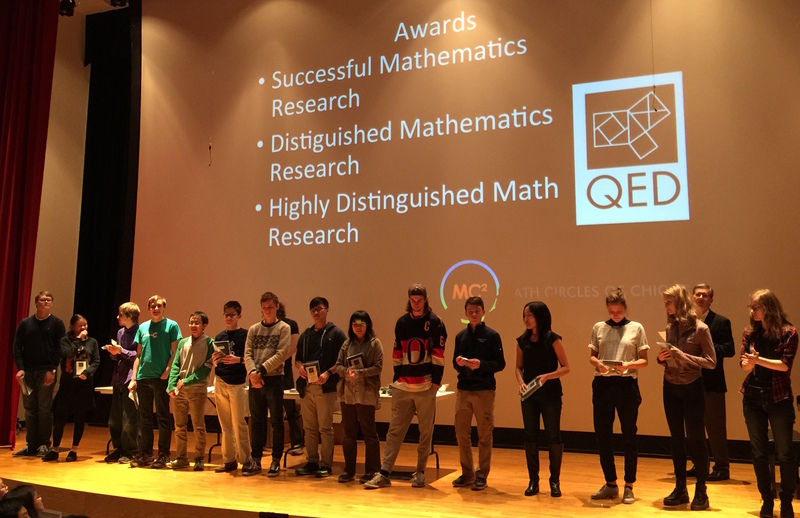 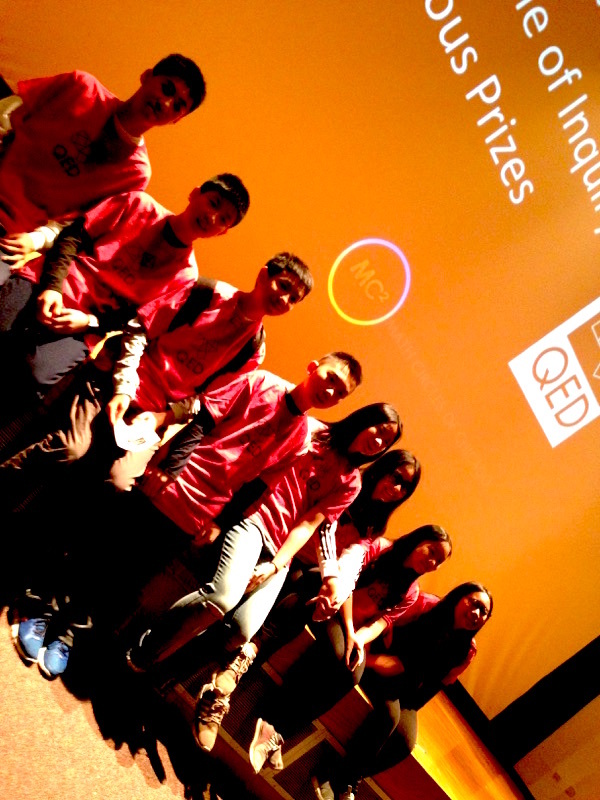 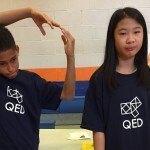 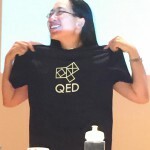 Check out our photo gallery to get a direct view of QED. 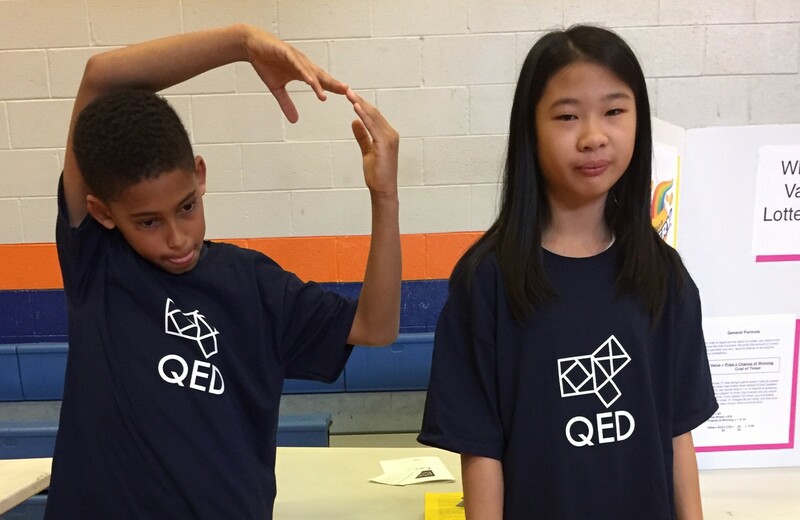 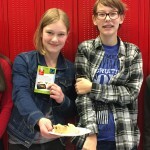 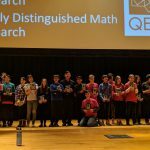 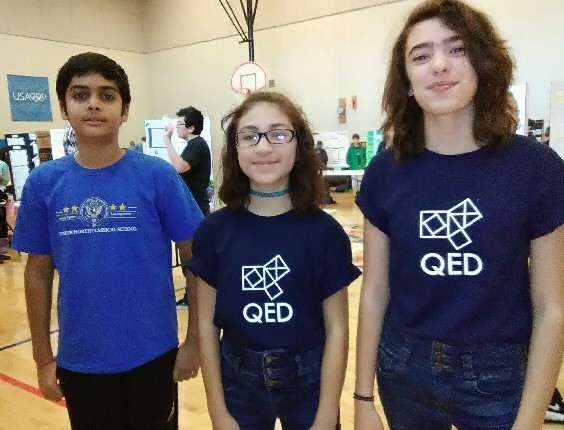 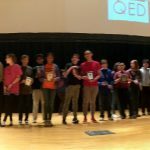 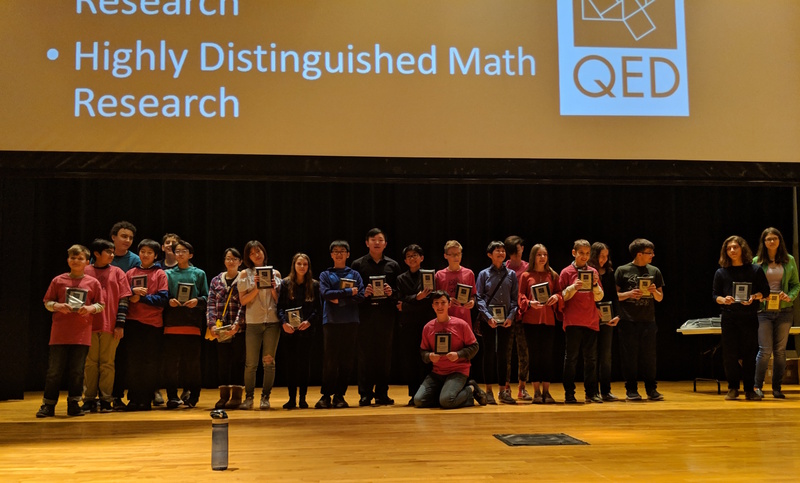 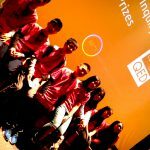 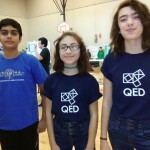 My dream (for the moment) is to have 200 kids attend QED 2017. 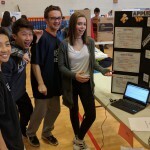 Let us know if you are interested! 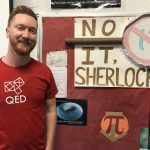 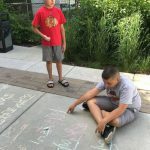 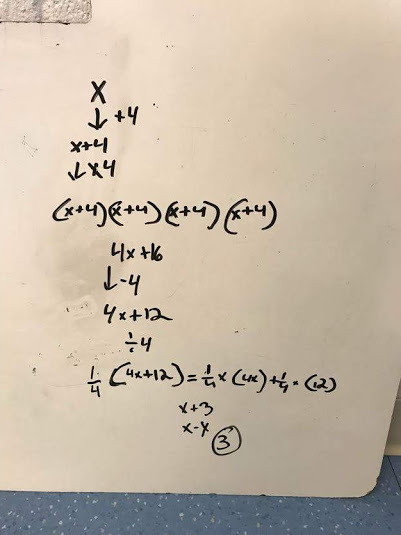 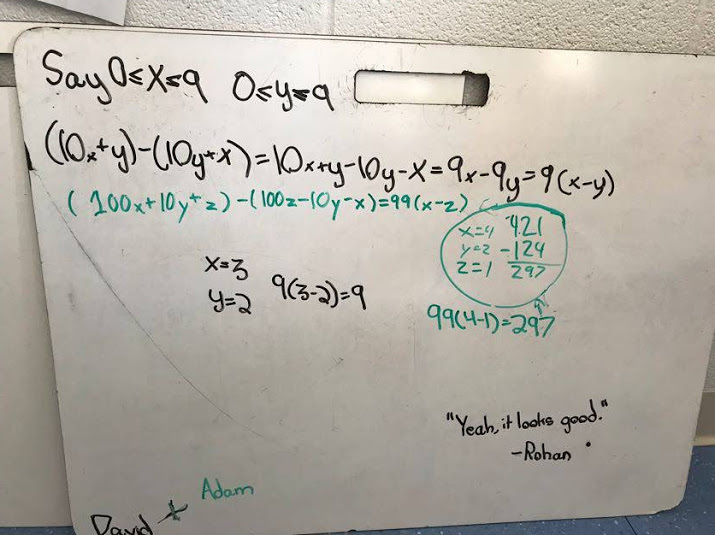 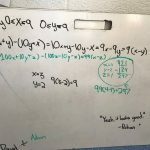 qed@mathcirclesofchicago.org. 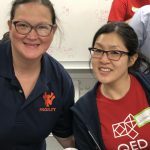 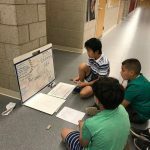 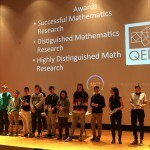 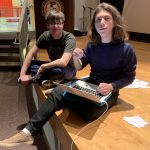 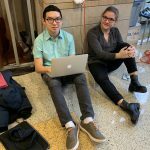 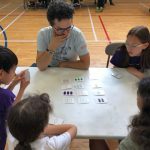 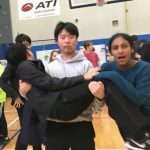 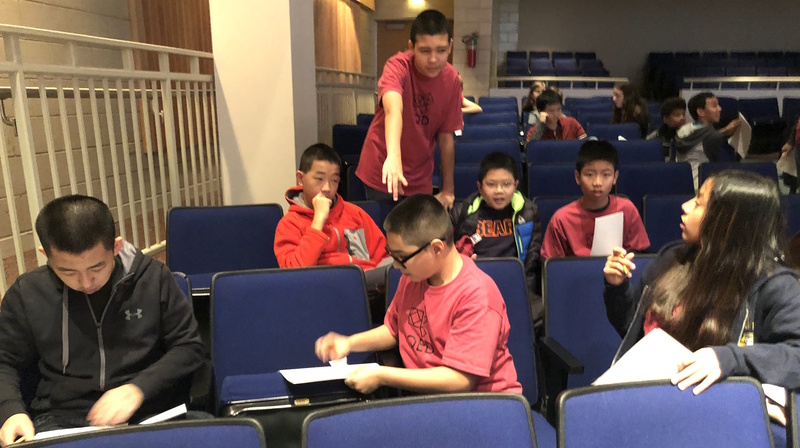 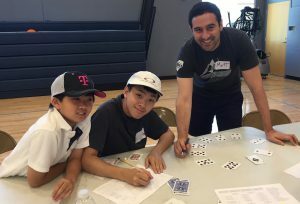 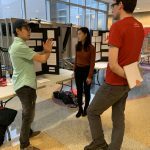 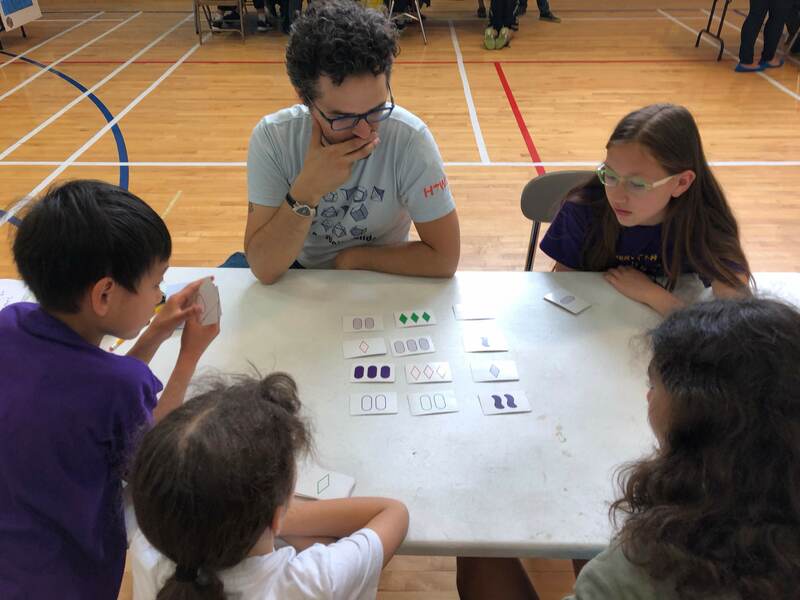 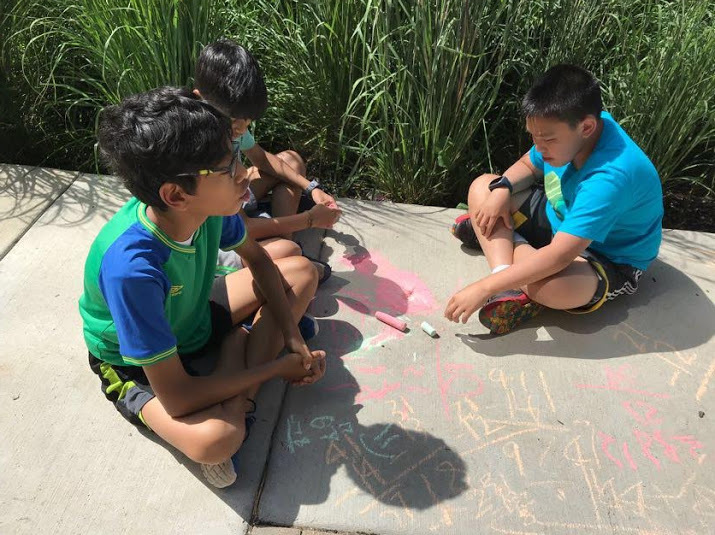 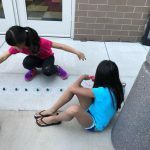 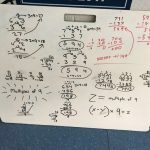 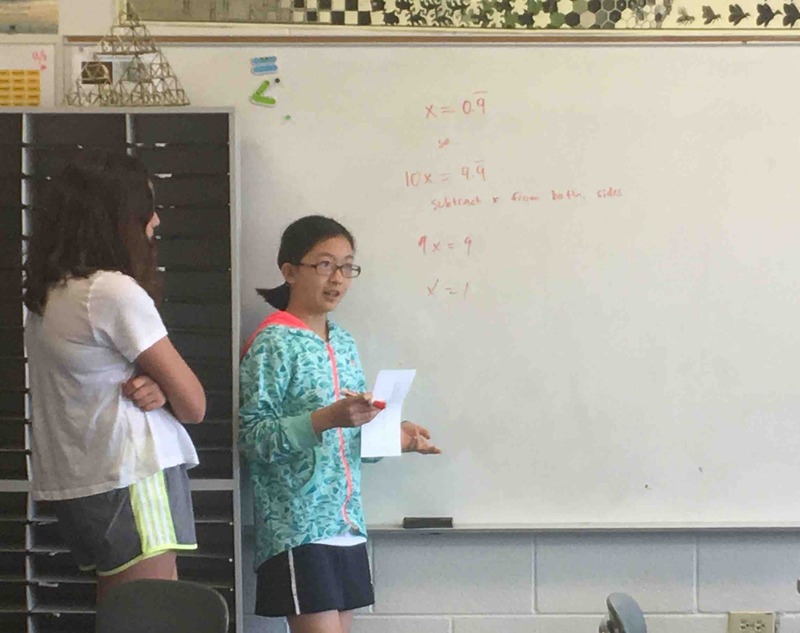 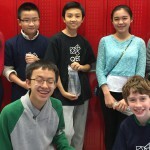 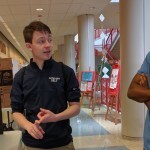 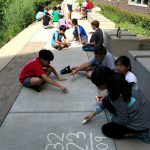 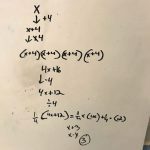 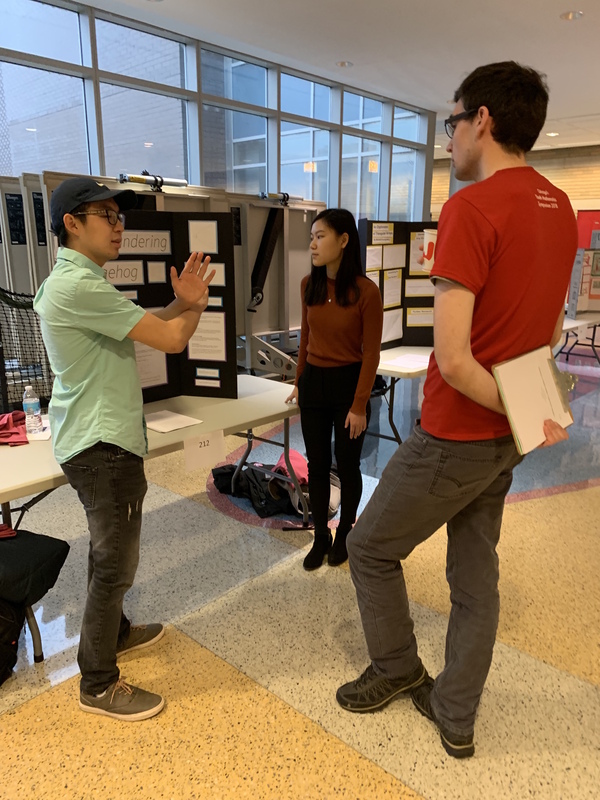 Po-Shen Loh, Associate Professor of Mathematics at Carnegie Mellon University, Coach of the USA International Mathematics Olympiad Team, and founder of expii.com, is coming to Chicago to give a highly anticipated mathematics talk for a general audience. 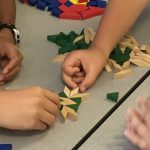 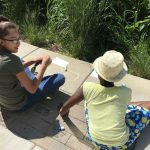 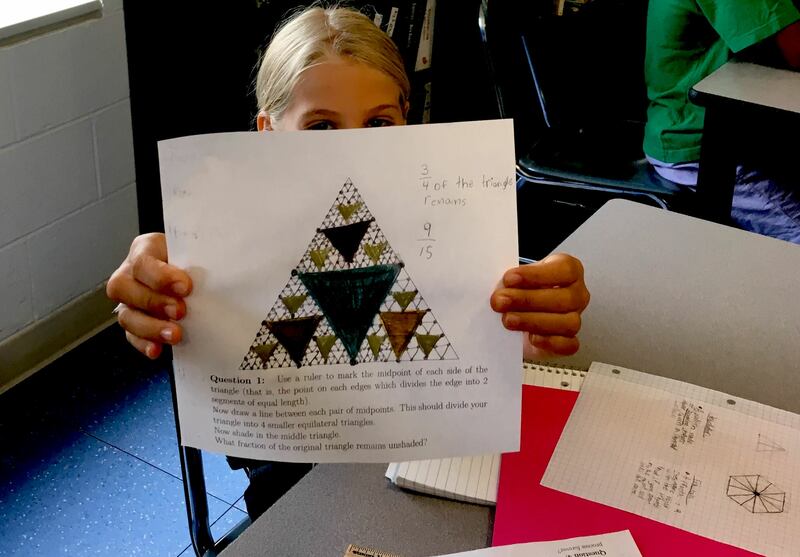 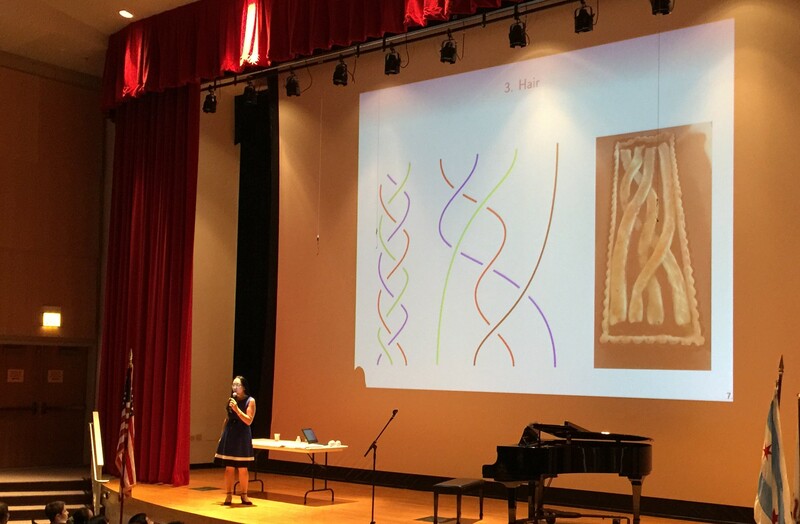 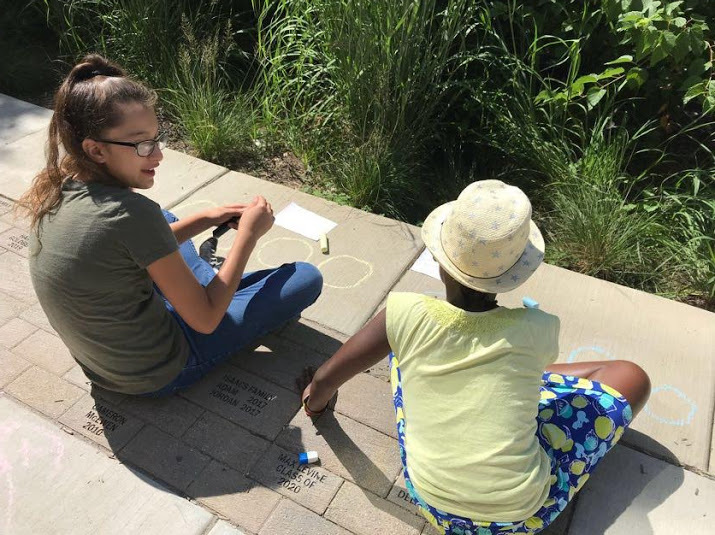 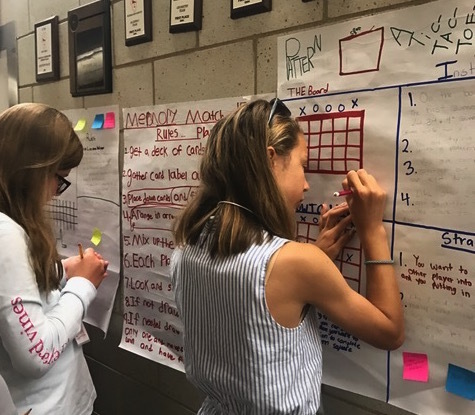 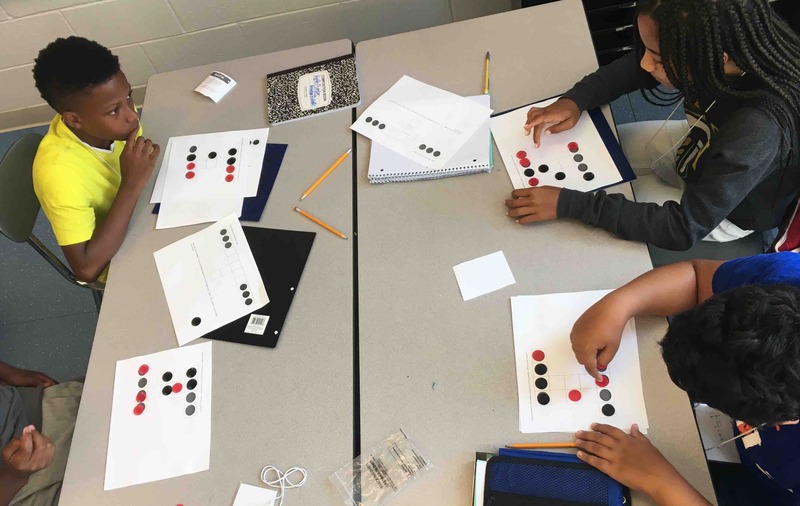 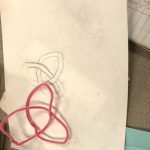 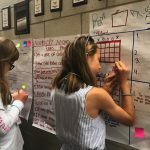 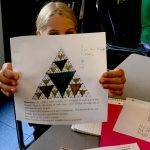 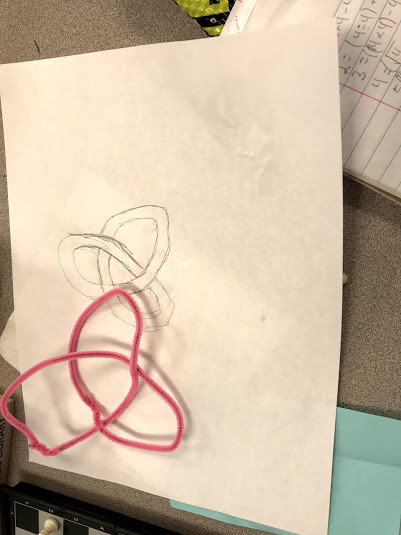 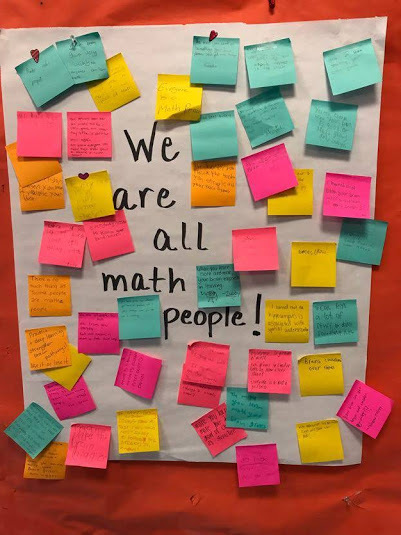 “Math and Creativity” will address puzzles that don’t look mathematical, but ultimately are unlocked by mathematical insights. 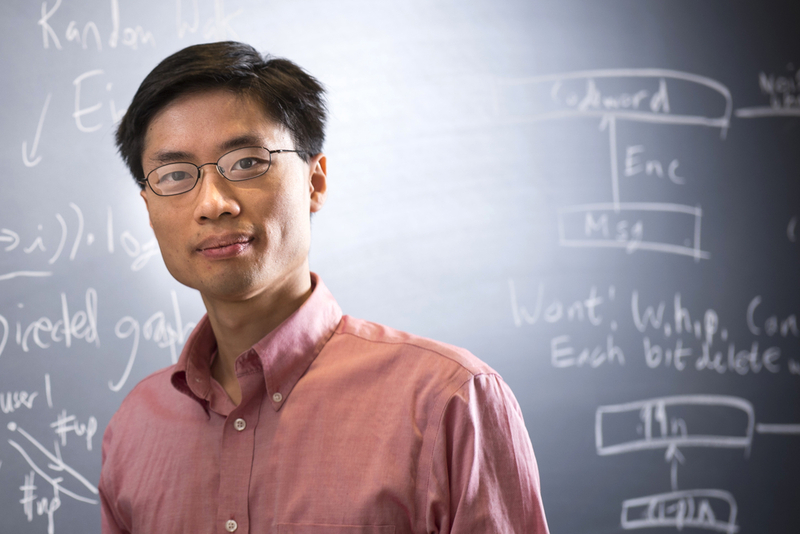 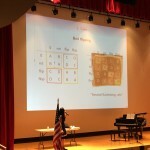 Professor Loh will also talk about how to get the most out of math “competitions”. 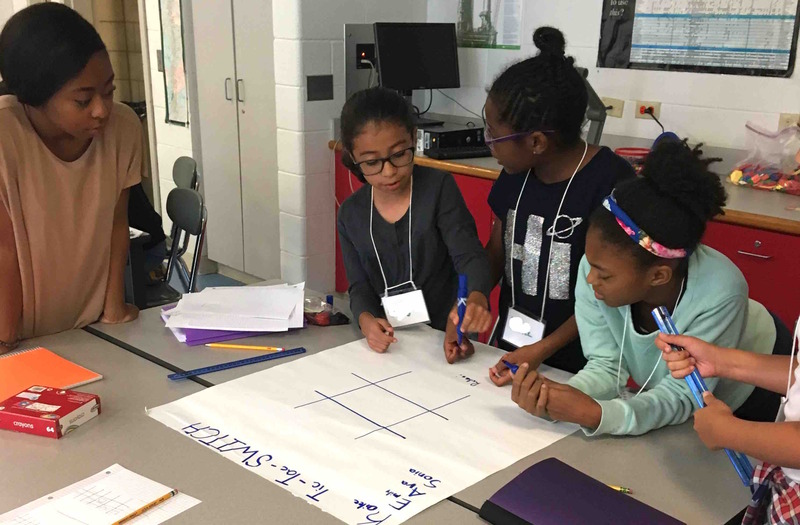 The talk will take place on Saturday, September 17, 2016, at Whitney Young High School from 3:00pm to 5:00pm. 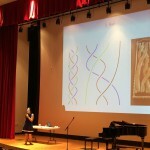 Young’s auditorium is located in the Arts Building, 1431 W Jackson. 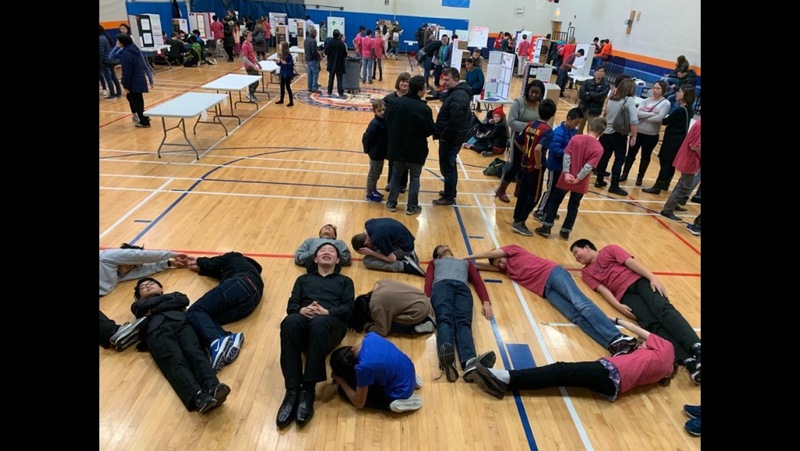 Whitney Young is easily accessible by public transportation (CTA Blue Line Racine stop – Loomis exit, #9 Ashland Bus, #20 Madison Bus, #126 Jackson Bus) and is close to downtown Chicago Metra stations. 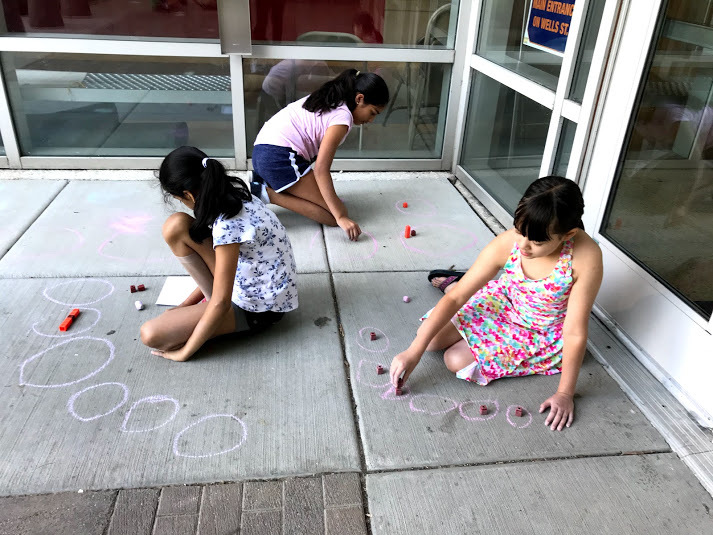 Parking is available in the lots adjacent to the Arts Building. 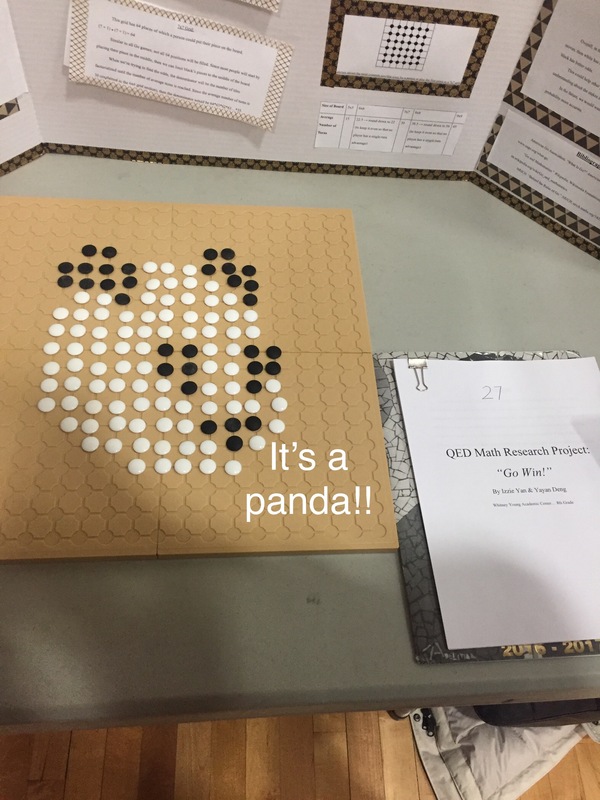 If you’d like, bring materials to do some math during the talk! 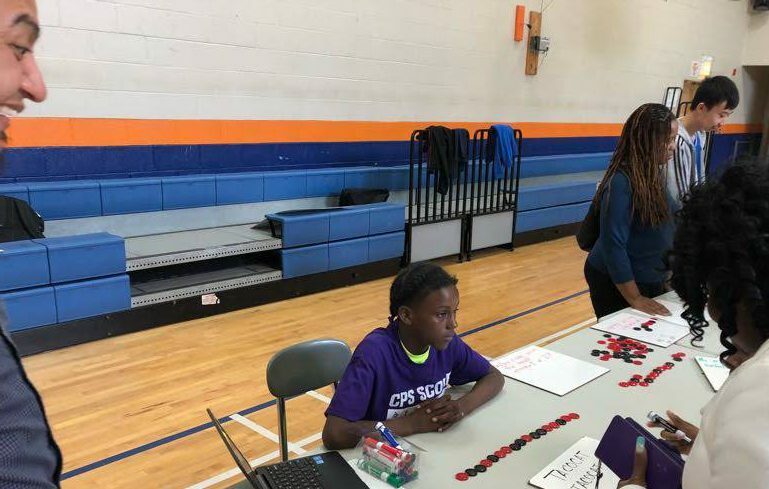 Candy, snacks, and other refreshments will be available for sale. 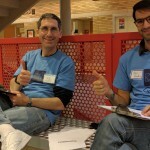 After filling out the survey you will receive a confirmation email that serves as a reservation. 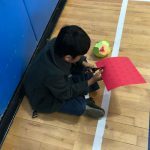 Reservations are on a first come, first serve basis. 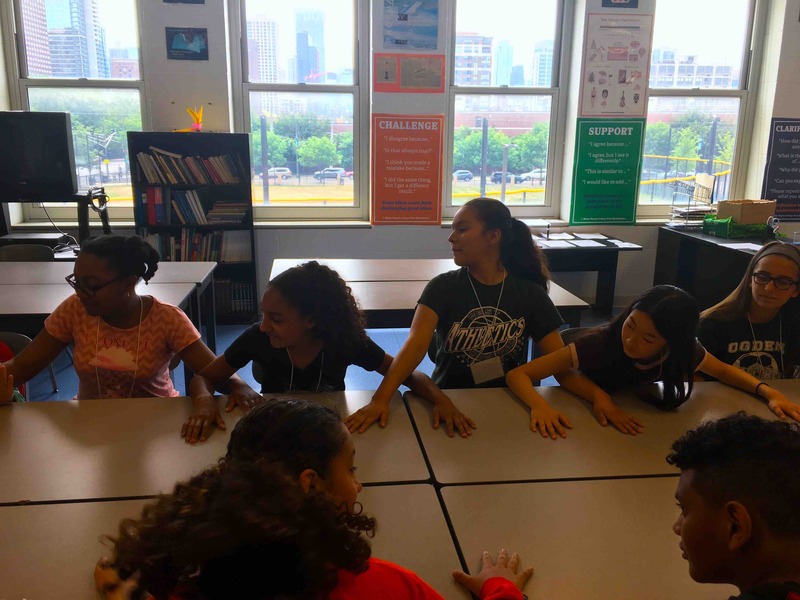 If you have questions, contact Julienne Au at jau@cps.edu.